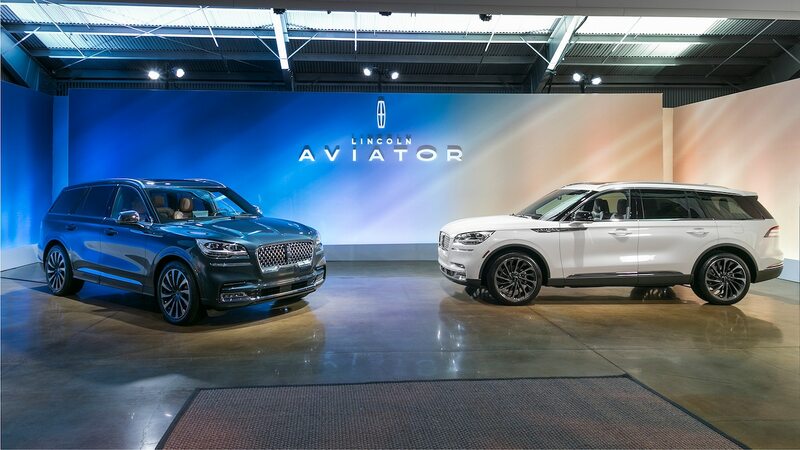 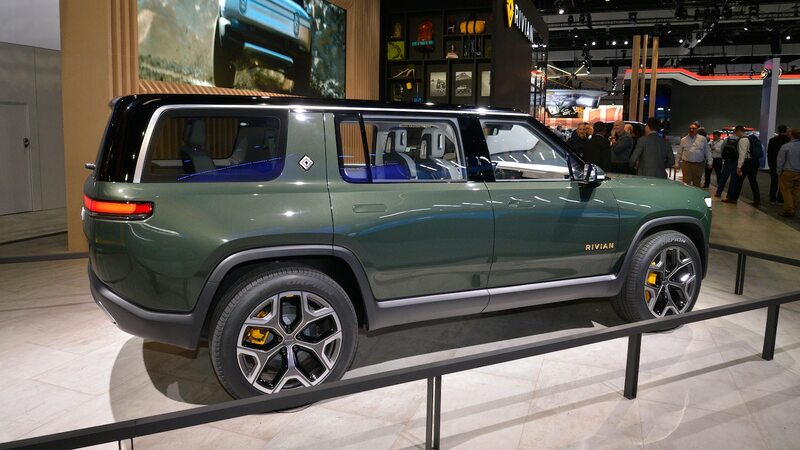 From the Aviator to the Passport and the Palisade, sport utes are hot in L.A.
To no one’s surprise, automakers revealed a large number of SUVs and crossovers at the 2018 L.A. auto show. 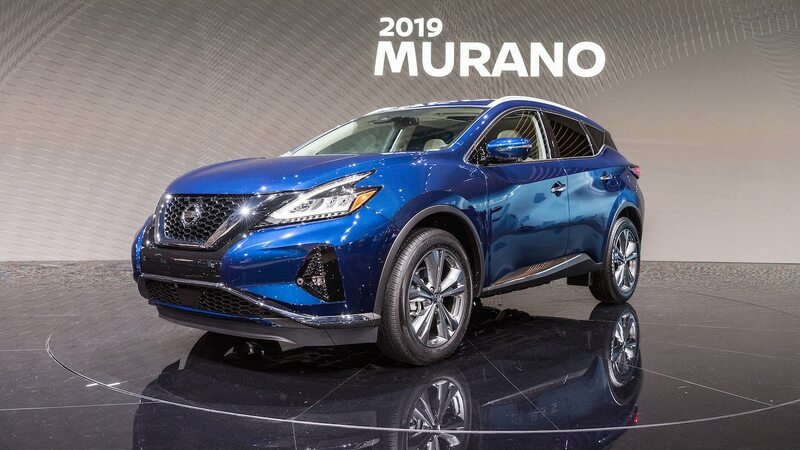 But unlike previous years, about half of the vehicles on this list offer some form of electrification, if they’re not exclusively electric. 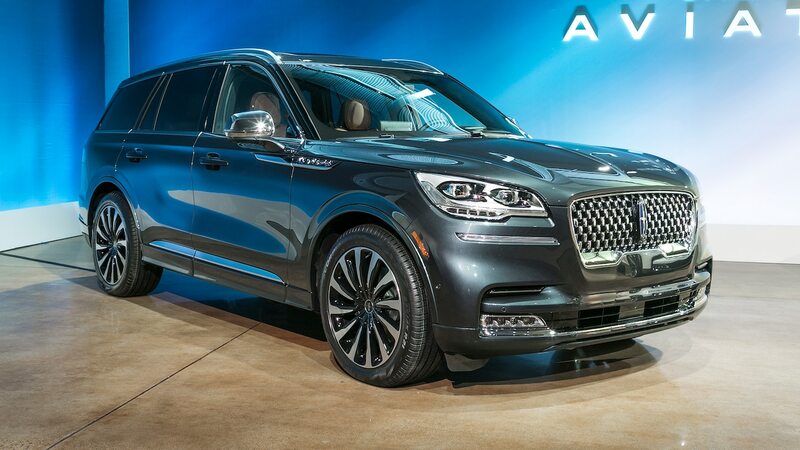 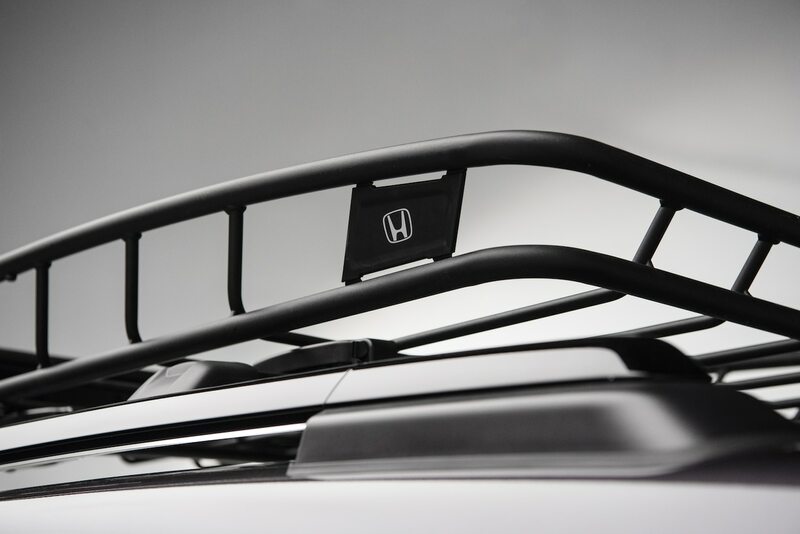 Some automakers revived old SUV nameplates while others introduced all-new, full-size models. 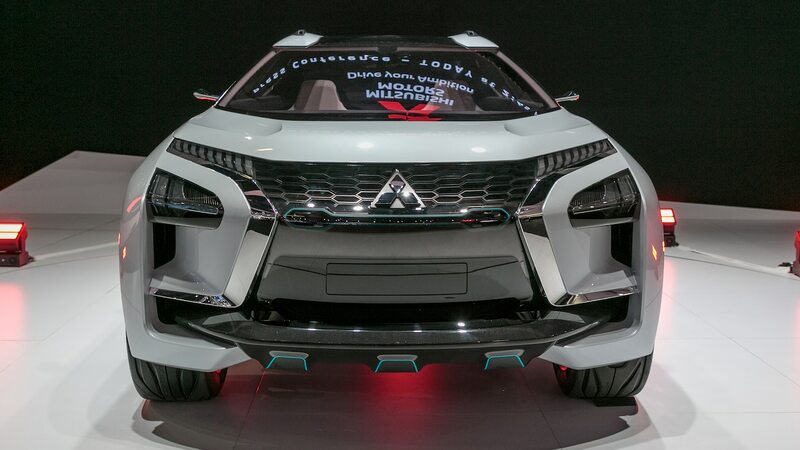 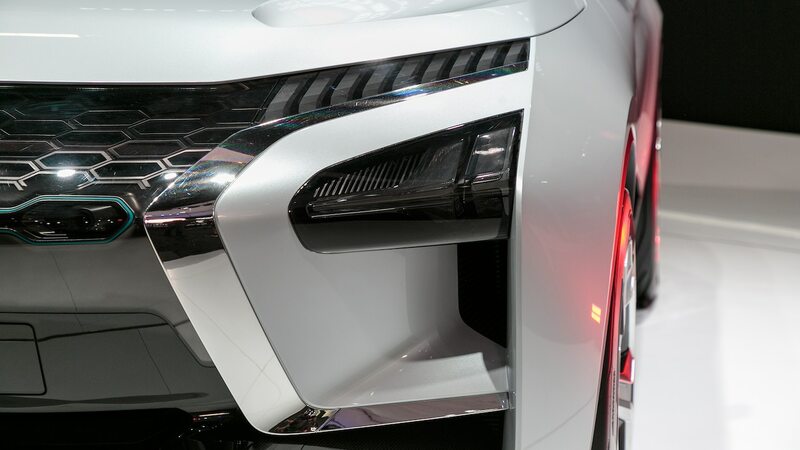 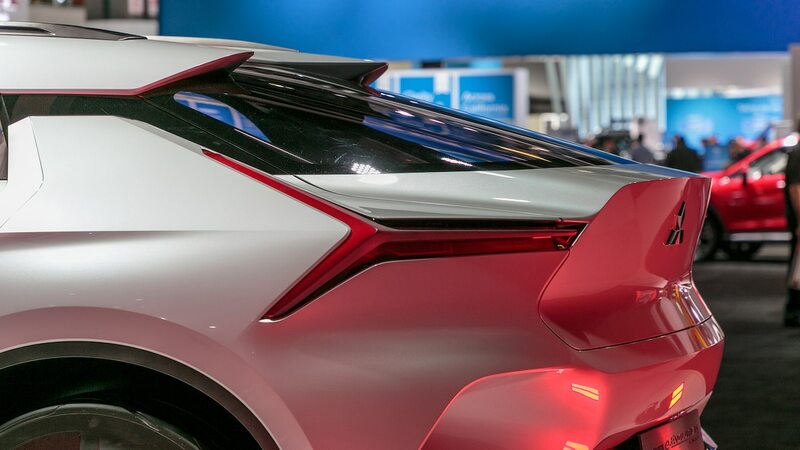 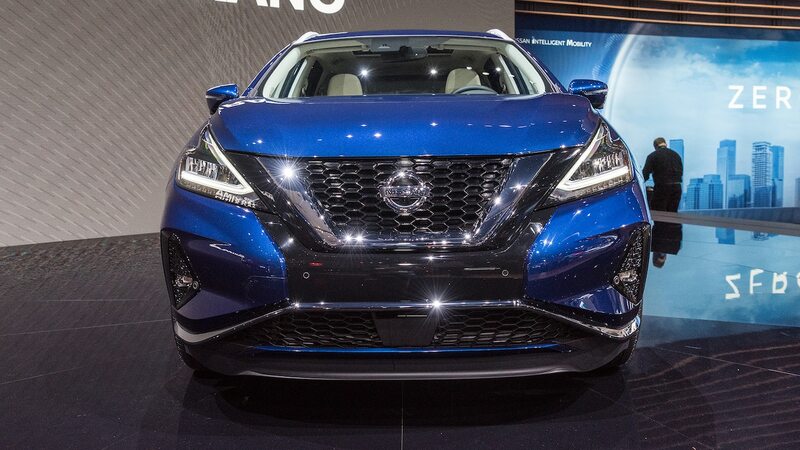 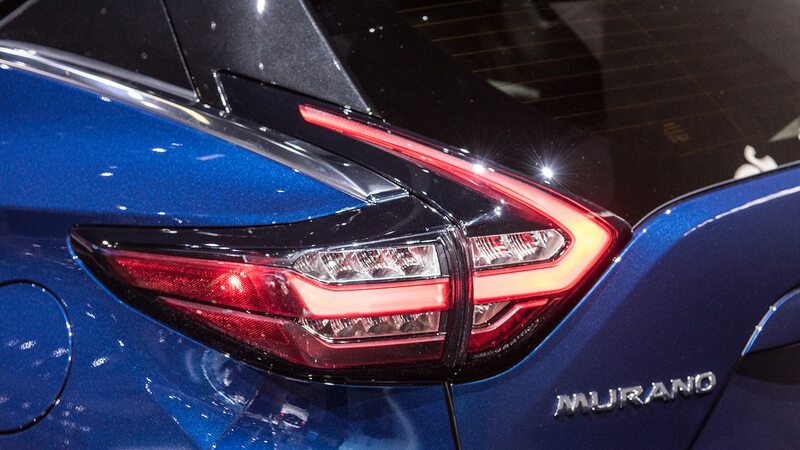 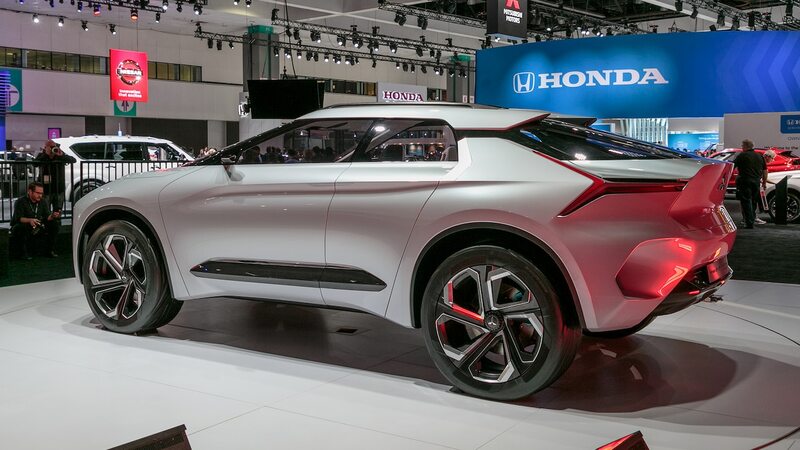 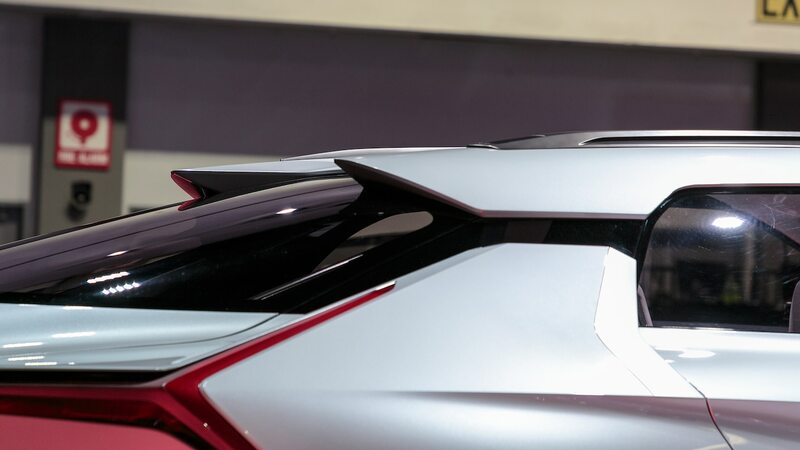 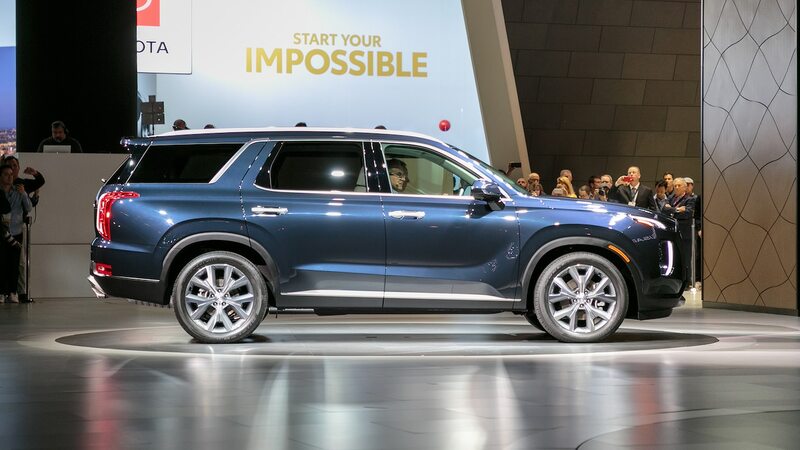 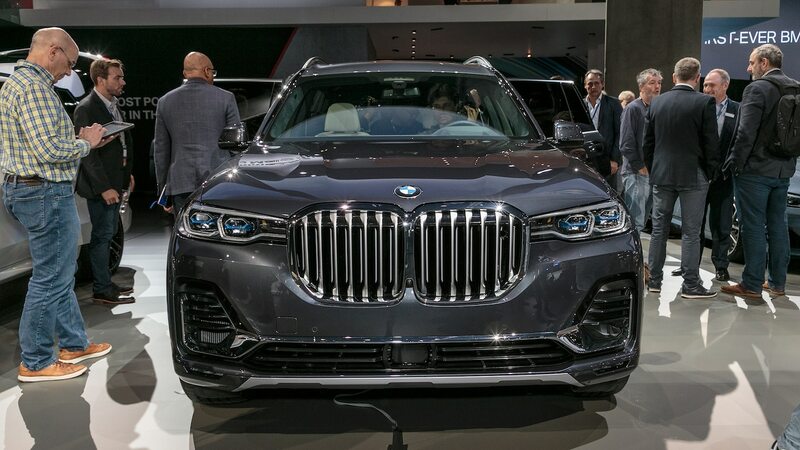 Keep reading to learn about the show’s wide assortment of crossovers and SUVs, from high-tech and luxurious rides to future concepts and affordable models. 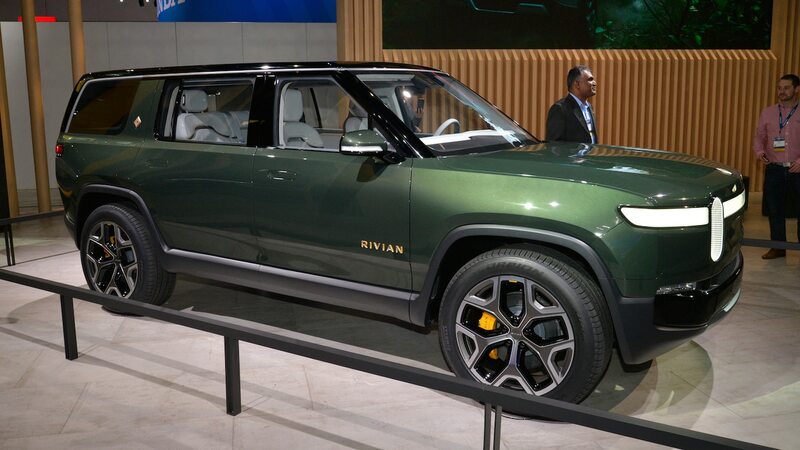 Rivian’s R1S all-electric SUV was developed to compete not only with the Tesla Model X and Jaguar I-Pace, but also with capable and luxurious vehicles like the Range Rover. 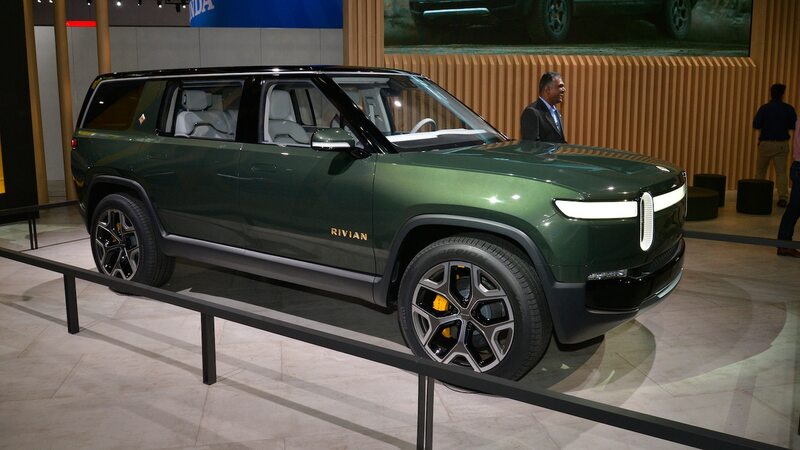 The SUV’s electric powertrain consists of four electric motors and four single-speed transmissions (one for each wheel). 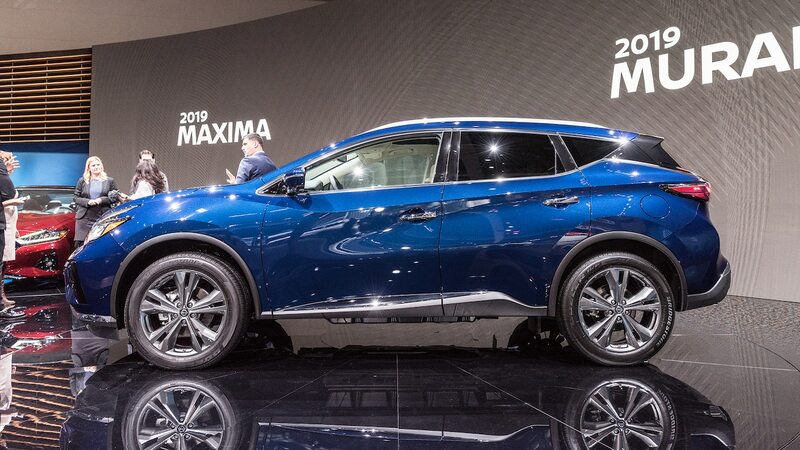 The battery pack comes in three sizes, with the largest MegaPack rated at 180 kilowatt-hours and boasting a claimed driving range of more than 410 miles (660 km). 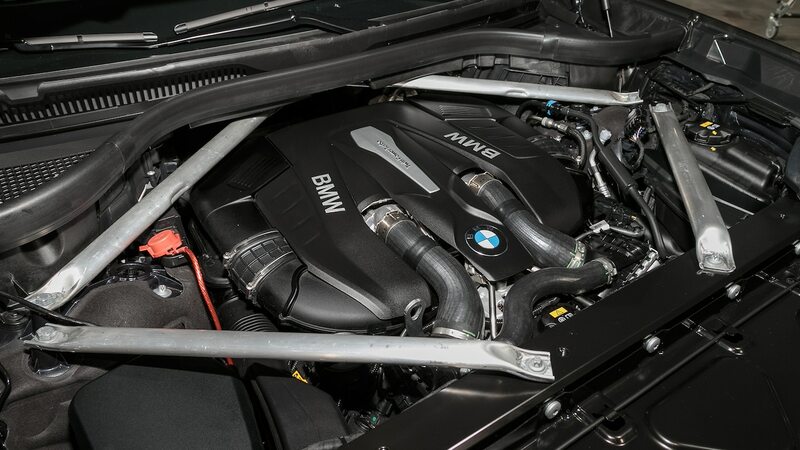 The two smaller packs are 135- and 105-kW-hr units, with estimated ranges of 310-plus and 240-plus miles (500-plus and 380-plus km), respectively. 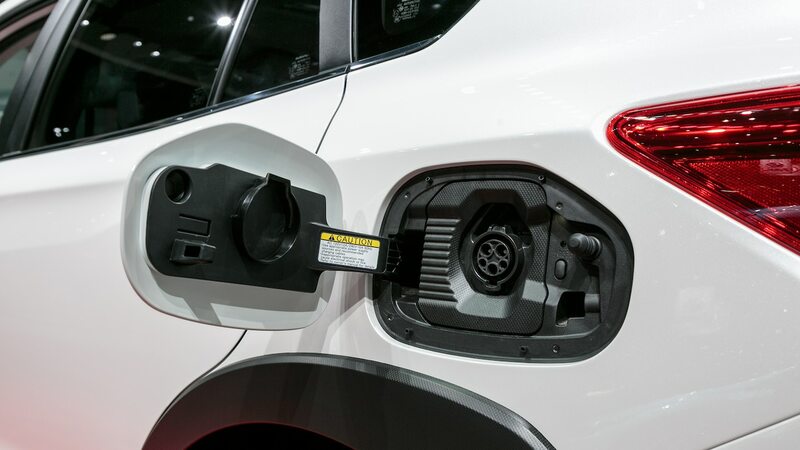 Tesla’s current largest battery pack is rated at 100 kW-hr. 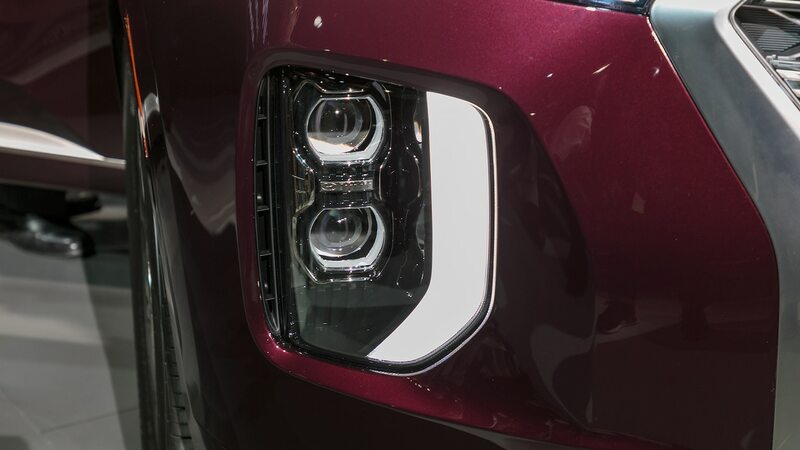 Power outputs are impressive. 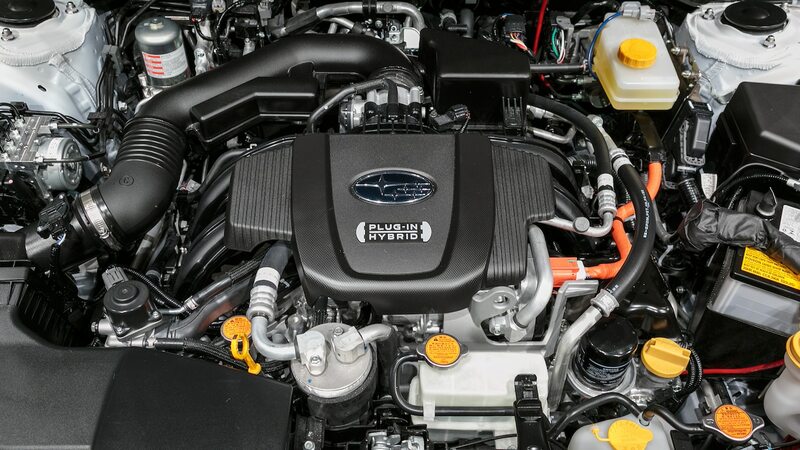 Choosing the largest battery nets 700 hp, while the mid-level pack, which focuses more on performance, gets you 754 hp. 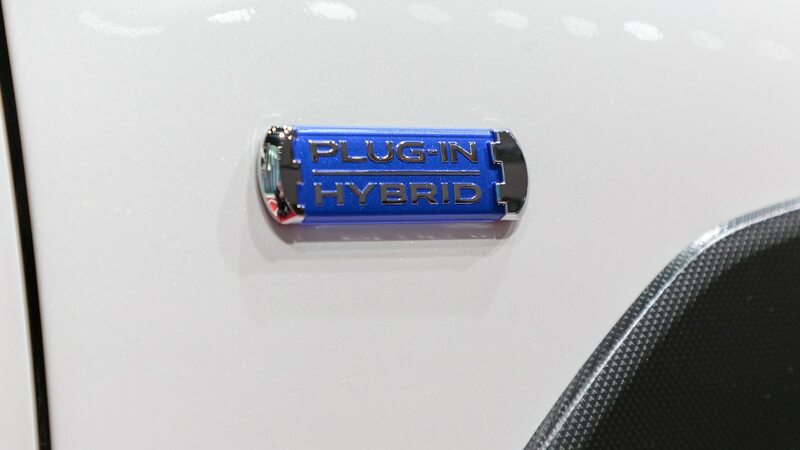 Going with the smallest battery isn’t much of a penalty, either, as power is rated at a still-generous 402 hp. 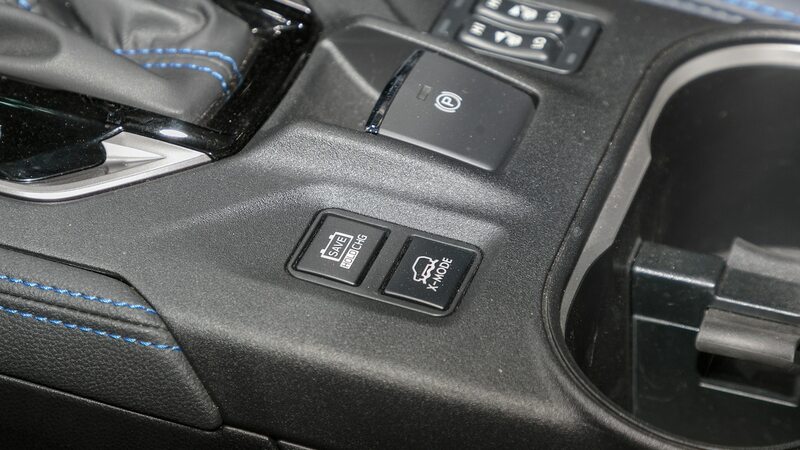 With that kind of power on tap, you can expect acceleration to be brisk. 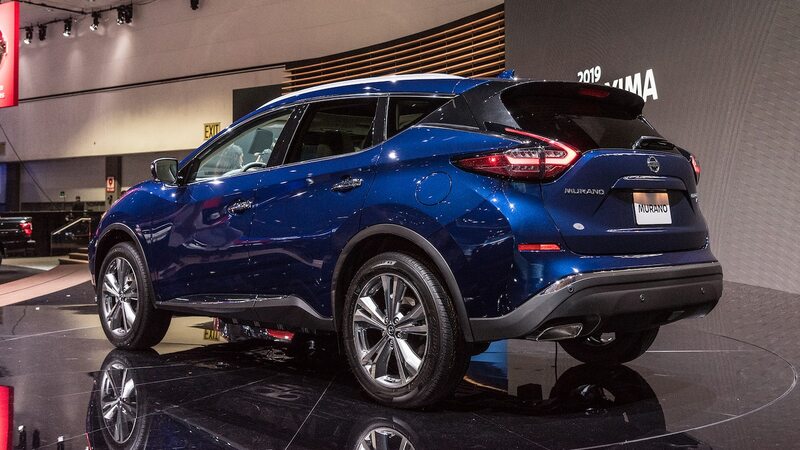 The MegaPack model is estimated to hit 60 mph in just 3.2 seconds, while the mid-level battery is said to do it in 3.0 seconds flat. 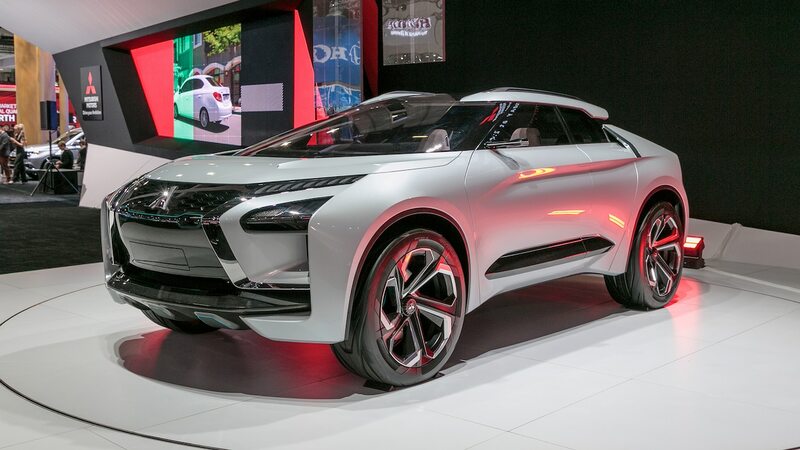 A still-quick 5.0 seconds is predicted for the smallest battery. 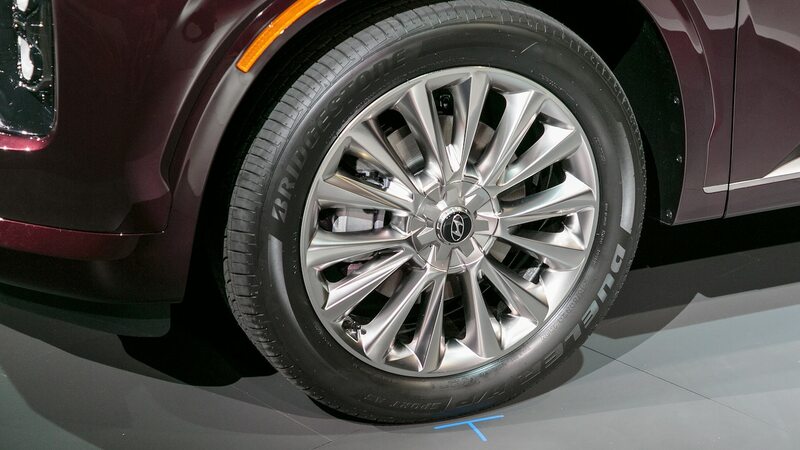 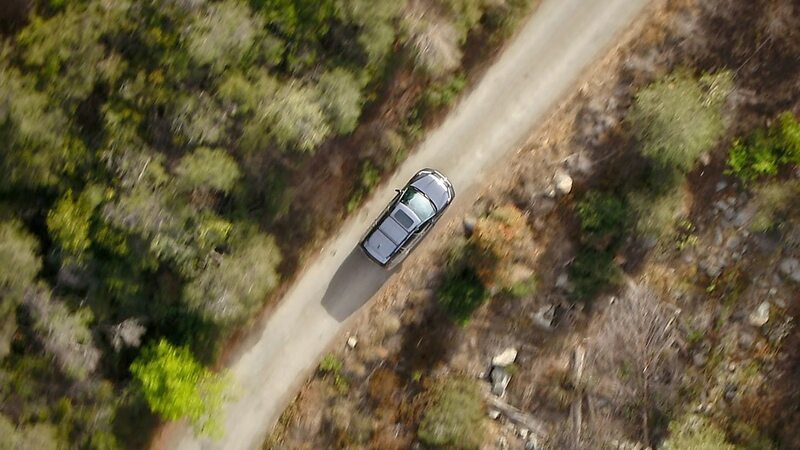 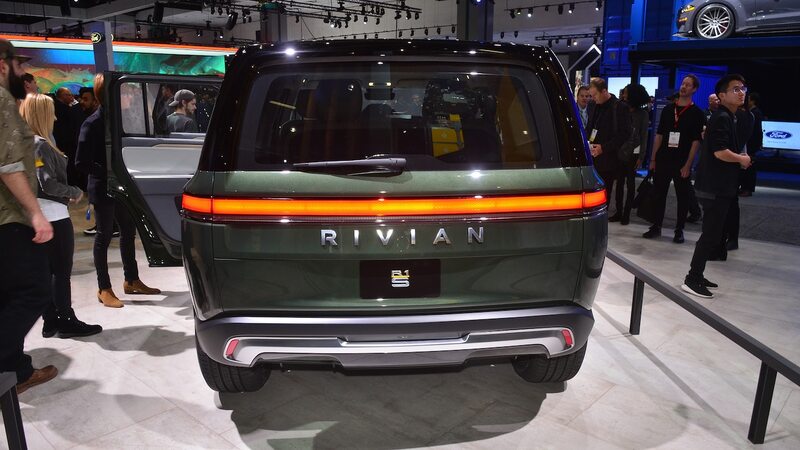 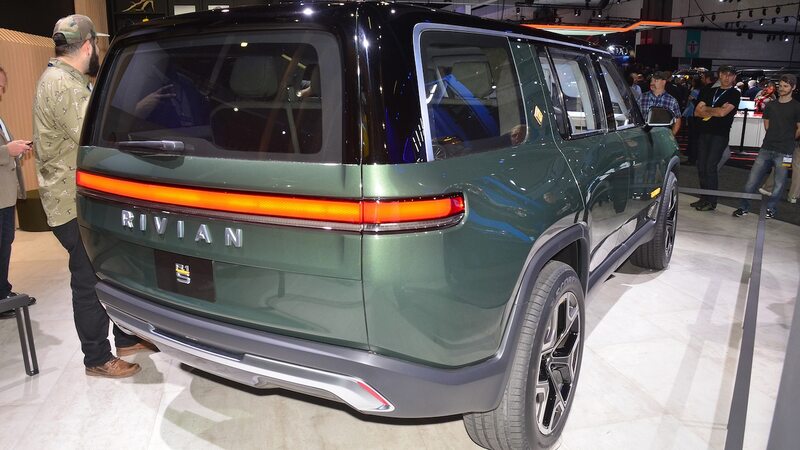 Capability is also notable, as Rivian claims to offer higher maximum ground clearance, deeper fording depth, and better approach, departure, and breakover angles than the Range Rover. 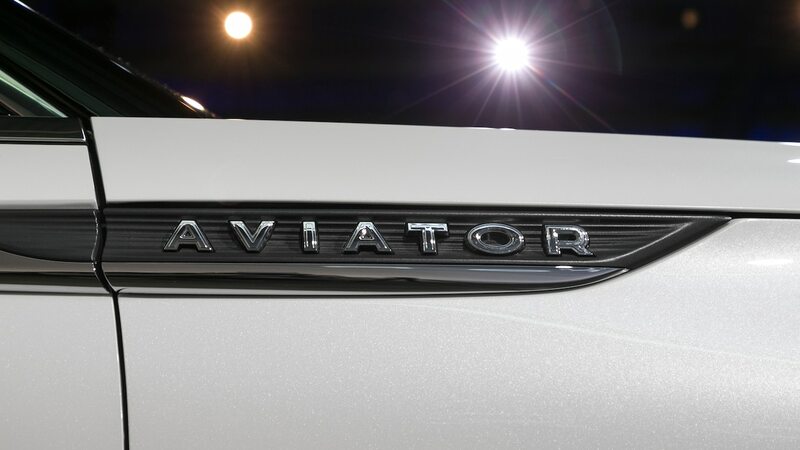 The Aviator is back, and just like its larger Navigator sibling, it packs lots of power, luxury, and tech. 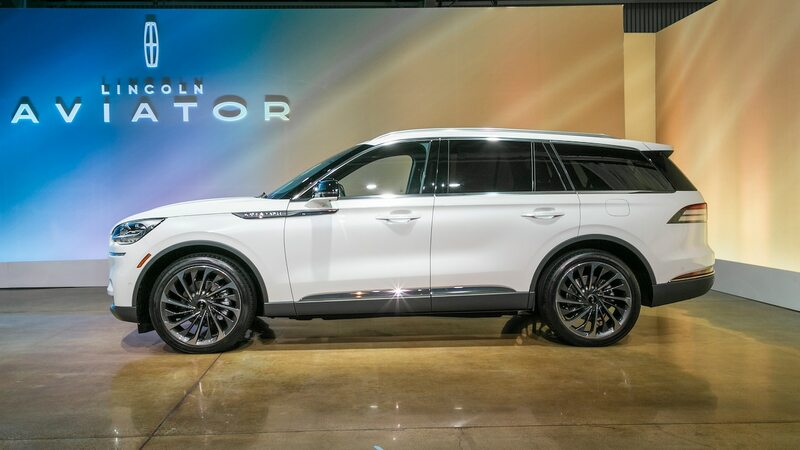 But unlike its big brother, the three-row Aviator will be offered with a traditional gasoline engine and an optional plug-in hybrid powertrain that produces 450 hp and a massive 600 lb-ft of torque in the Grand Touring model. 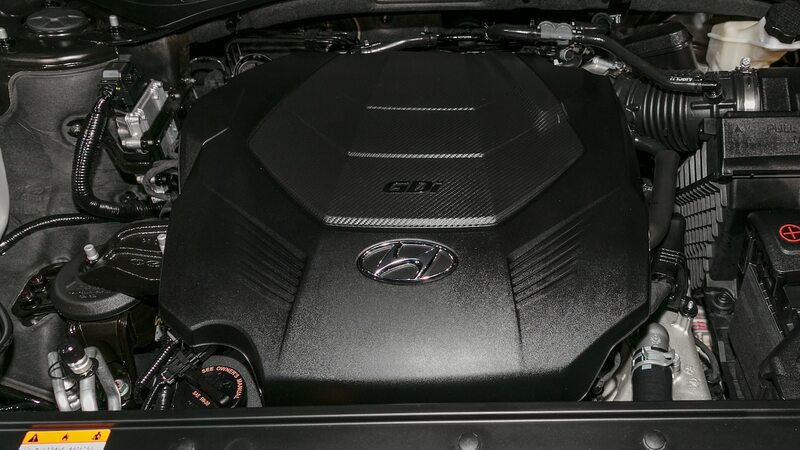 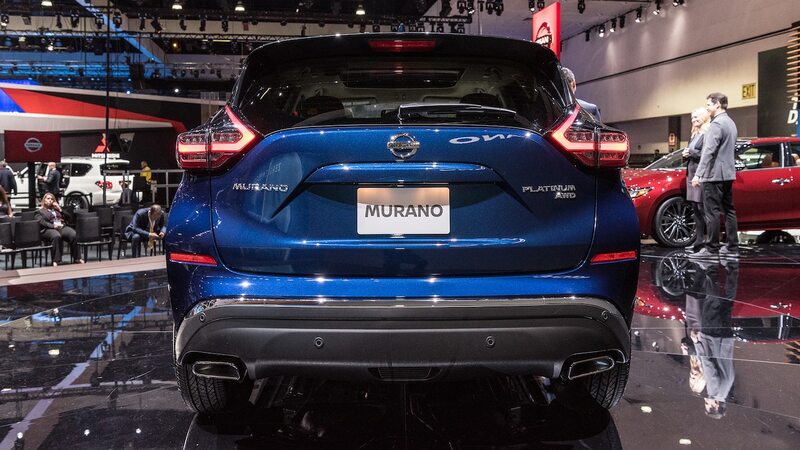 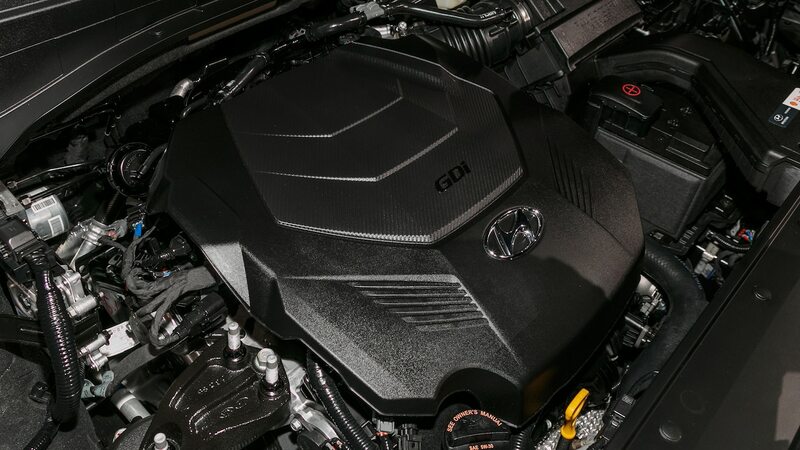 The non-hybrid engine is a 3.0-liter twin-turbo V-6 that pumps out a potent 400 hp and 400 lb-ft. New technology includes the Phone As A Key feature that allows owners to lock or unlock the doors, open the liftgate, or start the vehicle using a compatible smartphone. 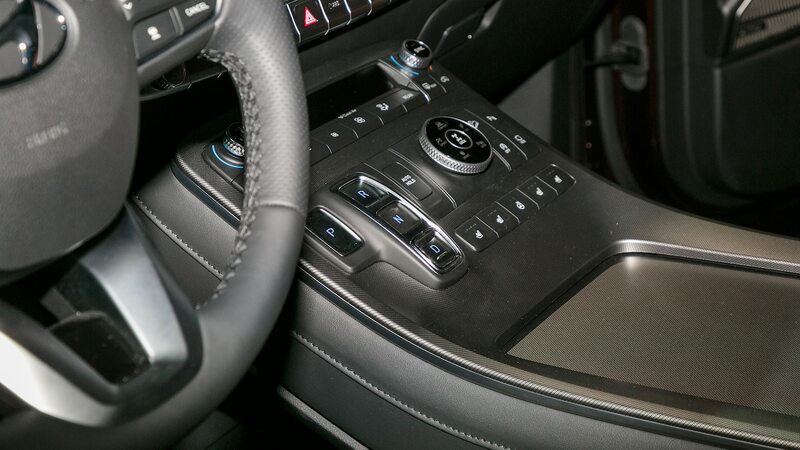 The feature doesn’t require the driver to have a traditional key fob on them. 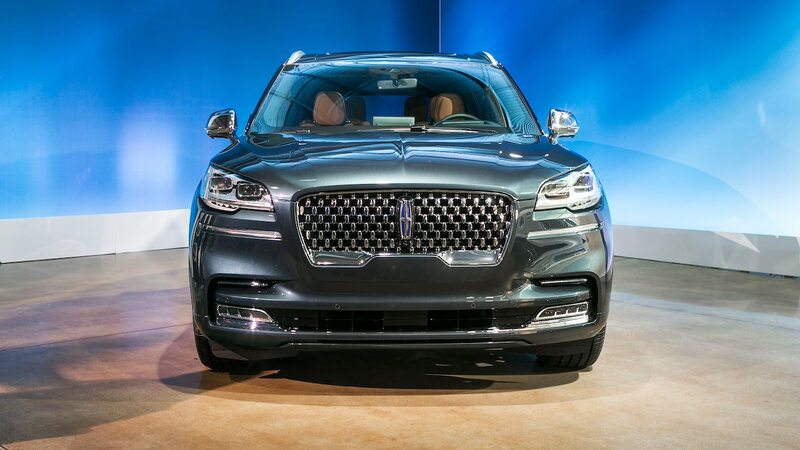 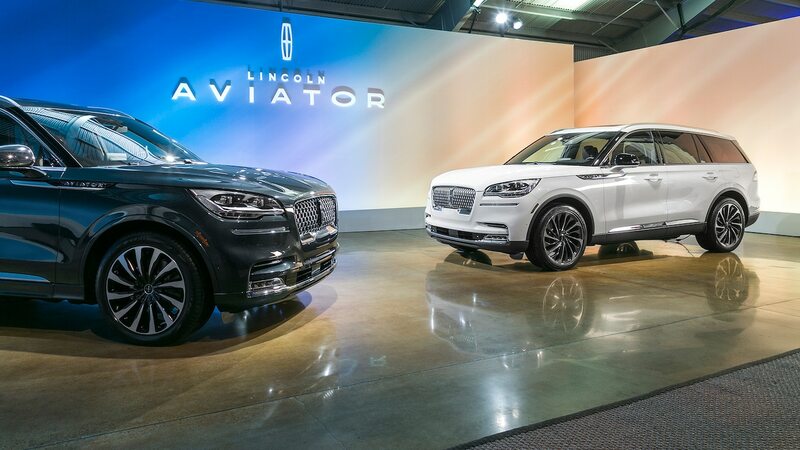 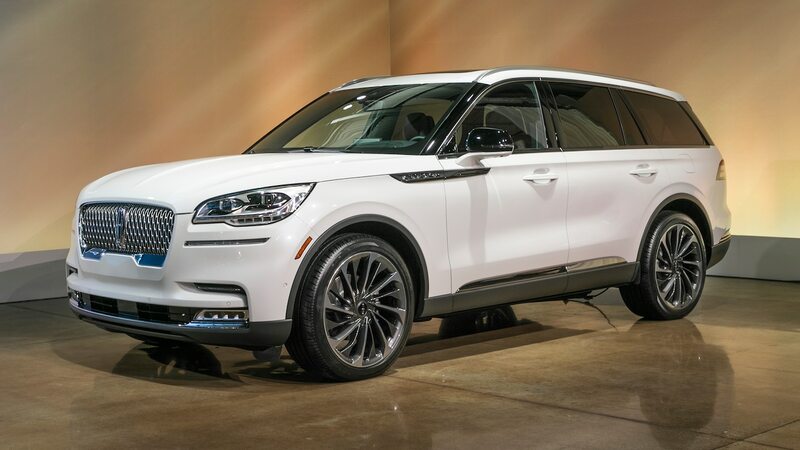 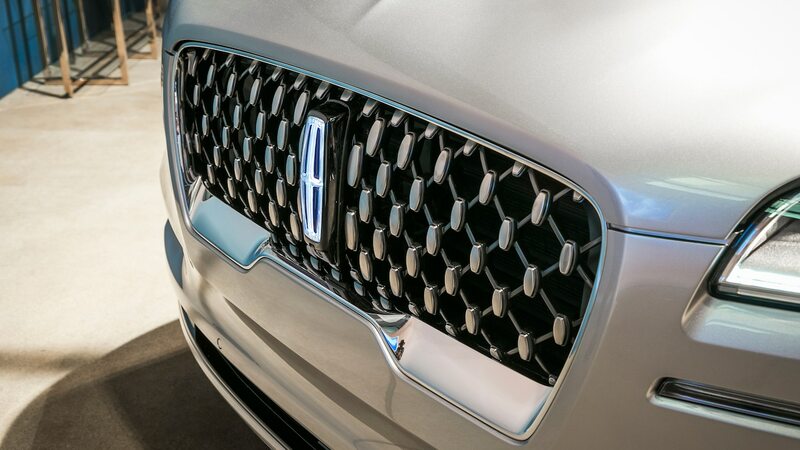 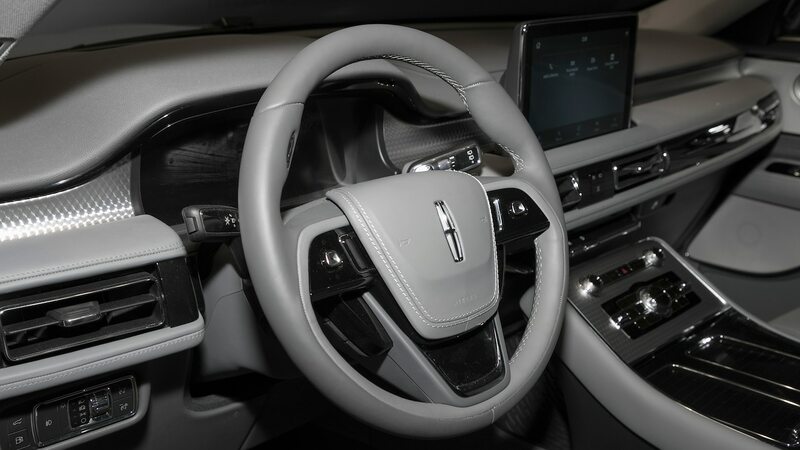 The Lincoln Co-Pilot 360 suite of driver-assist features is standard, and audiophiles should enjoy the optional 28-speaker Revel Ultima 3D audio system. 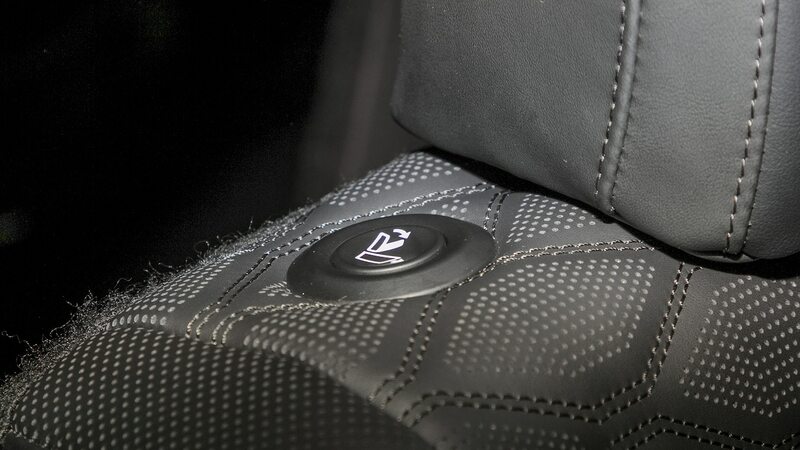 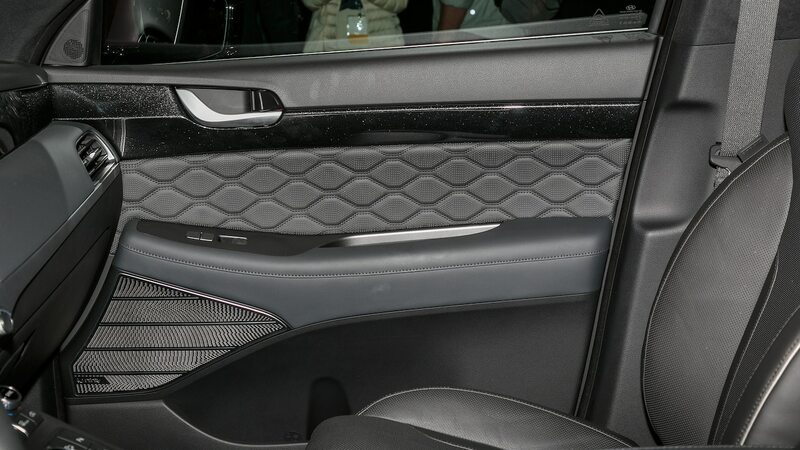 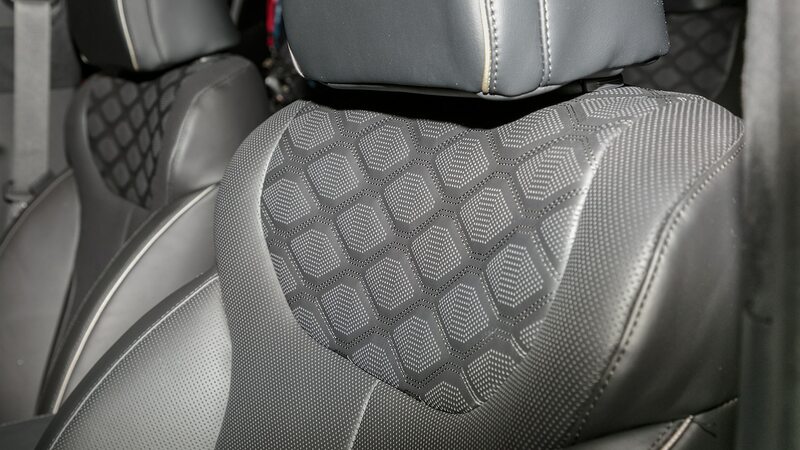 The uber-luxurious Black Label trim comes in Flight, Chalet, and Destination interior color and accent themes. 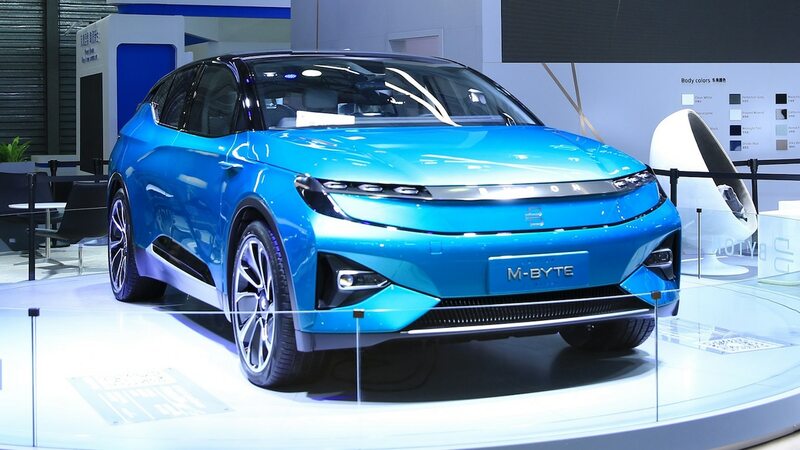 Byton is a Chinese startup company that showed two all-electric concepts in L.A., the K-Byte sedan and the M-Byte SUV. 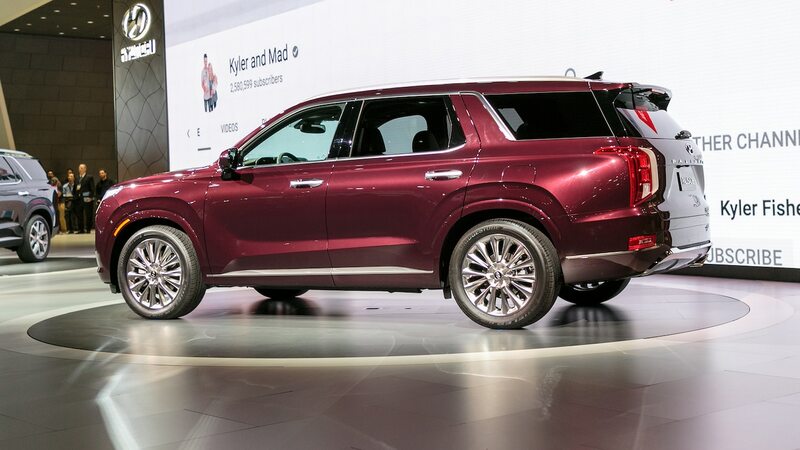 The SUV will be offered in a single-motor, rear-drive model with a 71-kW-hr battery pack and a claimed driving range of 248 miles (400 km). 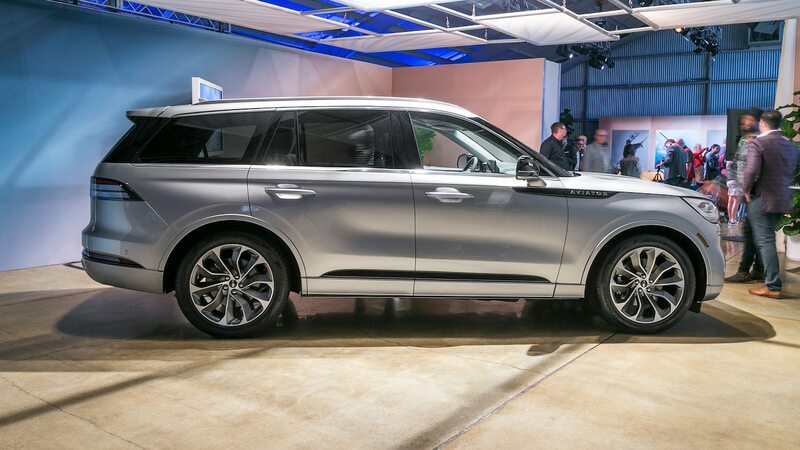 The all-wheel-drive model uses dual motors and boasts a 323-mile (520-km) driving range when equipped with the optional 95-kW-hr battery pack, according to Byton. 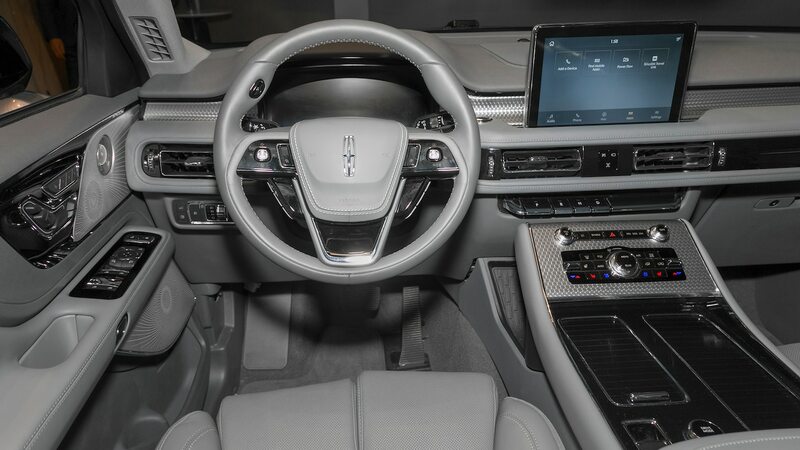 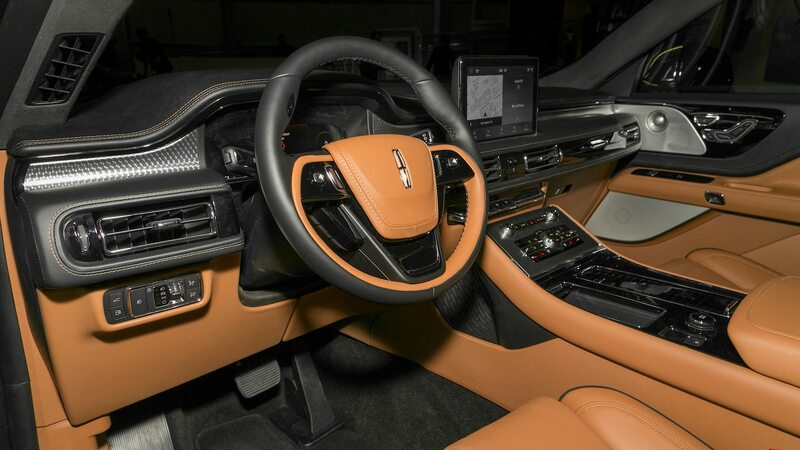 However, the big news is the lounge-like interior that features a massive 49-inch widescreen, a tablet-sized touchscreen in the center of the steering wheel, and two screens for the rear passengers. 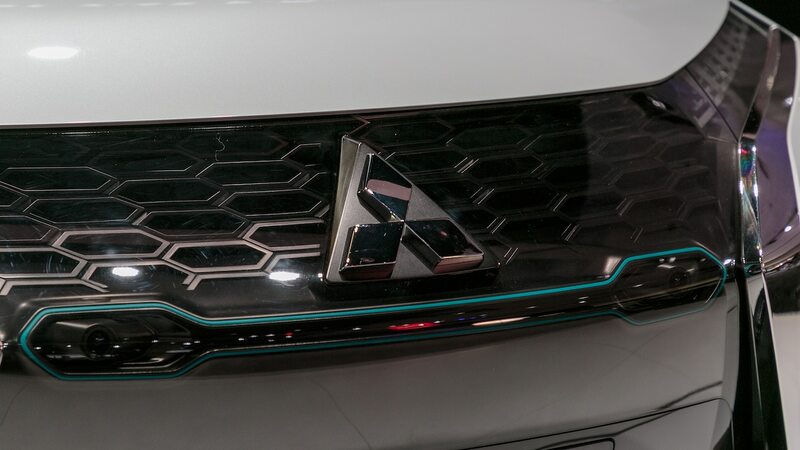 Face recognition cameras, Level 3 autonomous capability, an Amazon Alexa voice control system, and 5G data speeds are just some of the high-tech features the M-Byte will offer. 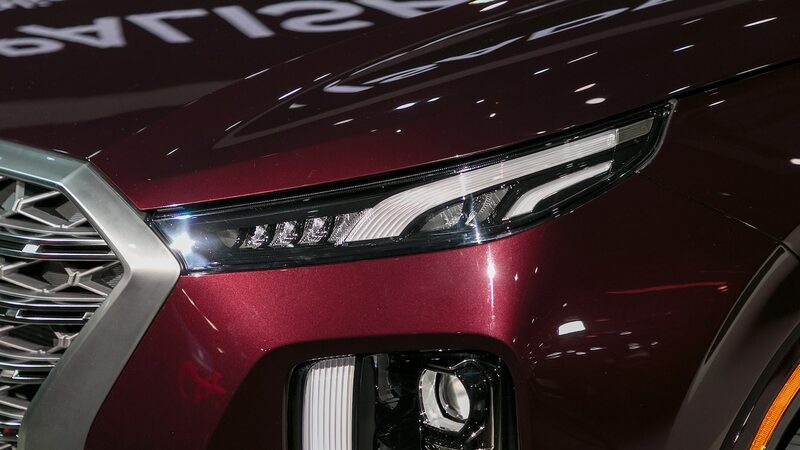 Byton claims the midsize SUV will start at about $45,000 USD and should go on sale in the North America by 2020. 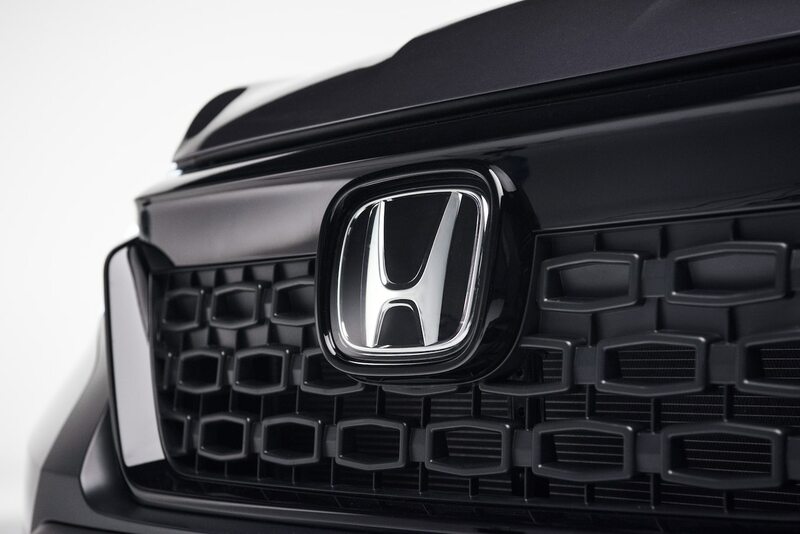 A nameplate popular in the ’90s returns for 2019. 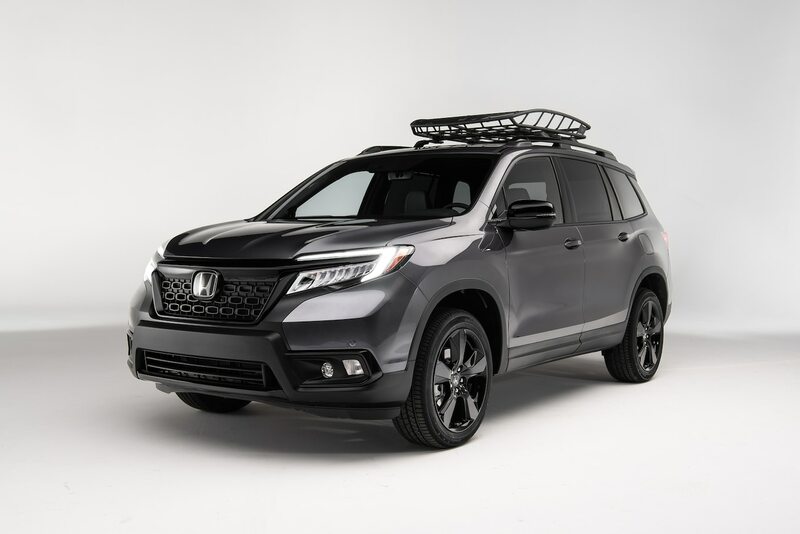 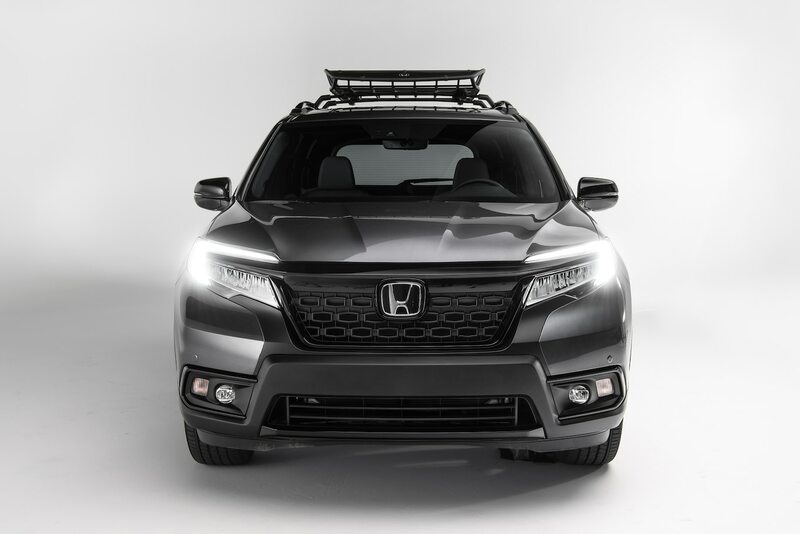 Filling the space between the two-row CR-V and the three-row Pilot, the Passport is a two-row, five-passenger crossover based on Honda’s Global Light Truck platform shared with the Pilot and Ridgeline truck—unlike the CR-V’s compact platform shared with sedans. 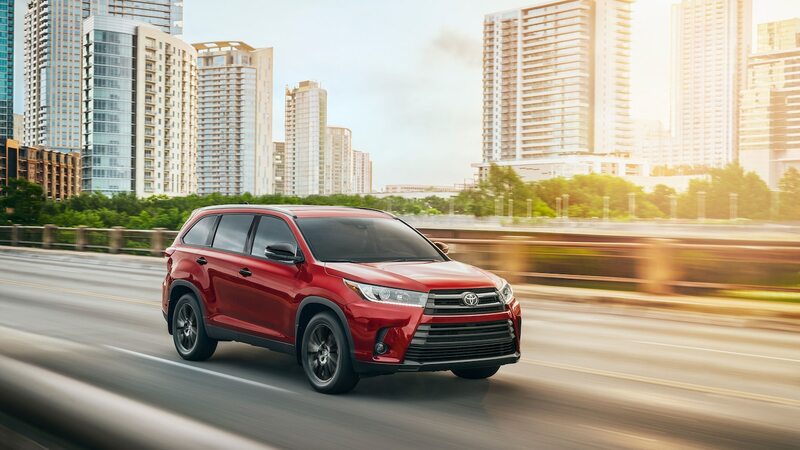 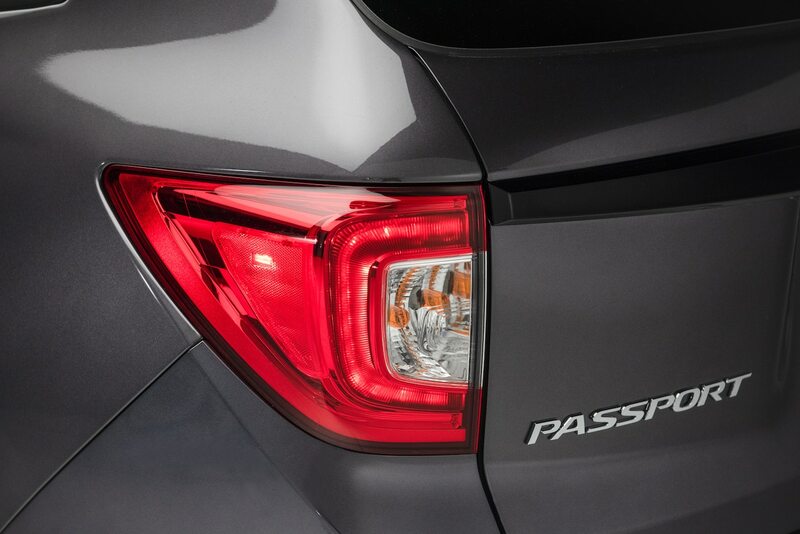 The Passport utilizes the same 280-hp, 262-lb-ft 3.5-liter V-6 engine found in the Pilot and comes in front- or all-wheel drive. 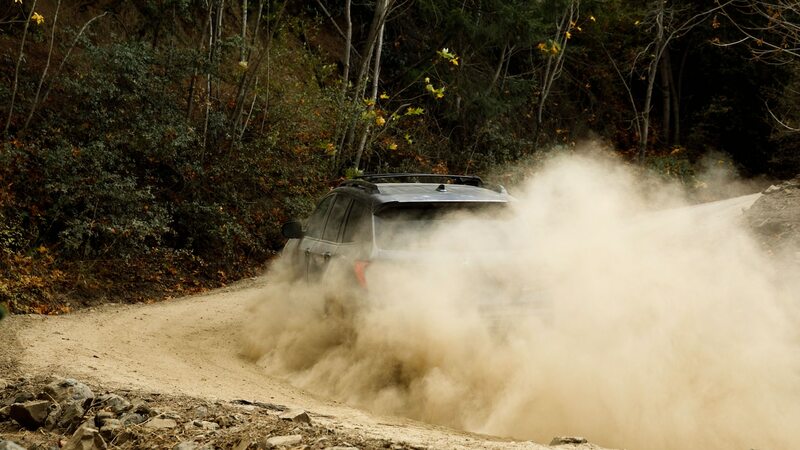 The latter uses the automaker’s Intelligent Variable Management AWD system (i-VM4) with Normal, Sand, Snow, and Mud modes. 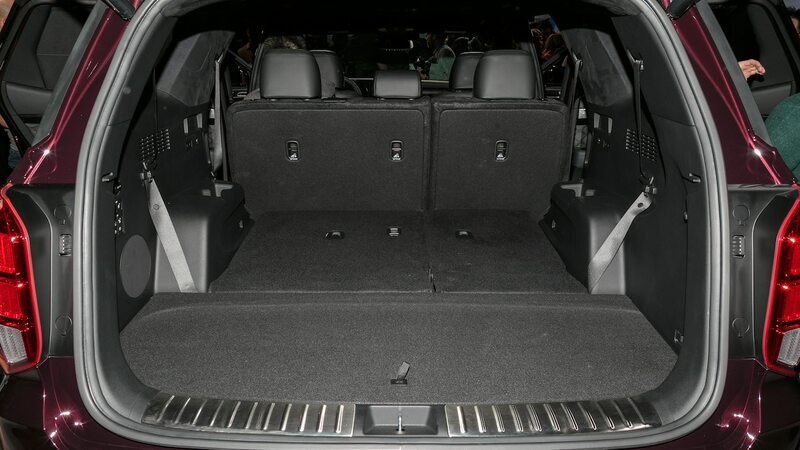 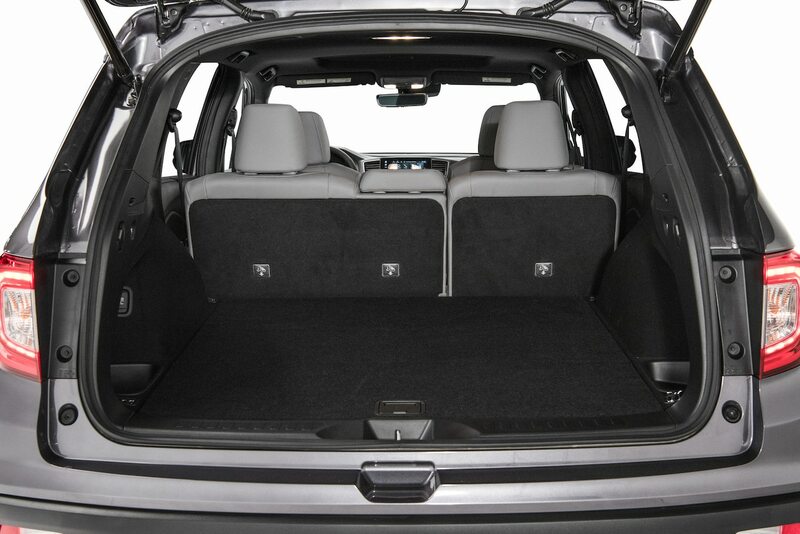 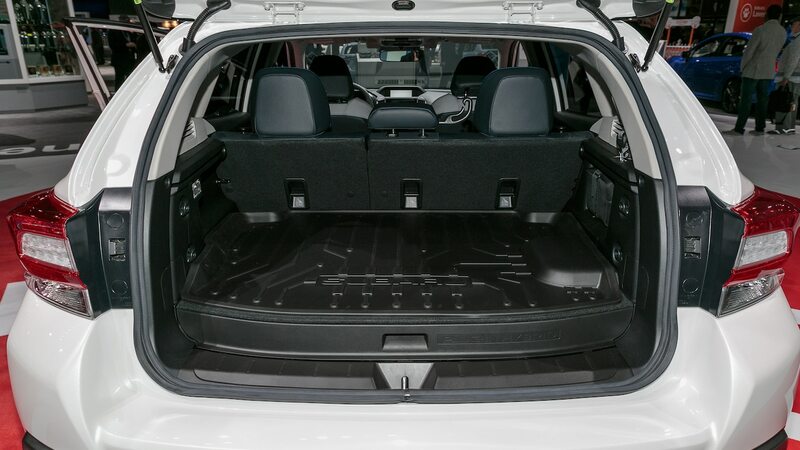 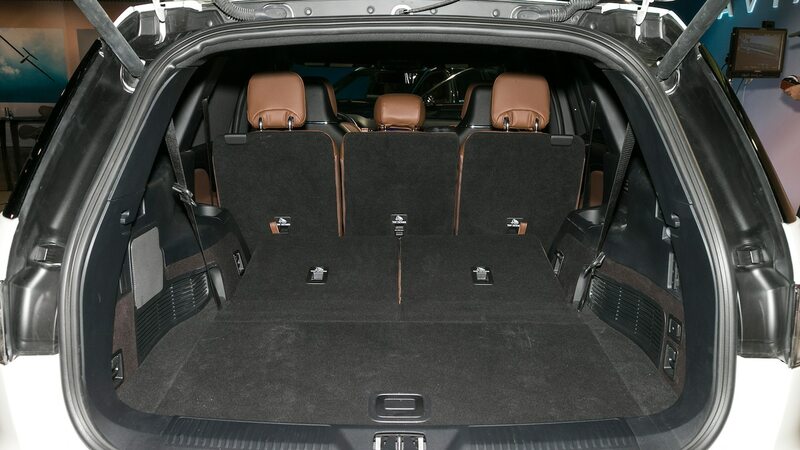 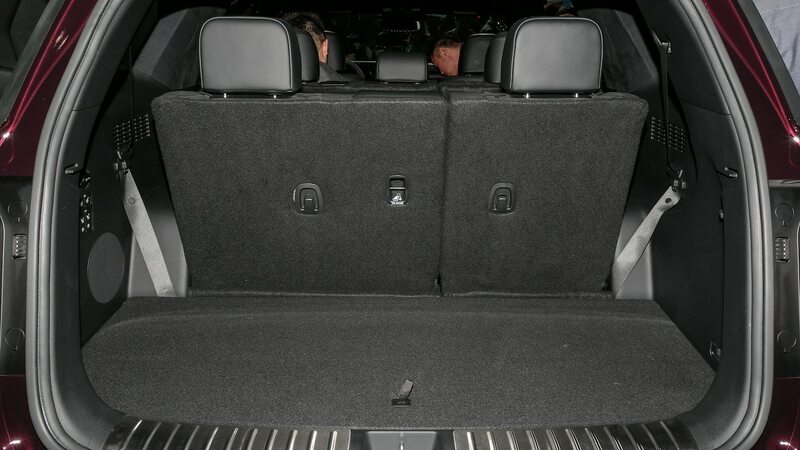 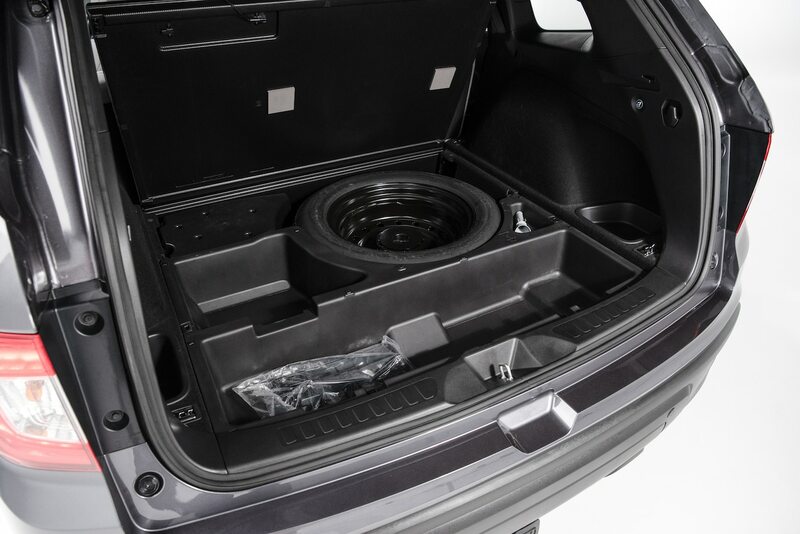 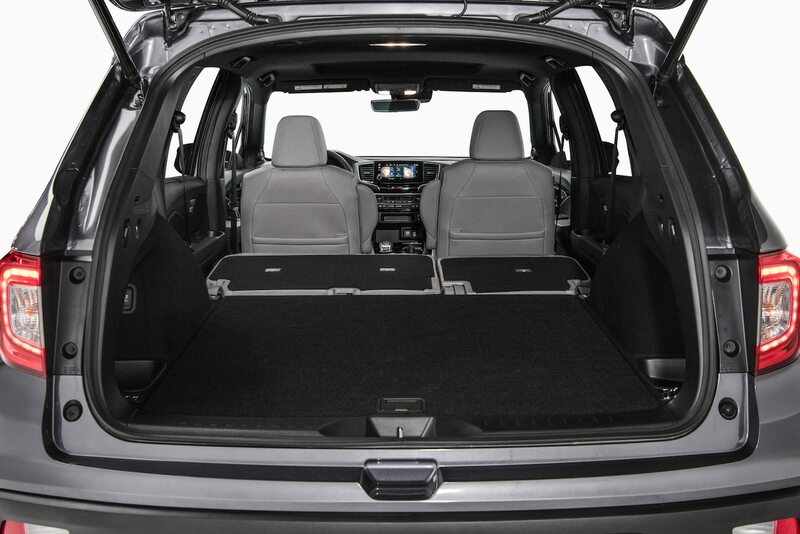 The Passport can hold up to 41.2 cubic feet of cargo behind the second row and features an additional 2.5 cubic feet in underfloor storage. 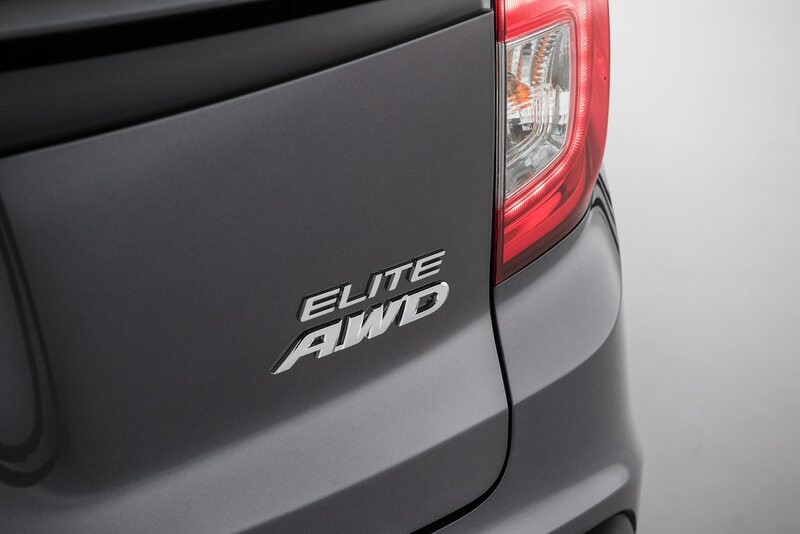 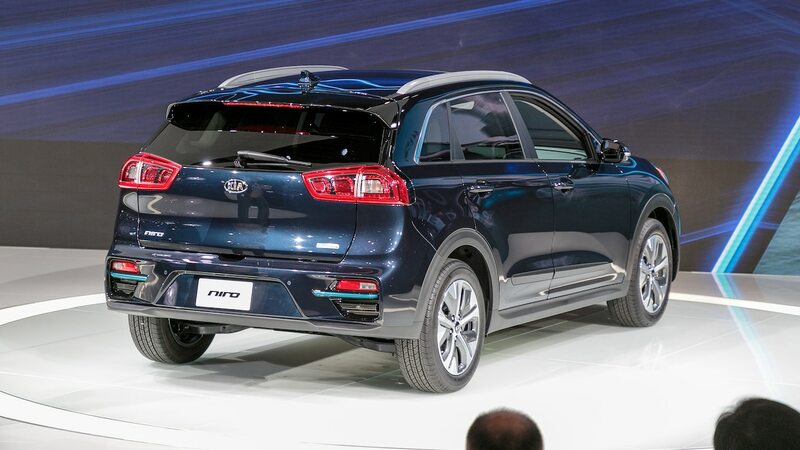 Towing capacity ranges between 3,500 pounds (1,587 kg) for FWD models and 5,000 pounds (2,268 kg) for AWD models. 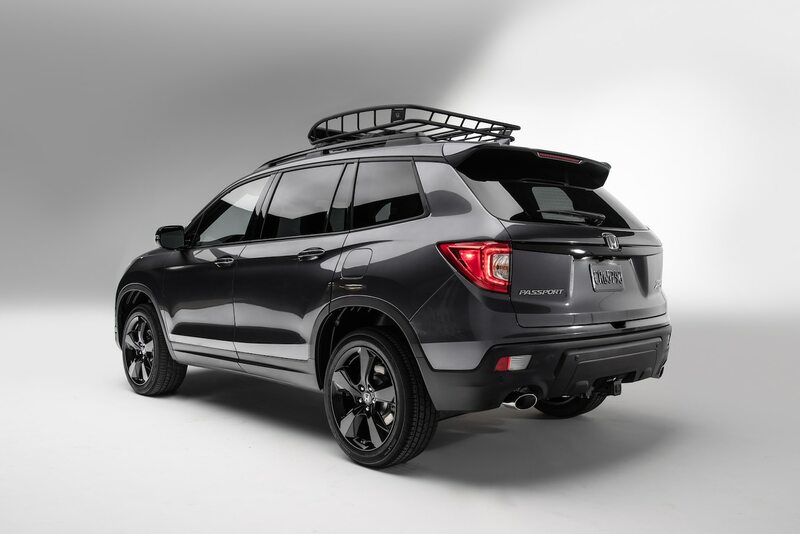 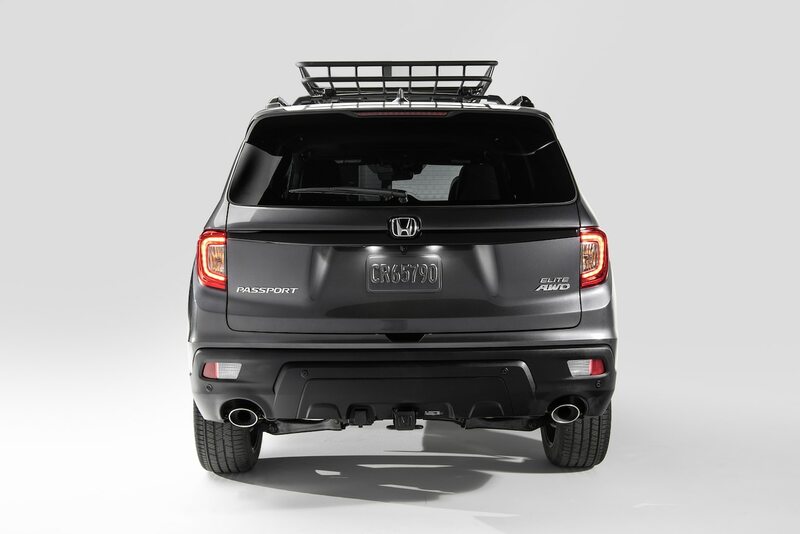 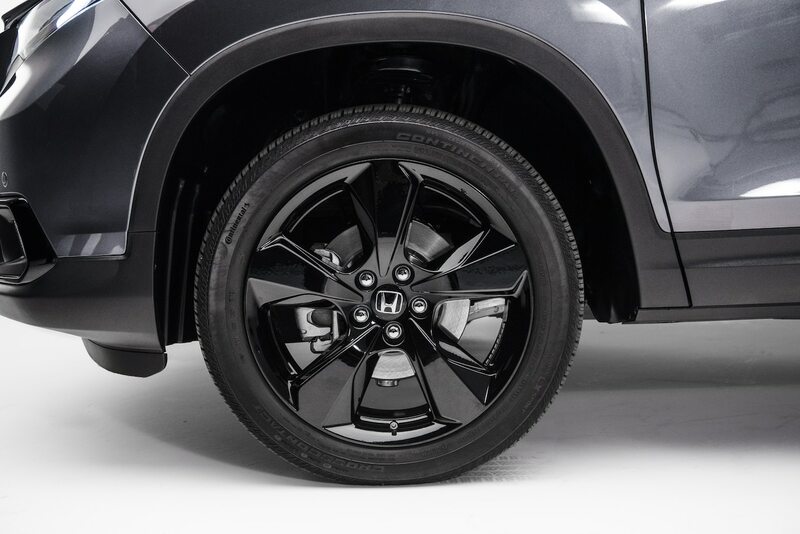 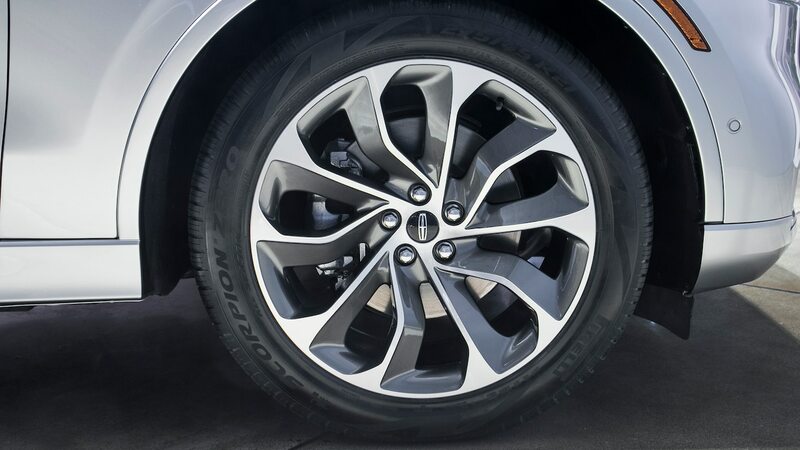 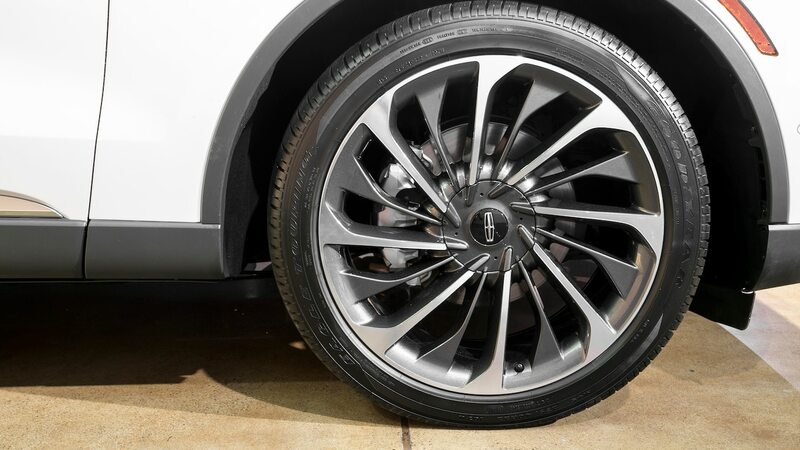 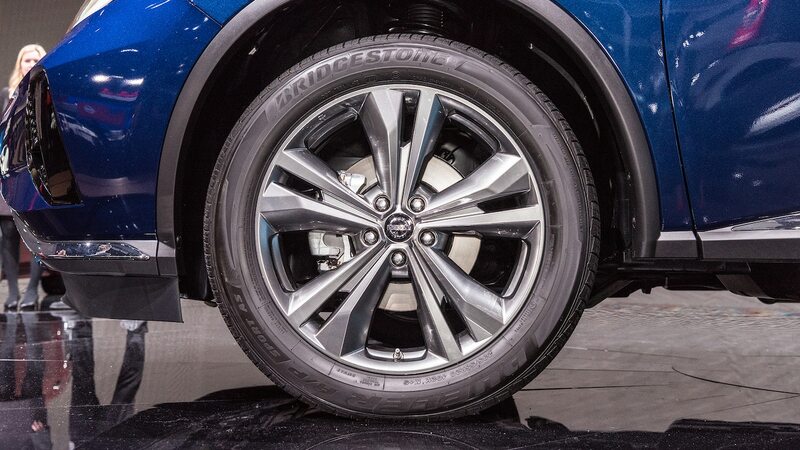 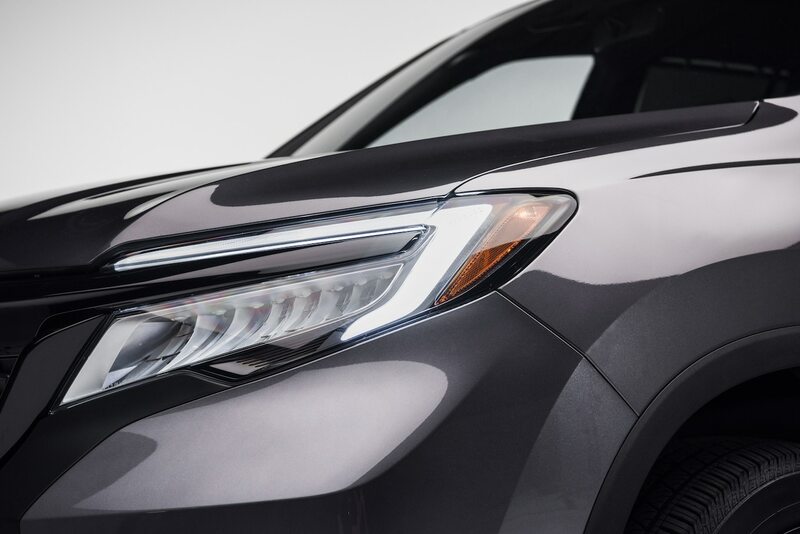 All models come standard with 20-inch wheels and the Honda Sensing driver-assist package. 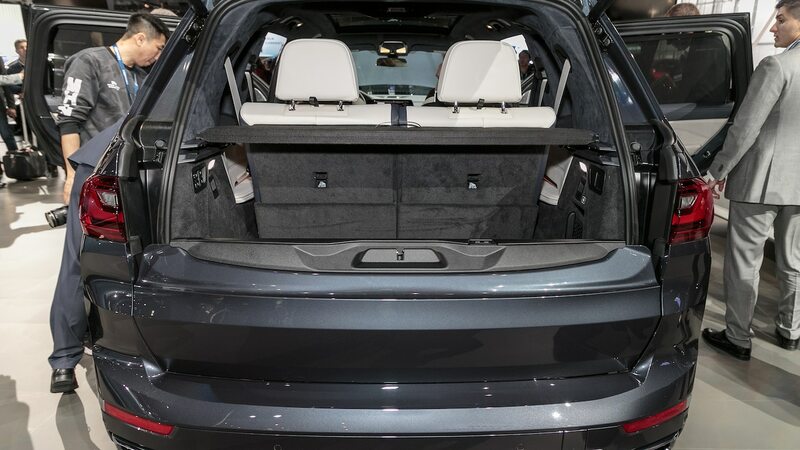 BMW finally has a full-size, three-row SUV. 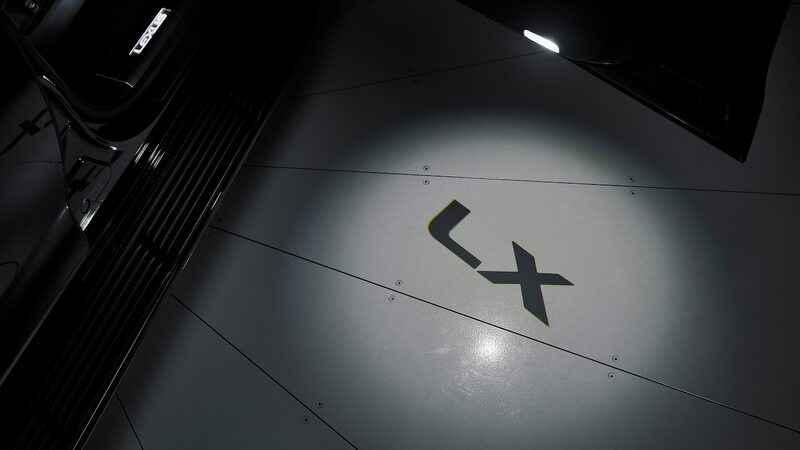 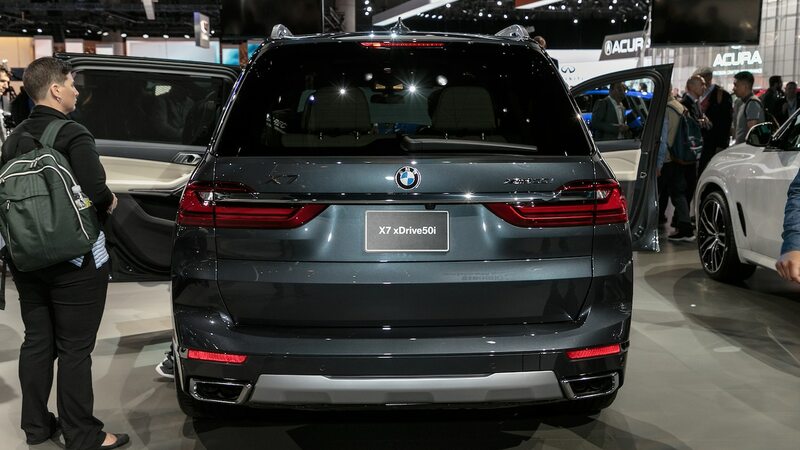 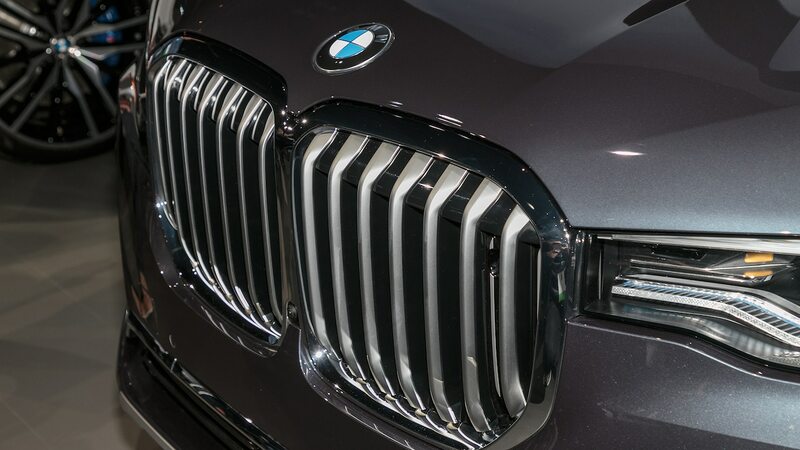 The X7 will compete against rivals like the Audi Q7, Mercedes-Benz GLS, and the Lexus LX. 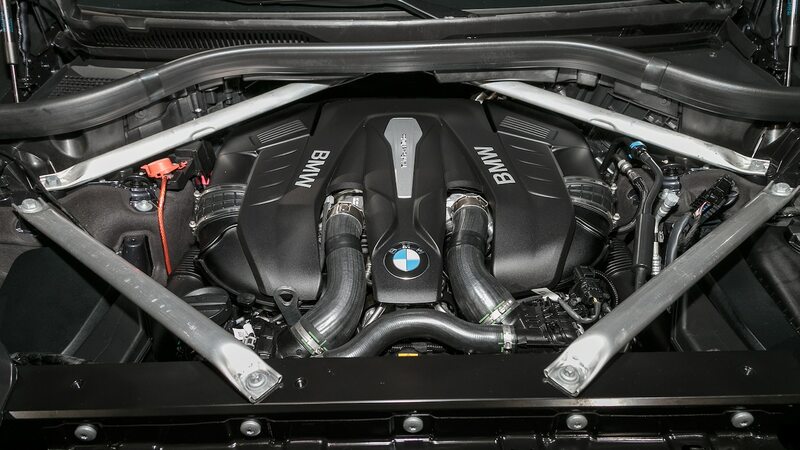 Engine choices are similar to the X5. 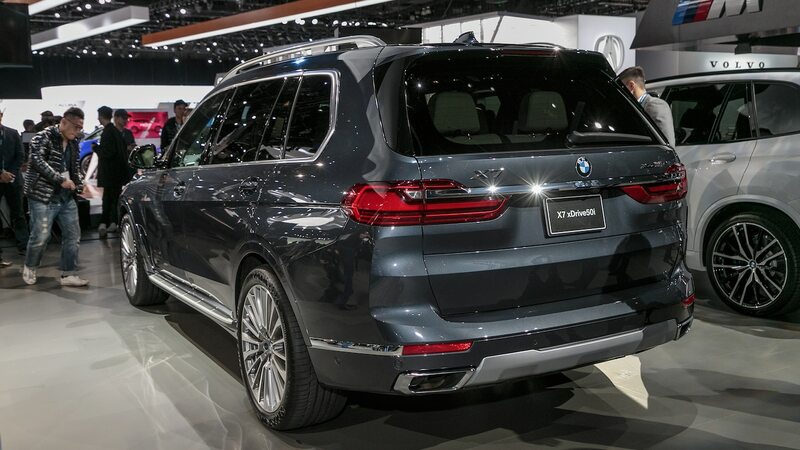 The xDrive40i model will pack a 3.0-liter turbocharged inline-six making 335 hp and 330 lb-ft. 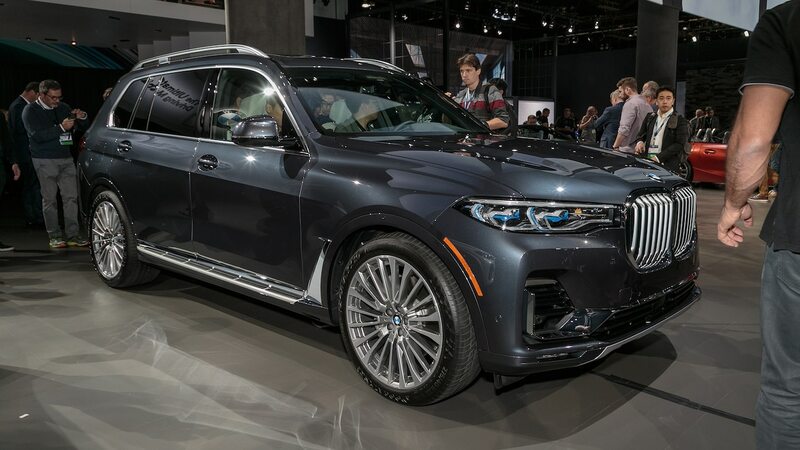 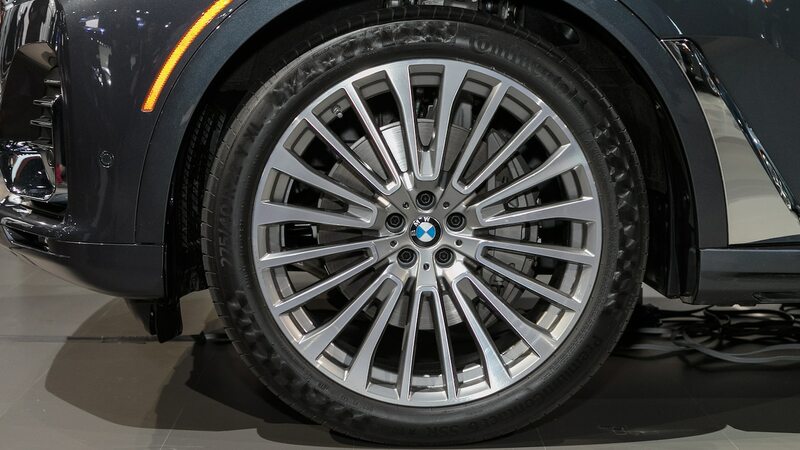 The xDrive50i model is equipped with a 4.4-liter twin-turbo V-8 good for 456 hp and 479 lb-ft. BMW claims the 40i will hit 60 mph in 5.8 seconds, and the 50i will reach that same speed in 5.2 seconds. 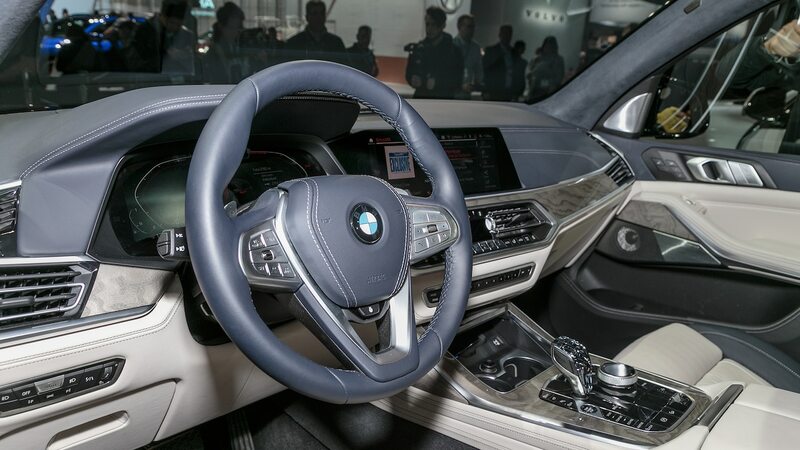 Like the new 3 Series, the X7 offers a personal assistant that can assist the driver in various ways when given voice commands that start with “Hey, BMW.” Some notable optional features include a panoramic sky lounge LED roof, heated and cooled cupholders, a rear entertainment package, and glass controls for the shifter, stop/start button, infotainment system controller, and volume knob. 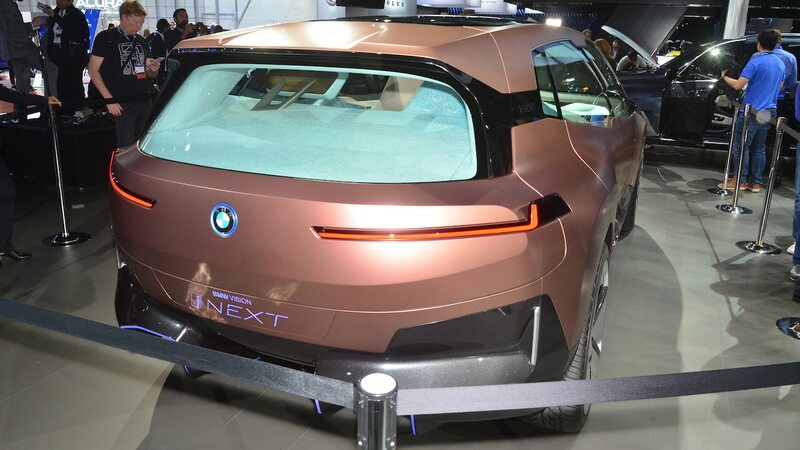 The iNext concept previews BMW’s upcoming EV products and is powered by the brand’s next-generation electric drive system. 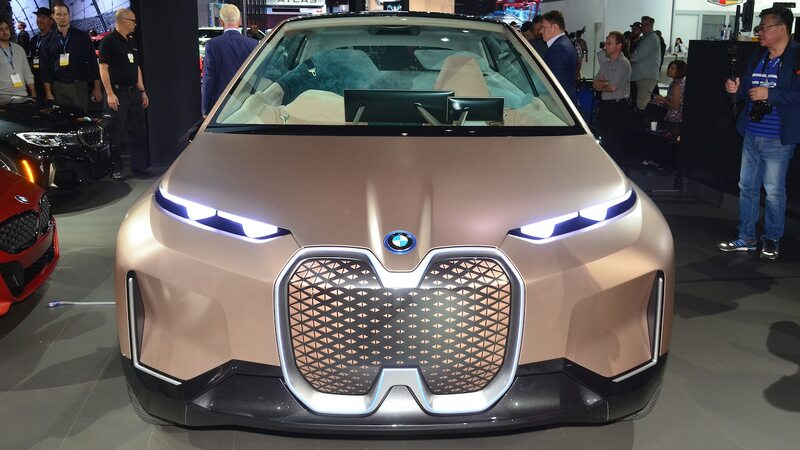 BMW claims the EV will have a driving range of more than 350 miles (563 km) on a full charge and can accelerate to 60 mph in less than 4.0 seconds. 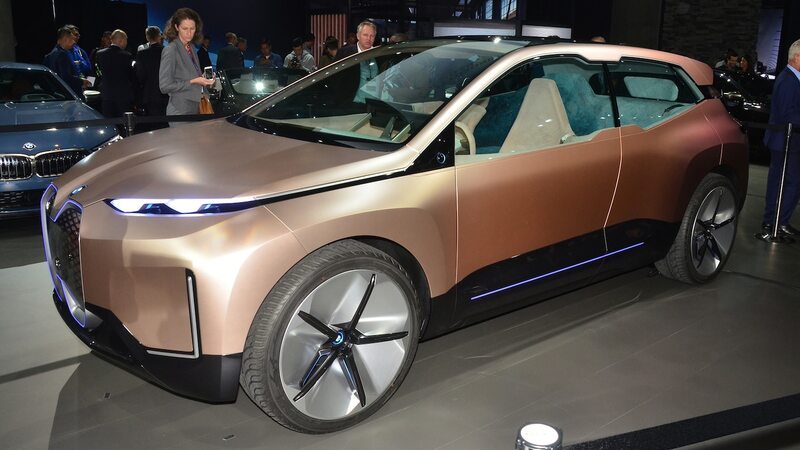 Once in production, BMW says this will be its first vehicle with Level 3 autonomous capability. 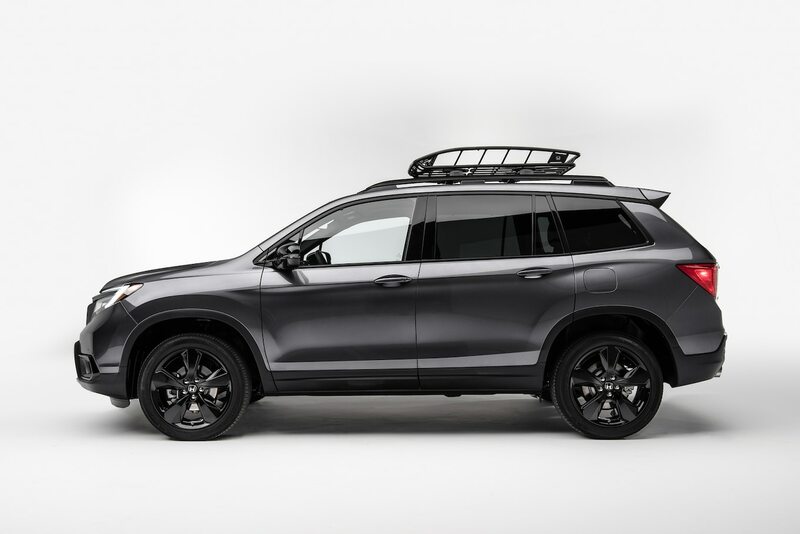 Level 4 autonomy will also be possible. 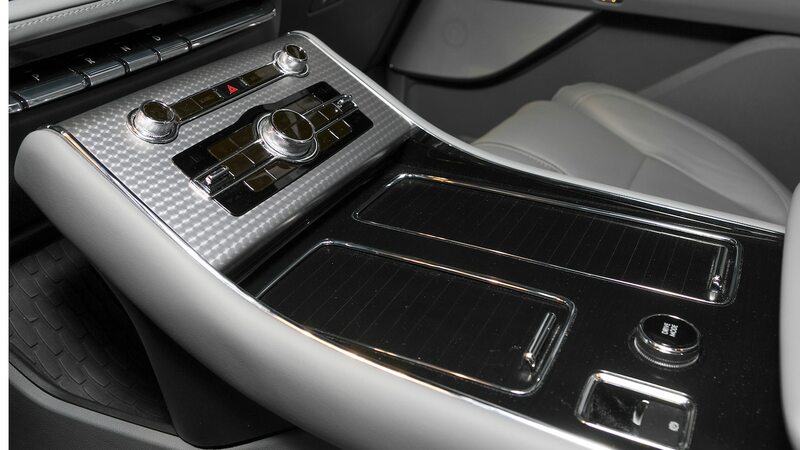 Additionally, expect to see an artificial intelligence personal assistant as another major feature. 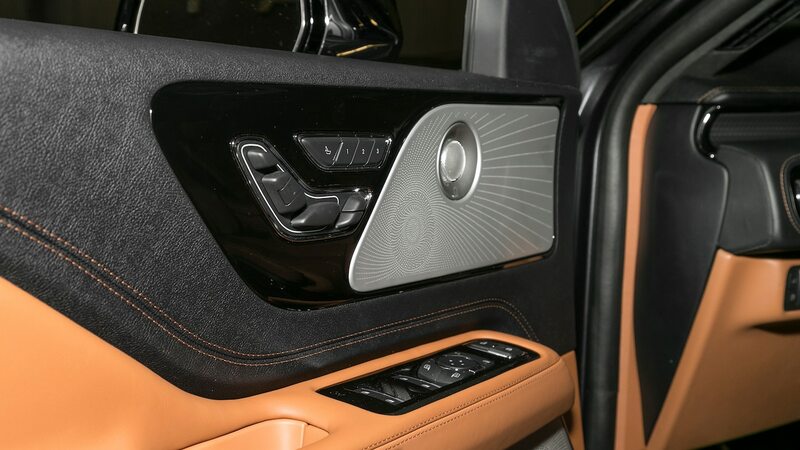 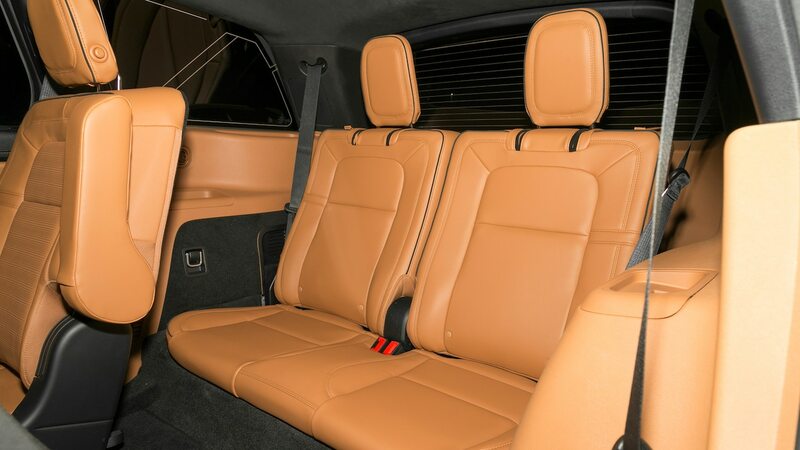 Inside, the cabin is inspired by high-end hotel room decor with lounge-like rear seats. 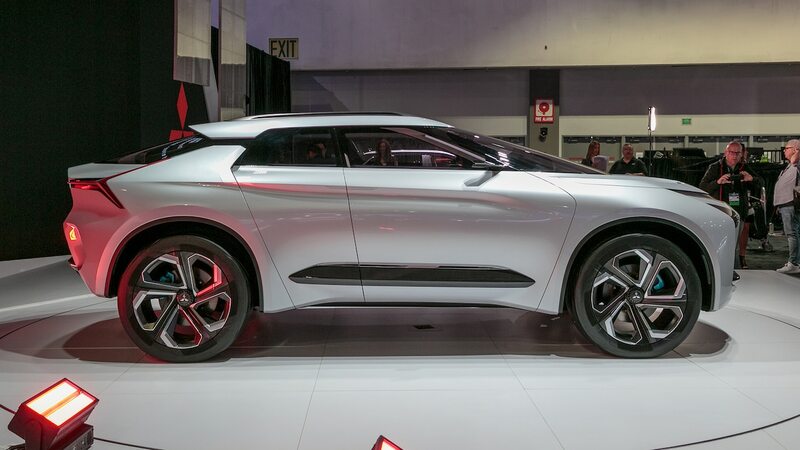 Expect to see the production-ready iNext in 2021. 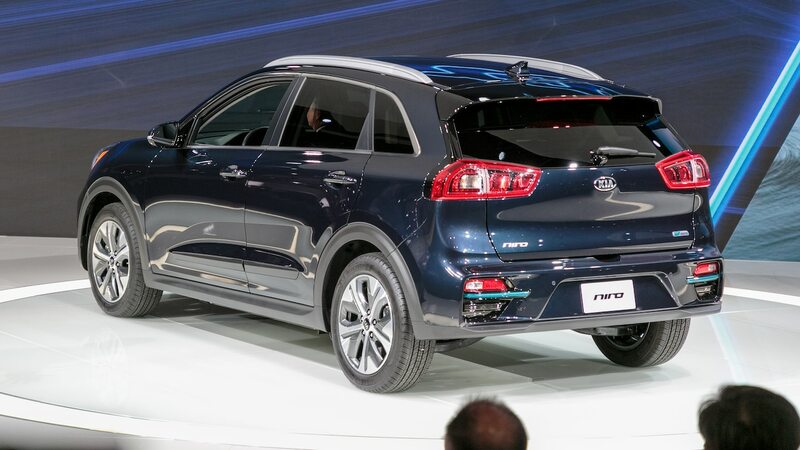 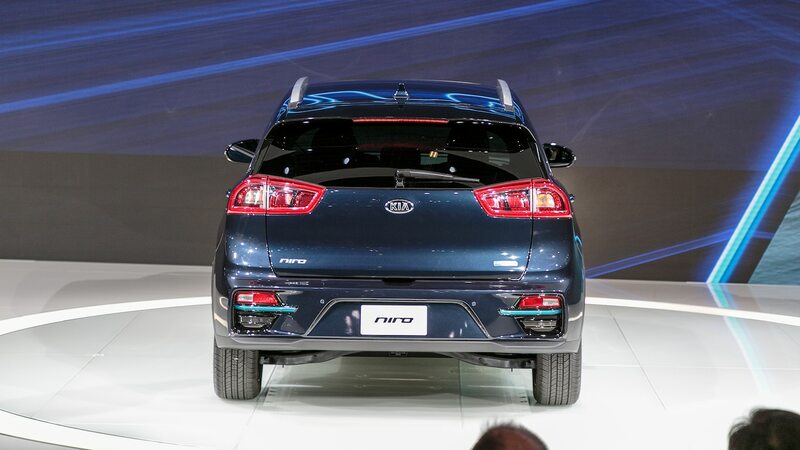 Once on sale, the Niro EV will be one of the most affordable EVs on the market, along with its corporate cousin the Kona Electric. 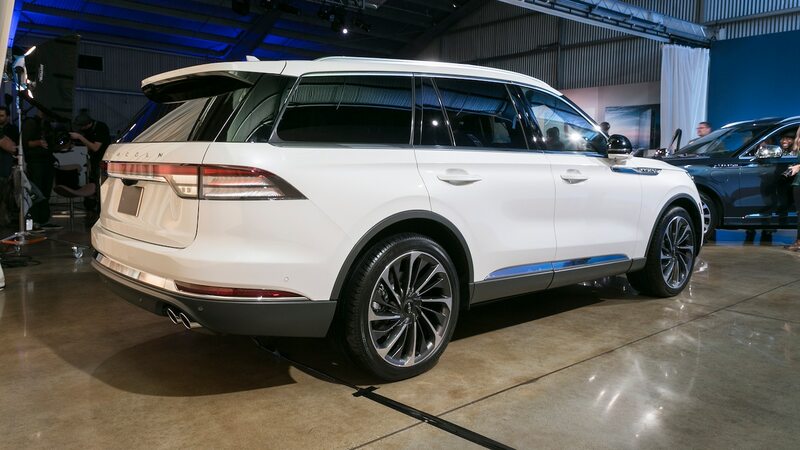 Powering the front-drive EV is an electric motor that makes 201 hp and 290 lb-ft and is backed by a 64-kW-hr battery pack. 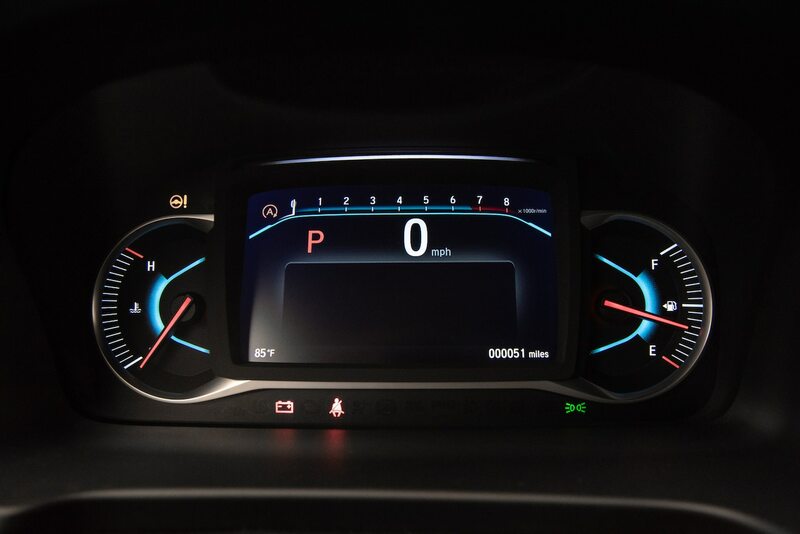 Like the Chevrolet Bolt EV, the Niro EV has a driving range of almost 240 miles (386 km) on a full charge. 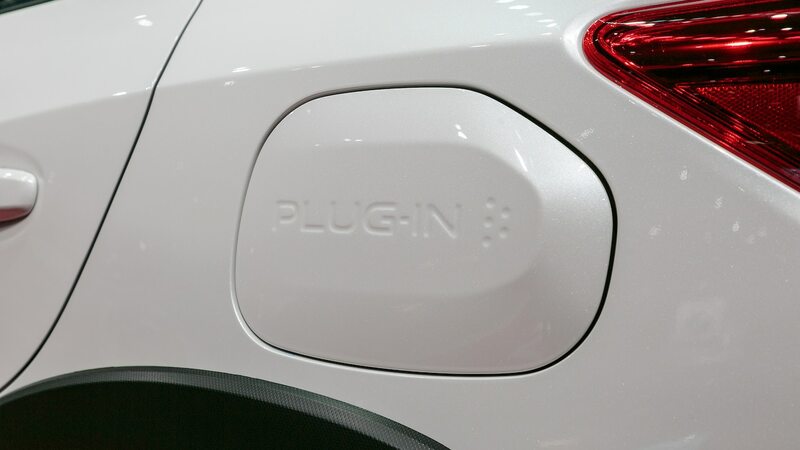 Using a Level 3 quick charger, the battery can be charged to 80 percent in 54 minutes. 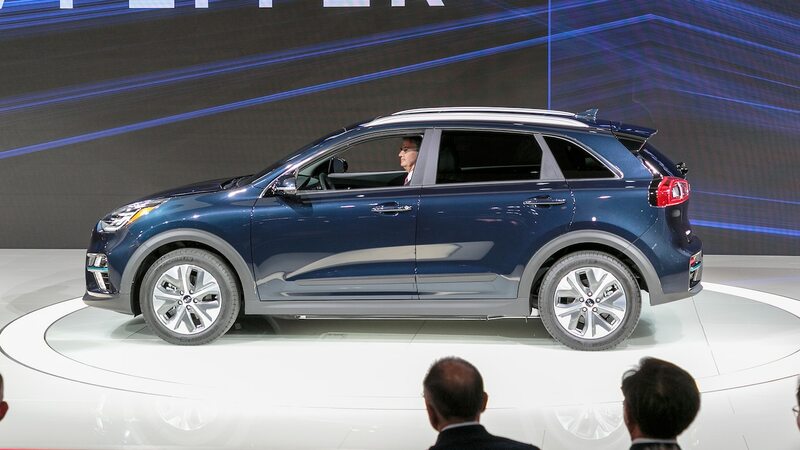 Expect a brisk 0–60 mph run below 7.0 seconds—the Kona Electric did it in 6.6 seconds. 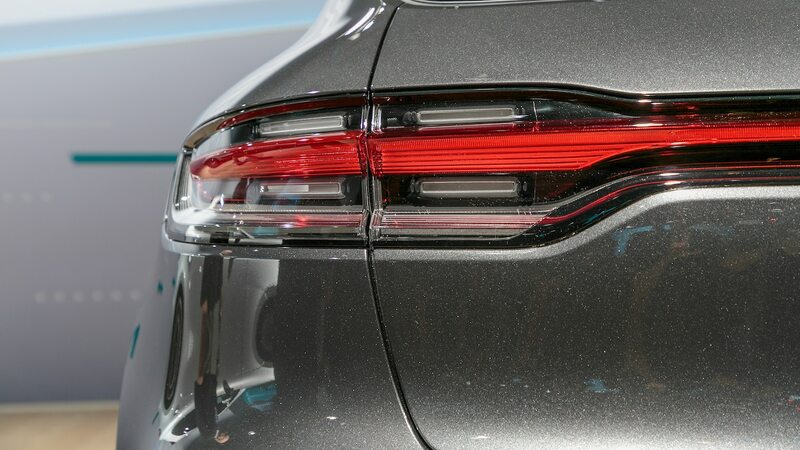 Pricing will likely start just above $30,000 USD after EV incentives. 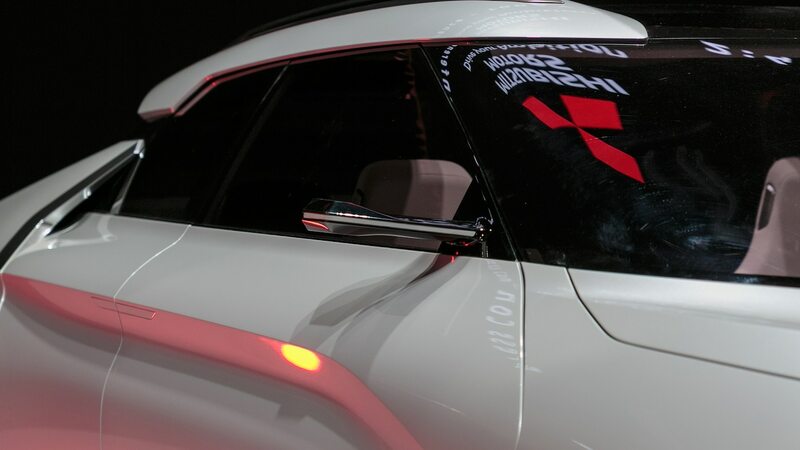 The e-Evolution is the brand’s symbol for the future. 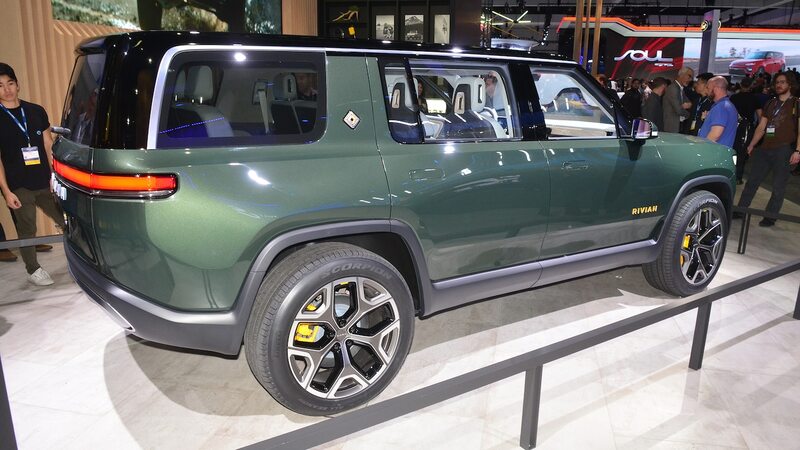 The all-wheel-drive, all-electric SUV concept is powered by a high-capacity battery pack that feeds three motors, one in the front and a dual-motor system with Active Yaw Control in the rear. 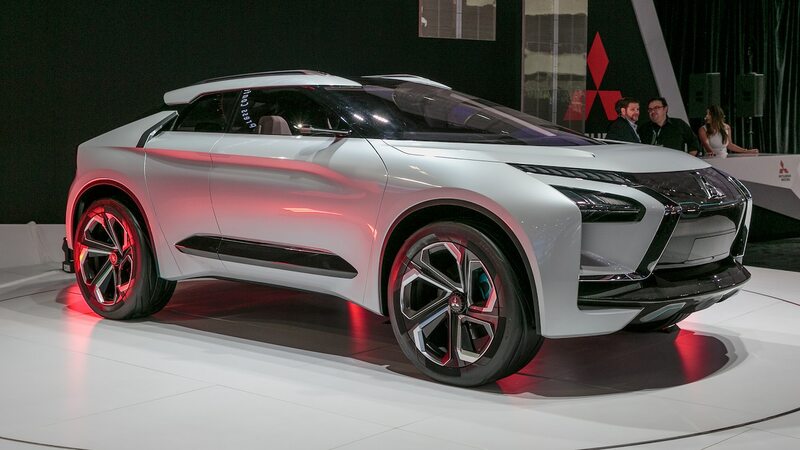 Mitsubishi incorporated its Super All-Wheel Control (S-AWC) into the three-motor system, and electric calipers control torque vectoring. 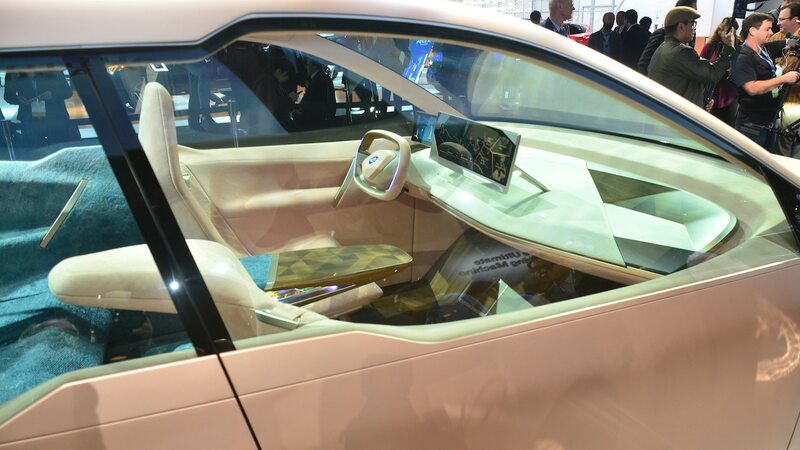 An AI system is the brain of the vehicle and reads road and traffic conditions and driver habits. 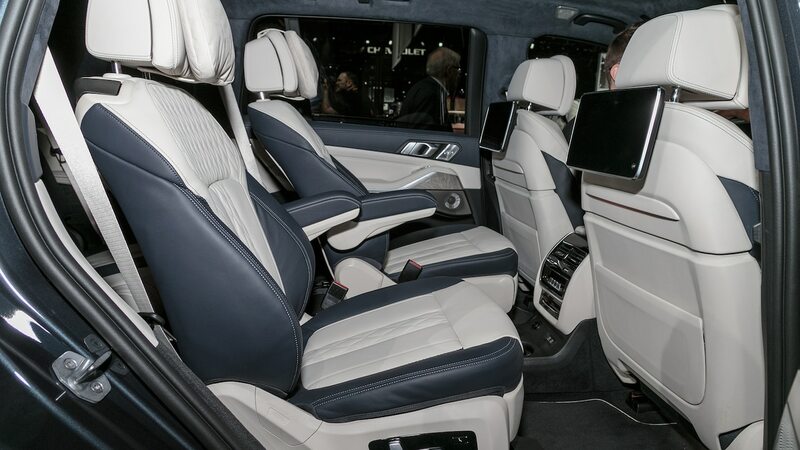 The system can also coach the driver for an improved experience. 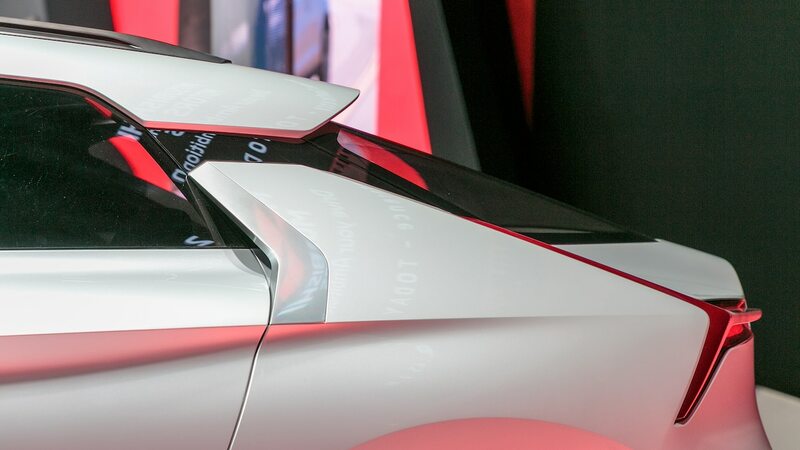 A similar version of the concept’s Dynamic Shield design will likely be seen in future products. 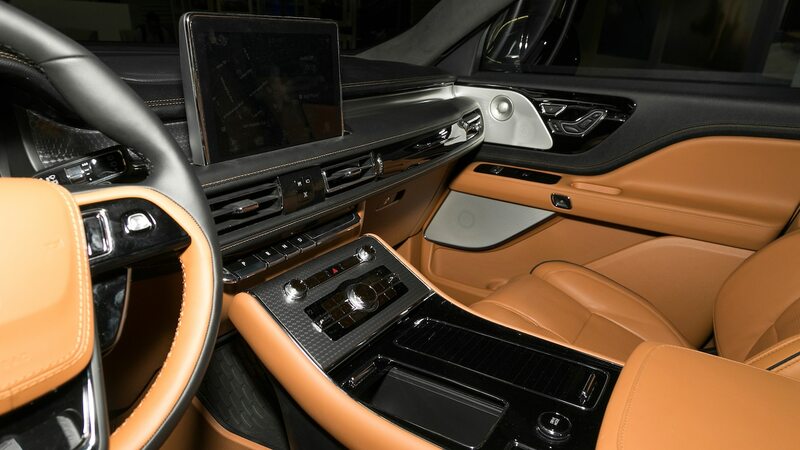 Inside, a large flat screen spans the length of the dashboard, and the windows provide a near 360-degree unobstructed outside view. 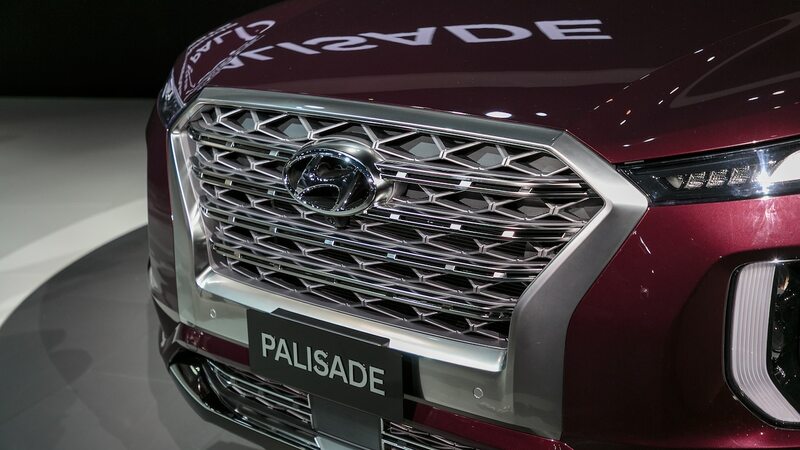 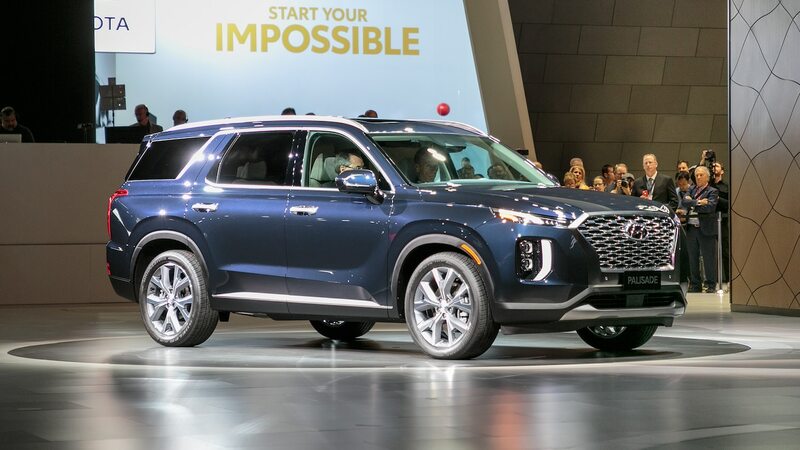 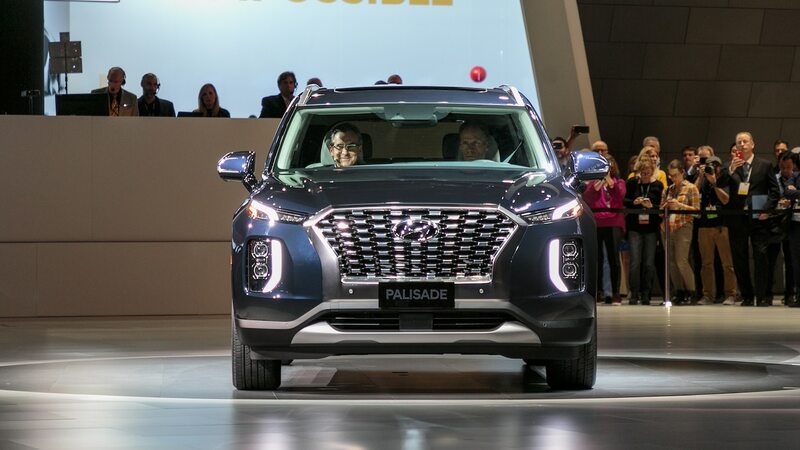 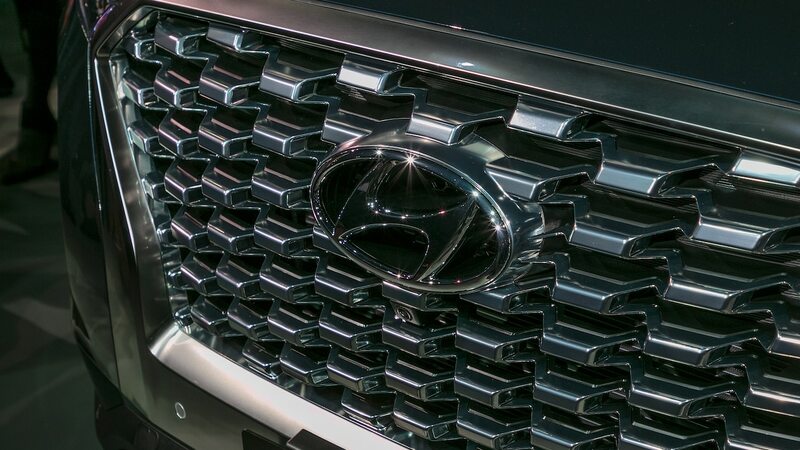 Hyundai unveiled its largest utility vehicle ever, the three-row Palisade. 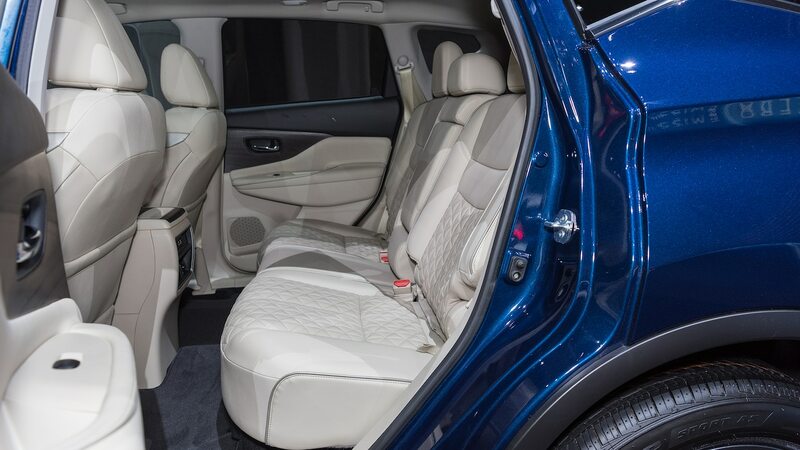 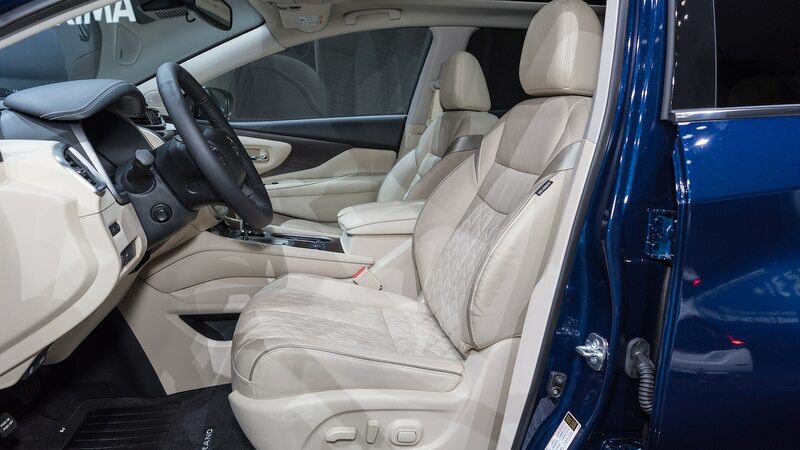 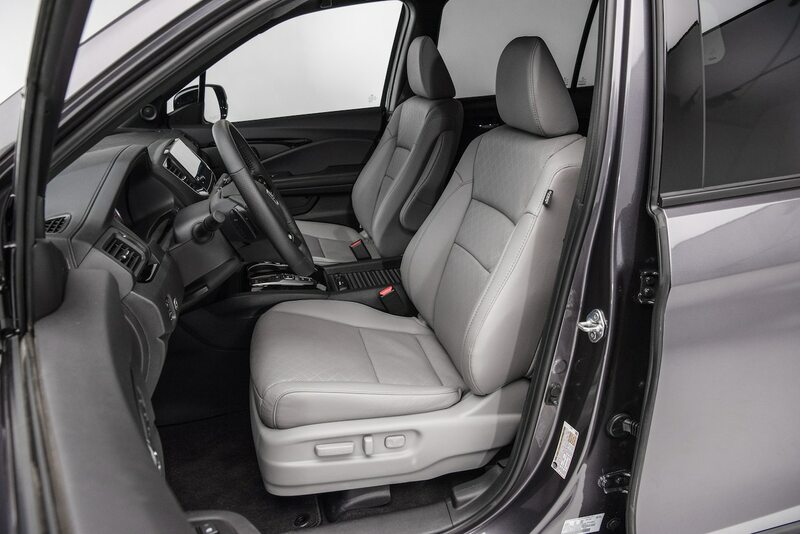 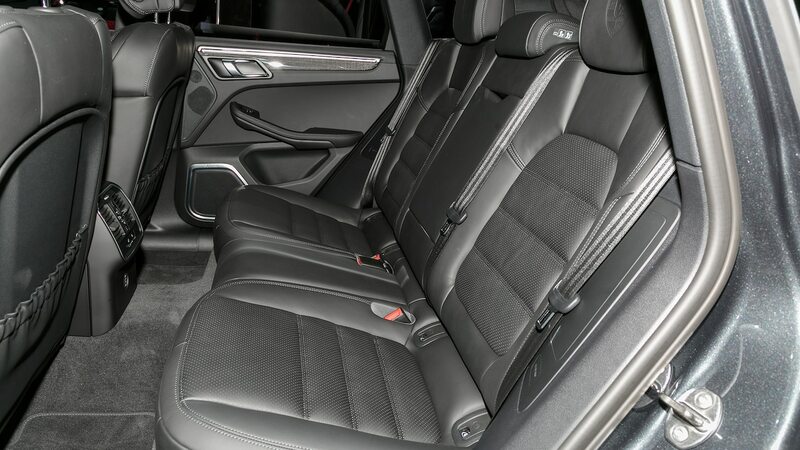 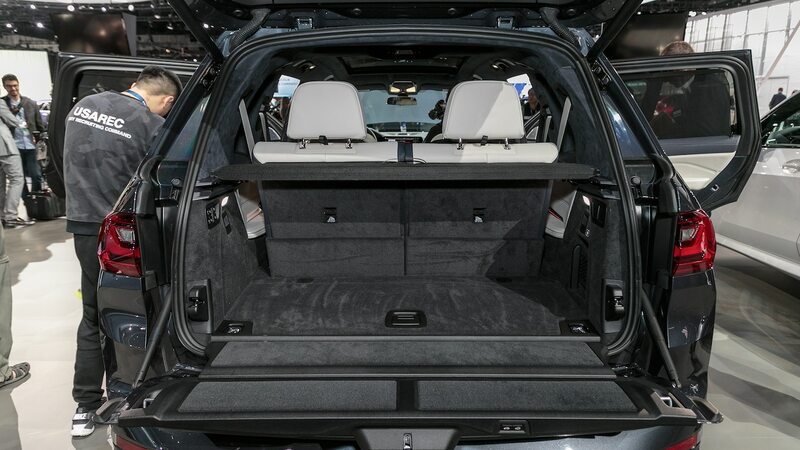 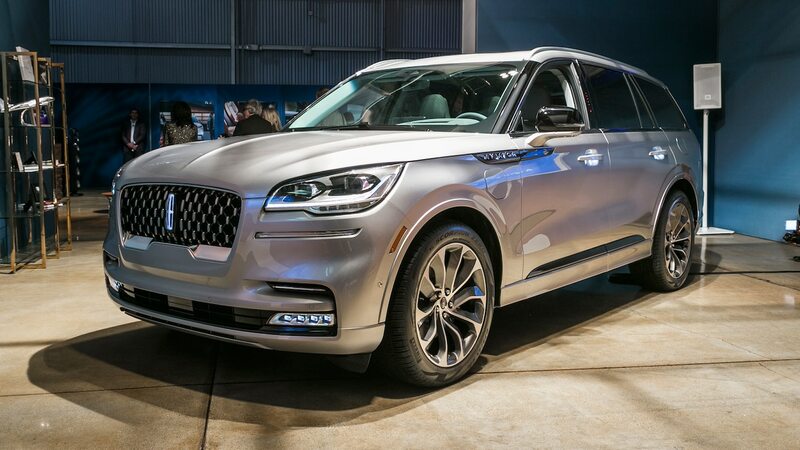 Seating up to eight passengers, the Palisade is 3 inches longer than the three-row Santa Fe, has a 4-inch-longer wheelbase, and is 3.6 inches wider, though it uses the Santa Fe’s underpinnings. 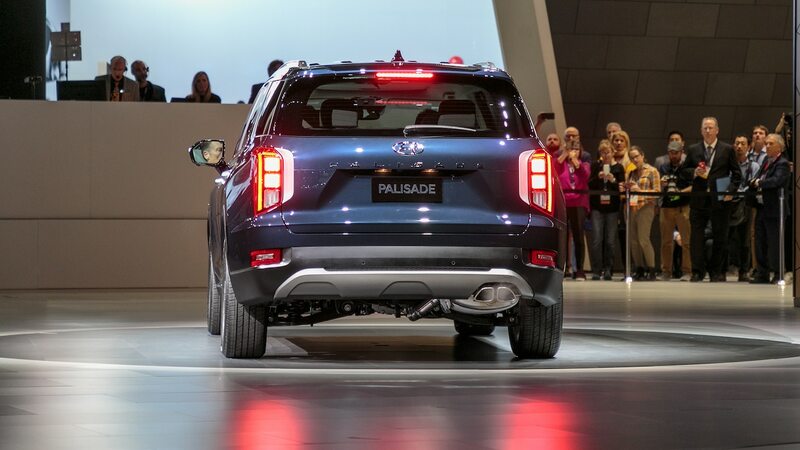 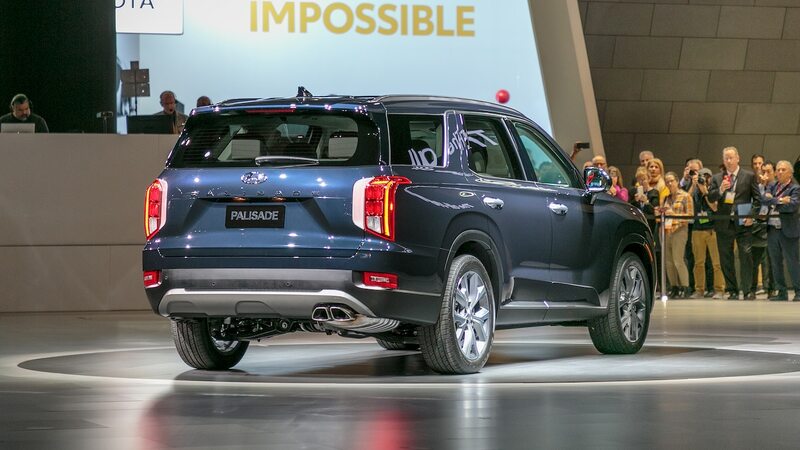 Powering the Palisade is a 3.8-liter V-6 that makes 291 hp and 262 lb-ft. All-wheel drive is optional and the Palisade can tow up to 5,000 pounds (2,268 kg). 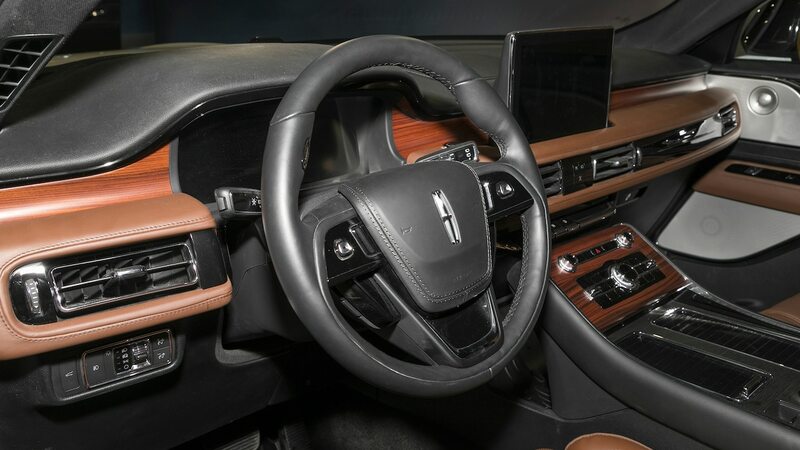 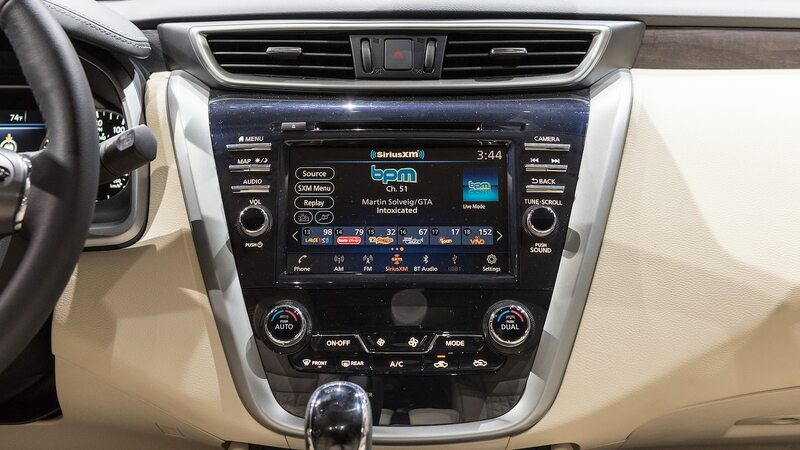 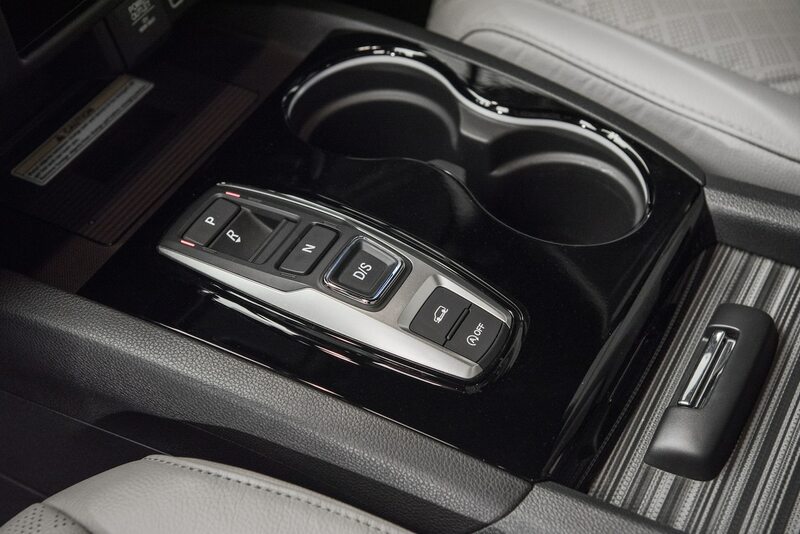 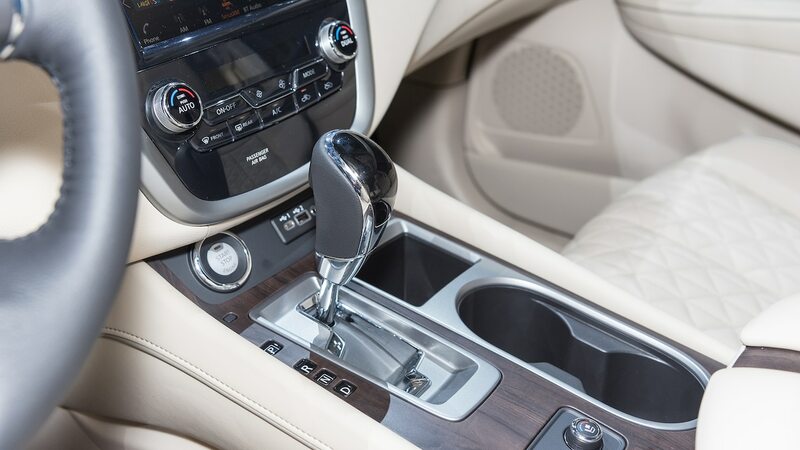 The cabin features a 10.3-inch touchscreen and a 12.3-inch digital instrument panel. 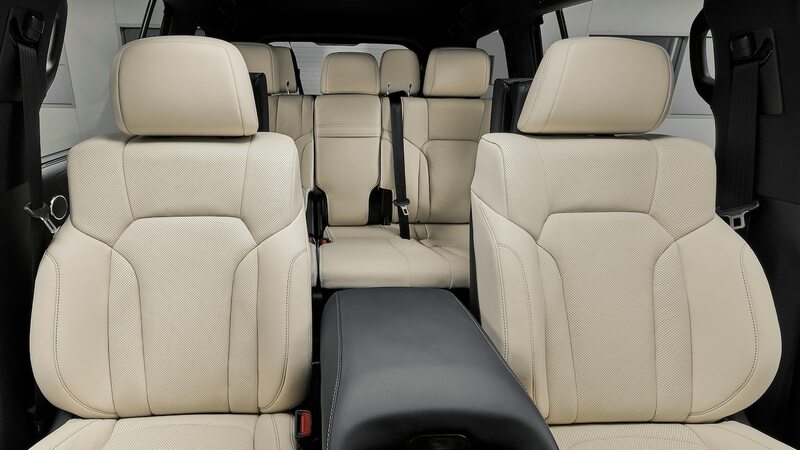 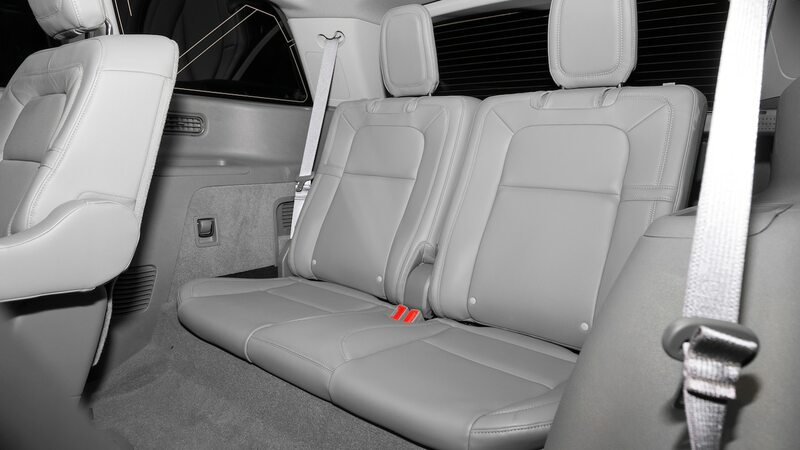 Seven-passenger seating is optional with rear heated and ventilated captain’s chairs. 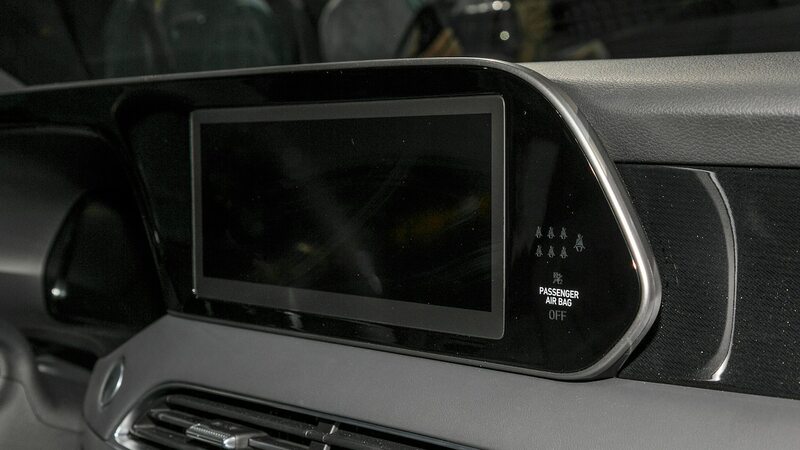 An intercom connects the front- and third-row seats and can be set to conversation or sleep modes. 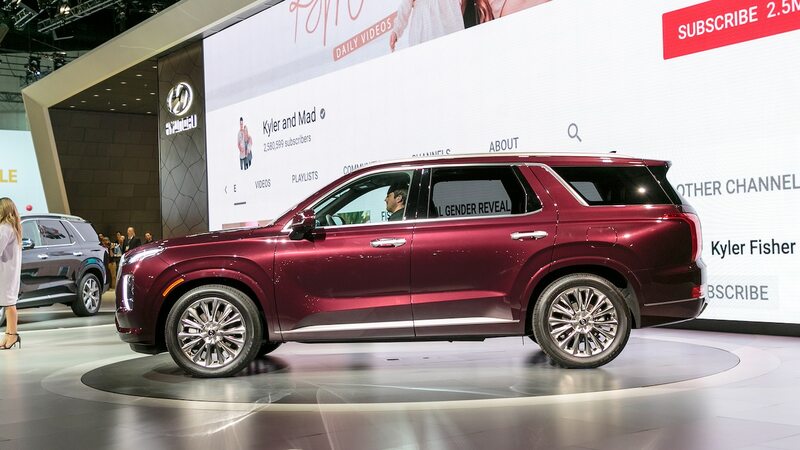 A package of driver-assist safety features dubbed Smart Sense is standard, and the Safe Exit Assist safety feature is new. 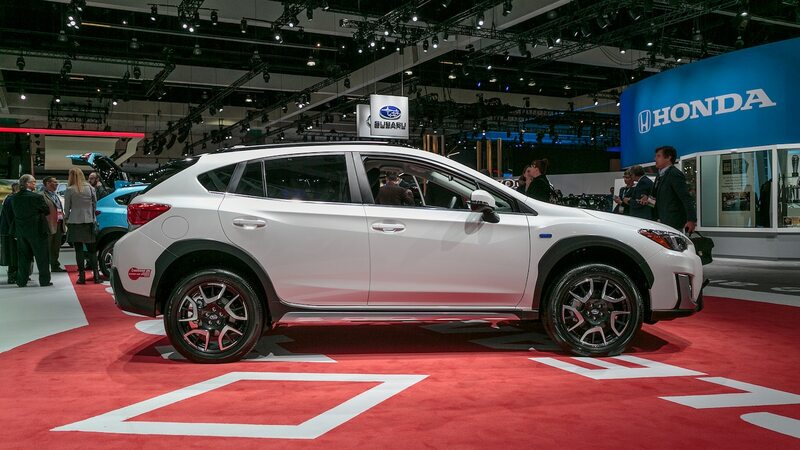 Subaru’s first-ever plug-in hybrid electric vehicle made its debut at the L.A. auto show. 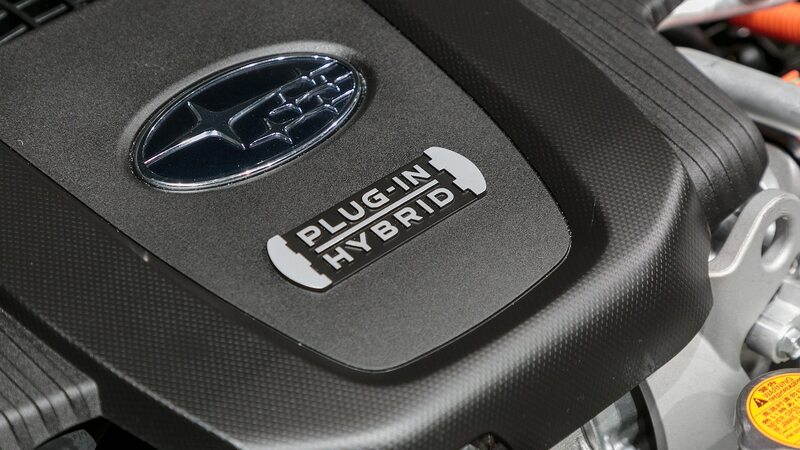 The hybrid powertrain consists of an Atkinson cycle 2.0-liter flat-four engine paired to a generator and drive motor. 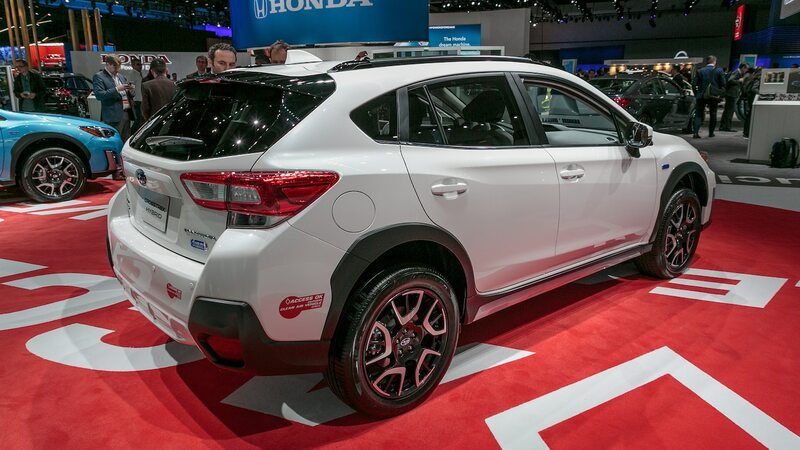 Total system output is 148 hp, 4 less than the regular Crosstrek. 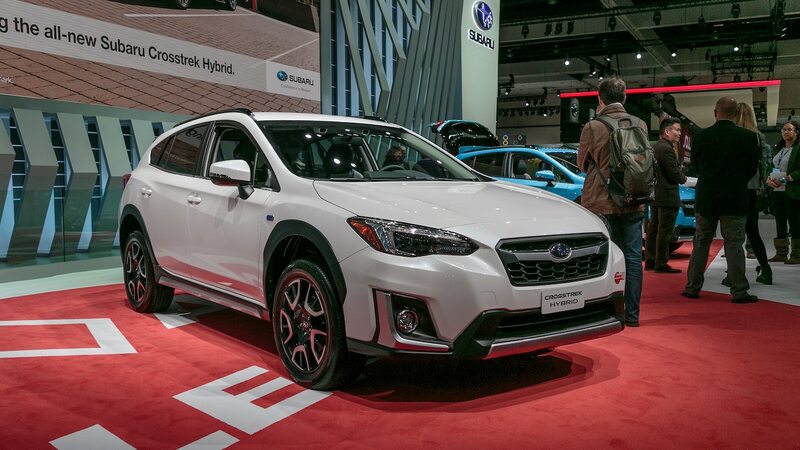 Still, the total torque rating should be higher given the electric drive motor produces 149 lb-ft alone, 4 more than the non-hybrid Crosstrek. 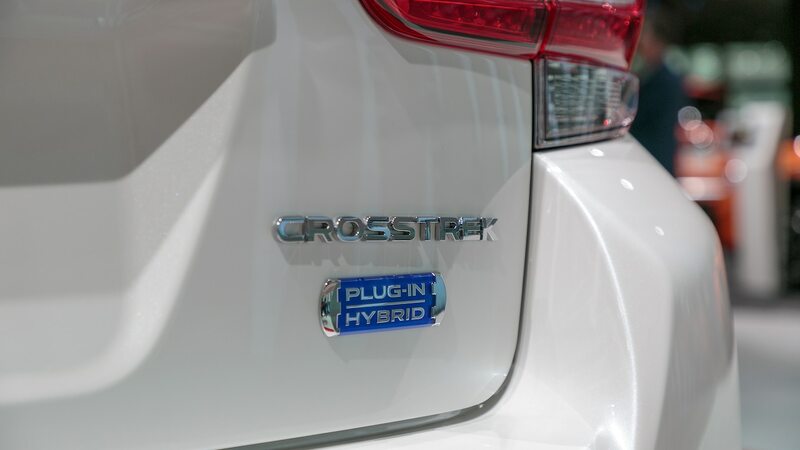 Subaru claims the Crosstrek Hybrid is a second quicker to 60 mph. 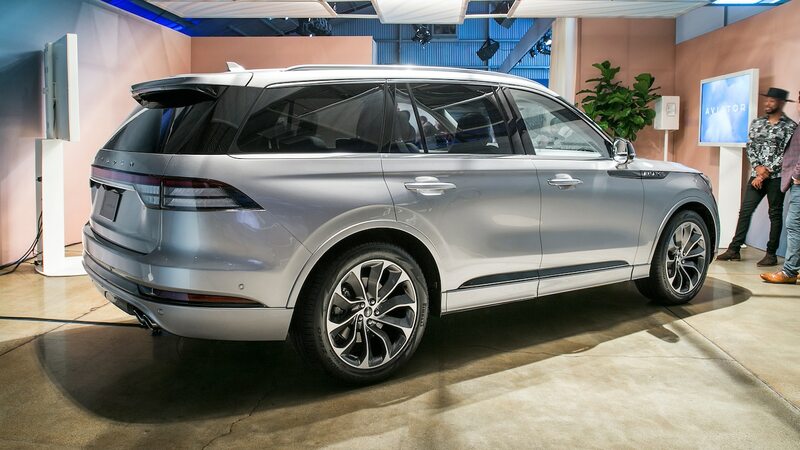 The PHEV has a 17-mile (27-km) all-electric driving range and delivers 35 mpg (6.7 L/100km) combined when the battery runs low. 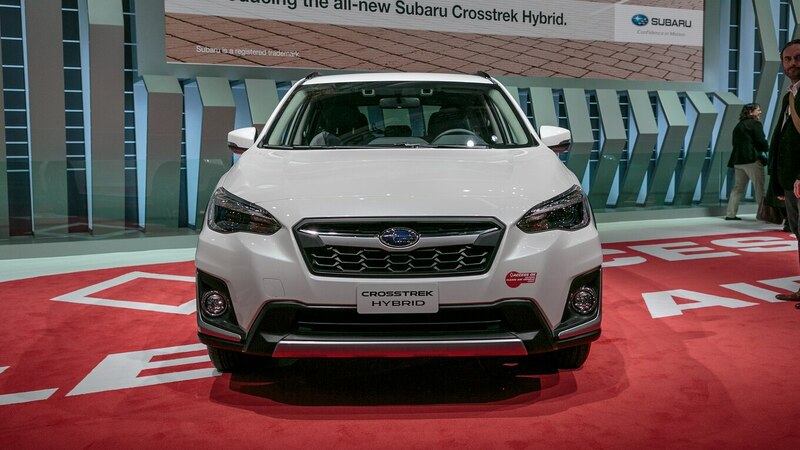 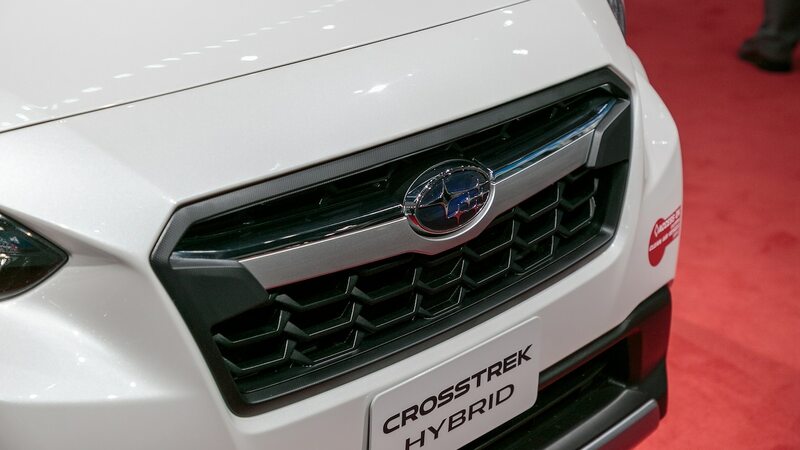 Ground clearance is still 8.7 inches, and off-road capability should still be impressive thanks to the same Symmetrical AWD system and the X-Mode off-road mode found in the regular Crosstrek. 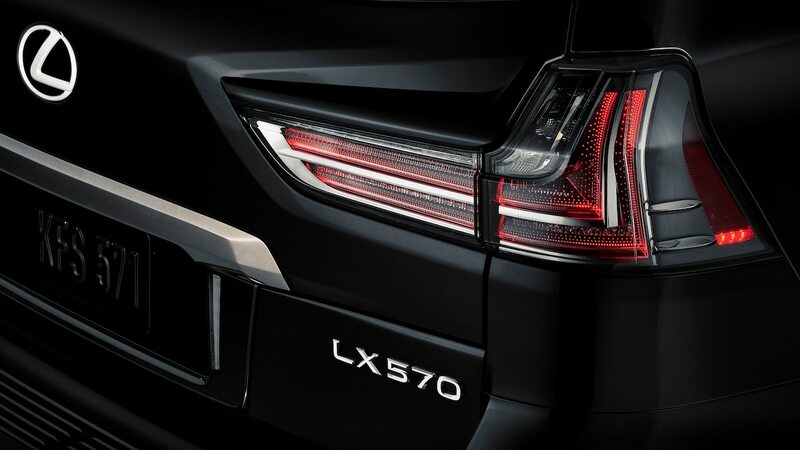 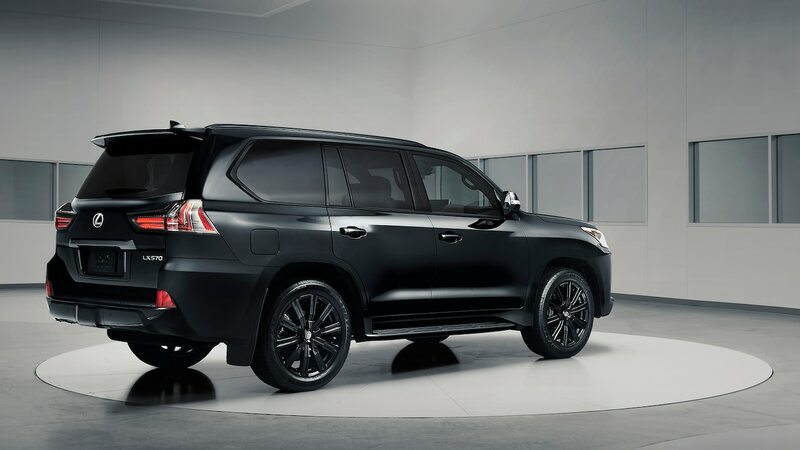 Like the Highlander Nightshade, the LX Inspiration Series is a limited-production, blacked-out variant of Toyota’s capable and luxurious SUV. 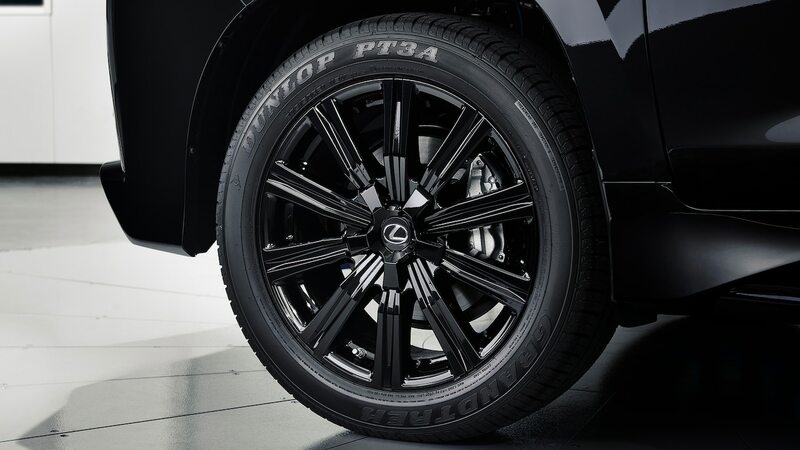 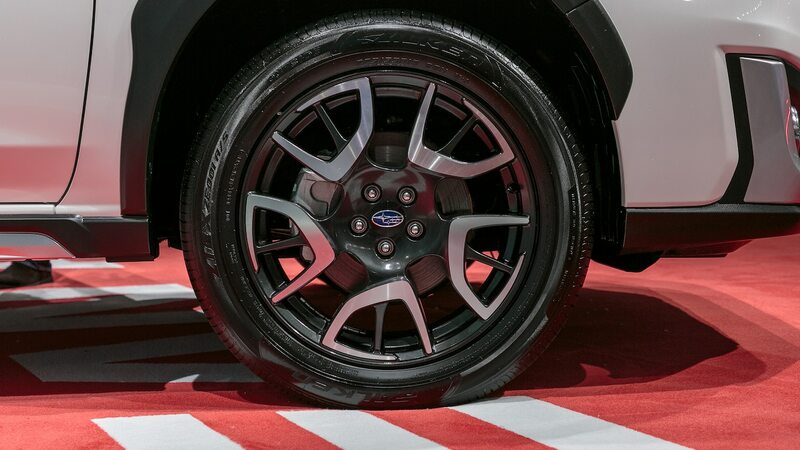 The model comes in black paint and gets 21-inch black wheels and a black grille with a dark chrome surround. 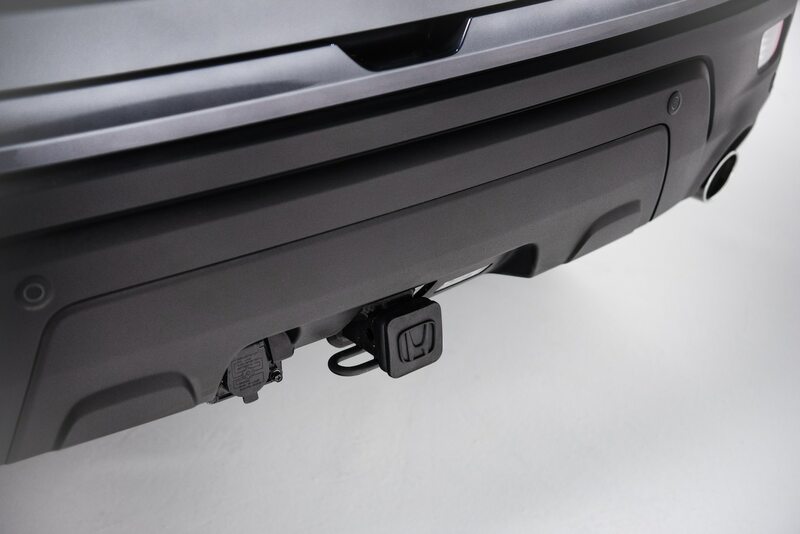 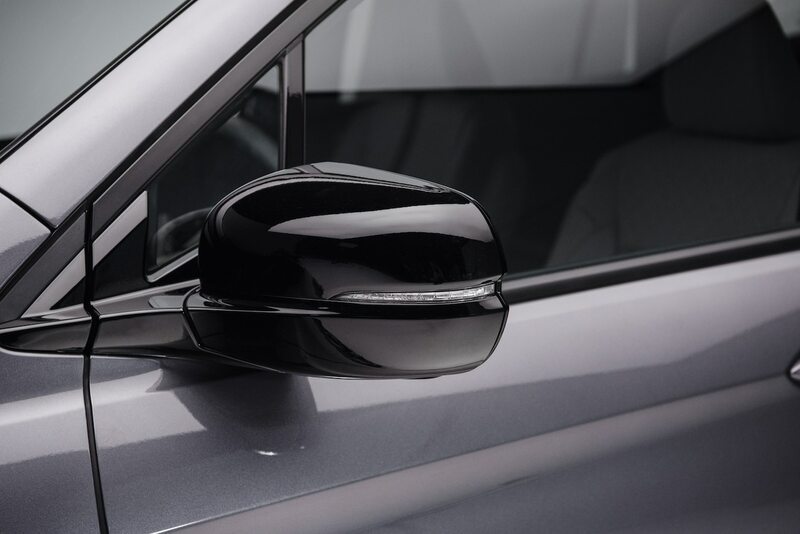 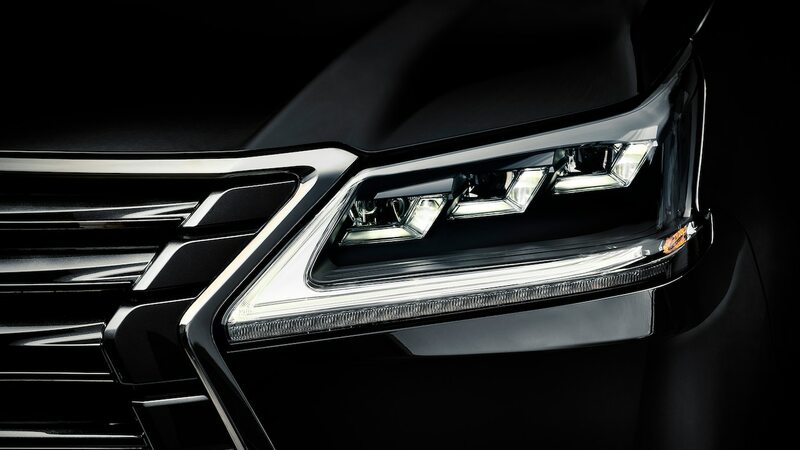 The foglights, windows, and many other exterior components are accented in black or dark chrome. 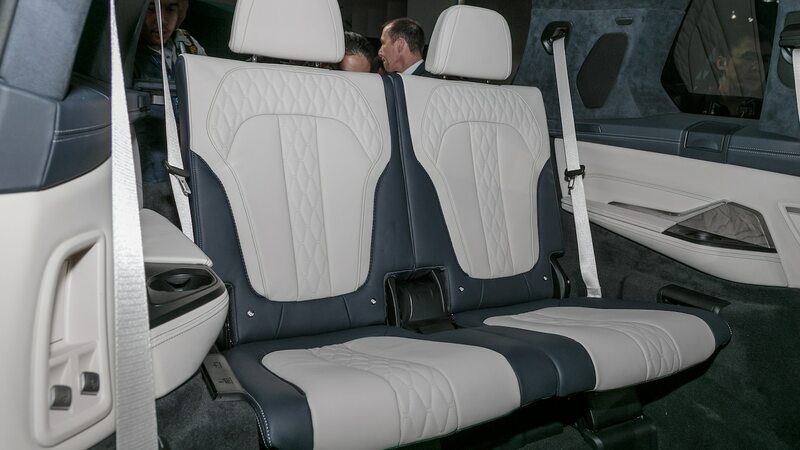 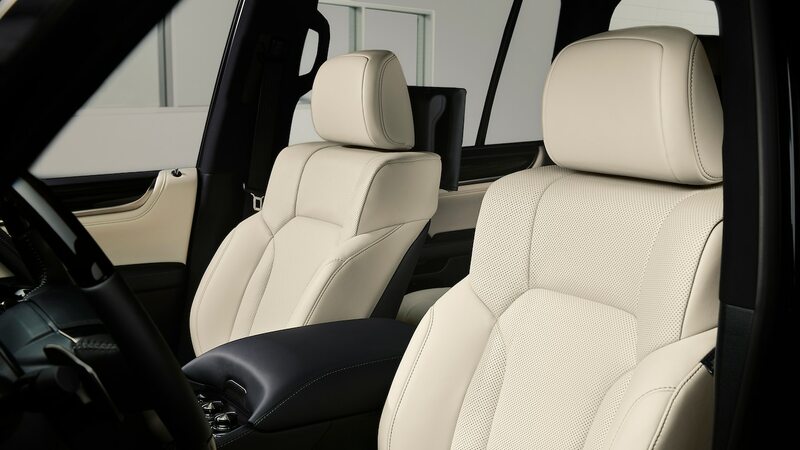 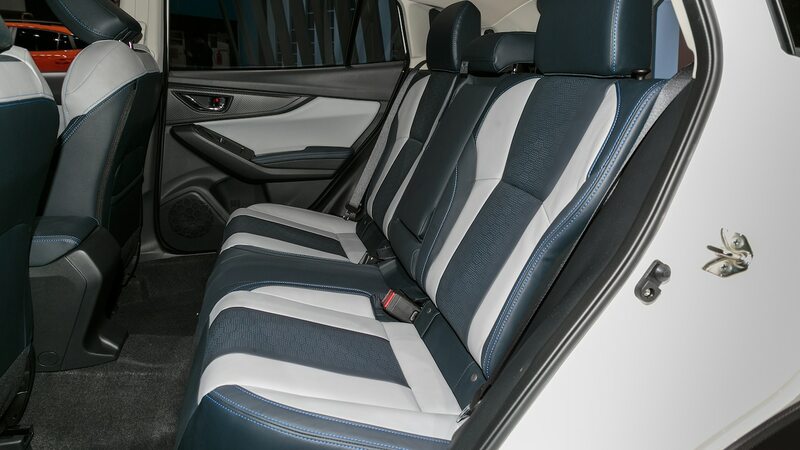 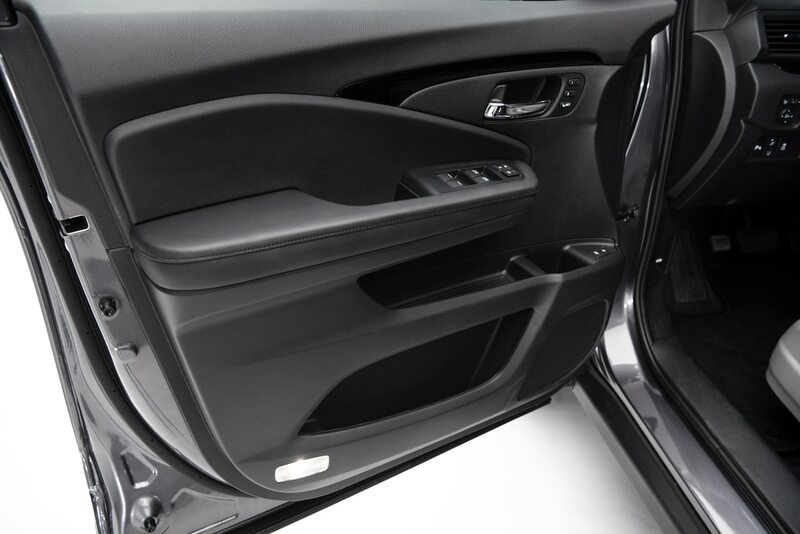 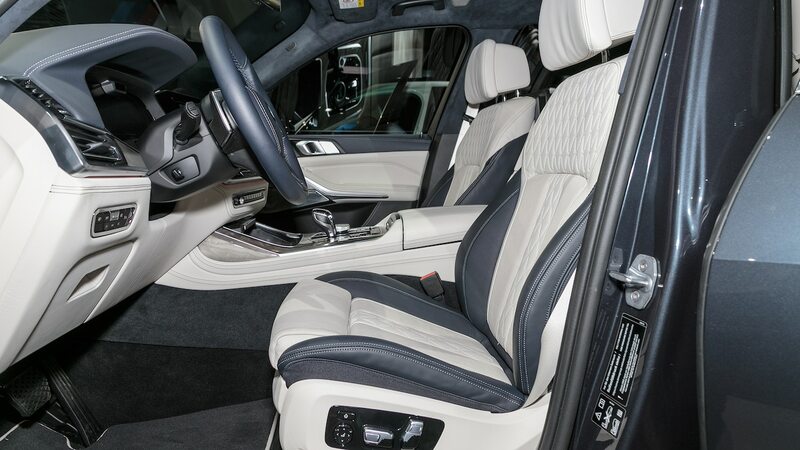 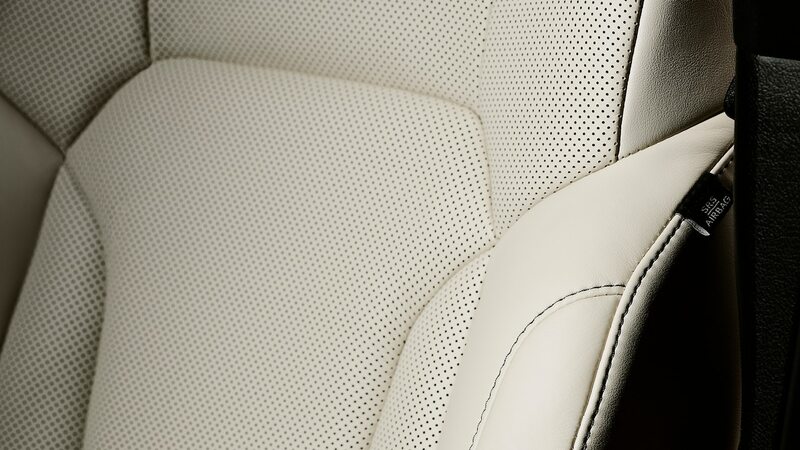 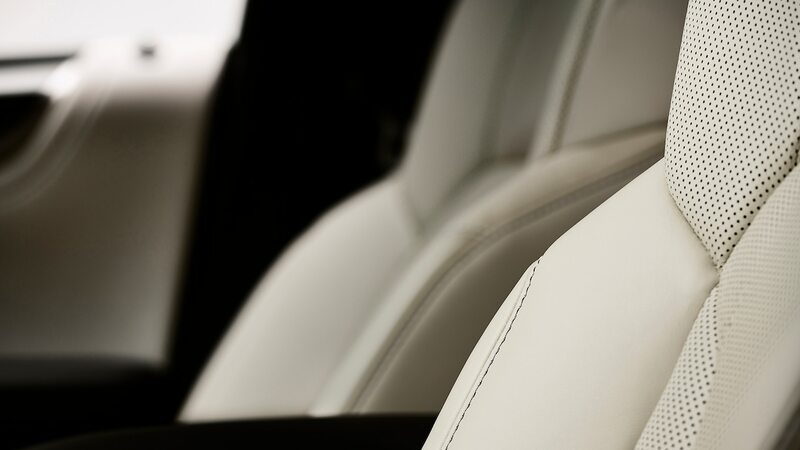 Inside, the headliner is black, but seating stands out in white leather. 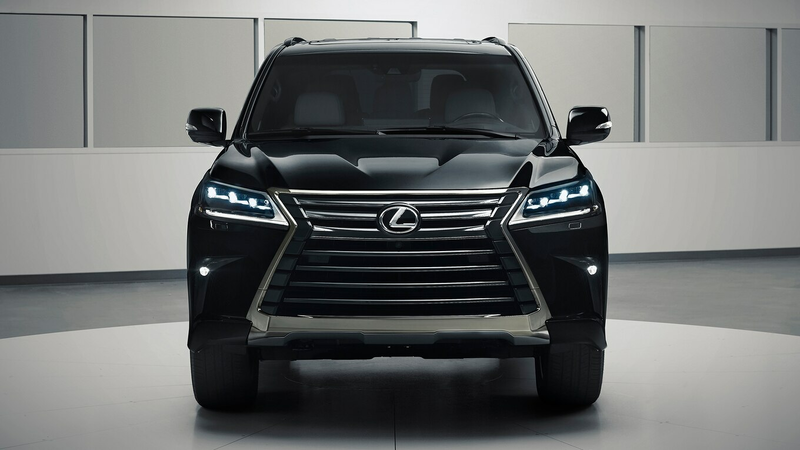 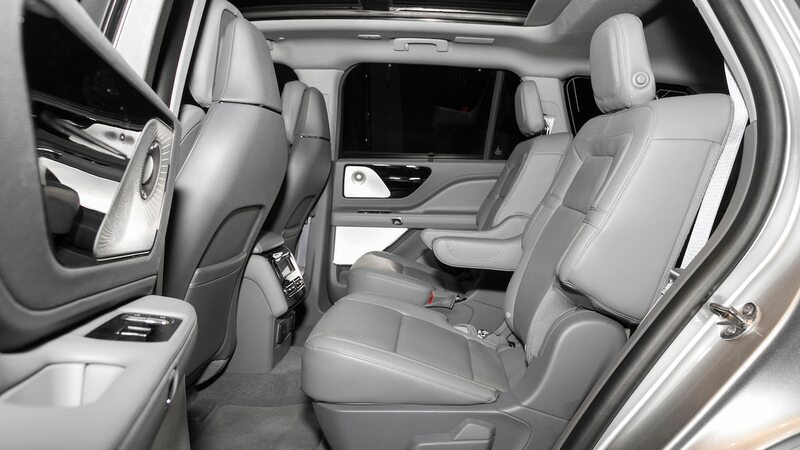 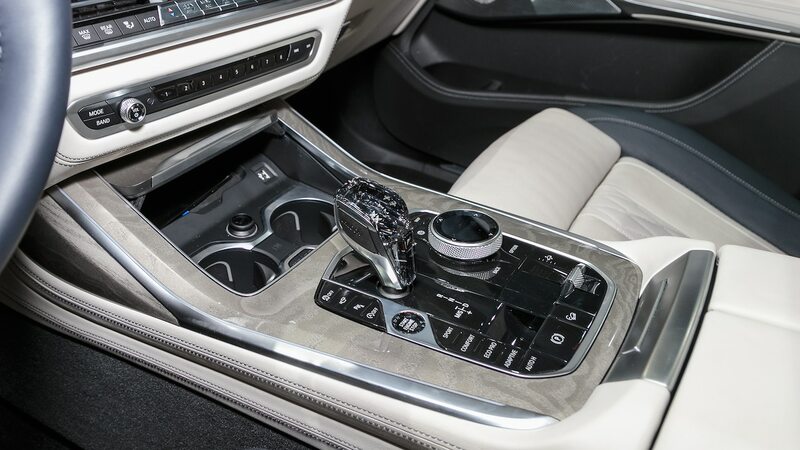 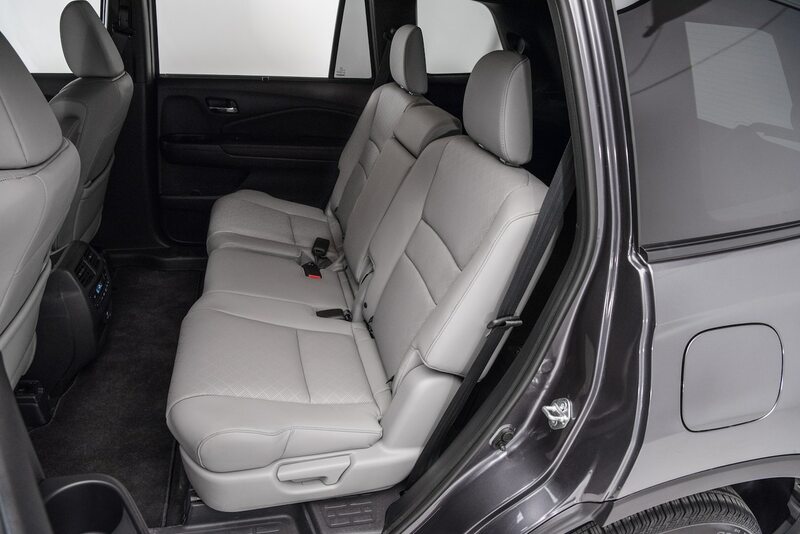 Luxury is plentiful: The Inspiration comes with heated and ventilated seats, a rear-seat entertainment package, a head-up display, a refrigerated compartment under the center armrest, a wireless phone charger, and “LX” puddle lights. 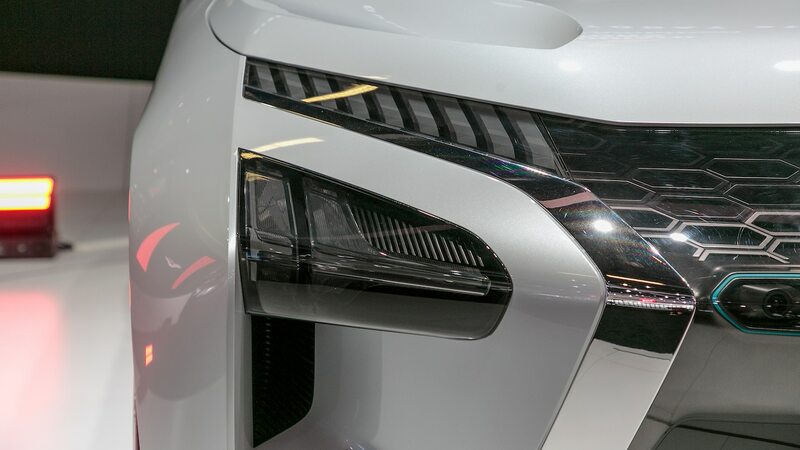 Only 500 examples will be produced. 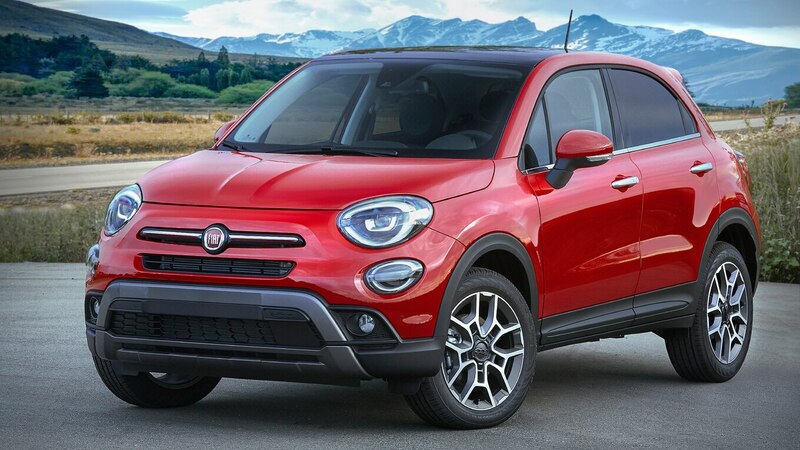 The 500X gets big updates for the 2019 model year including a new 1.3-liter turbocharged engine good for 177 hp and a healthy 210 lb-ft. Fiat also revised the front and rear fascia, LED daytime running lights, and taillights. 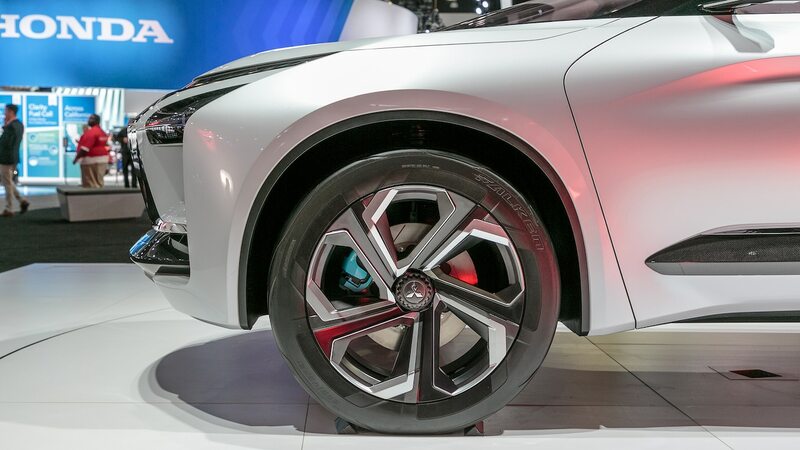 Three new wheel designs and exterior paint colors have also been added. 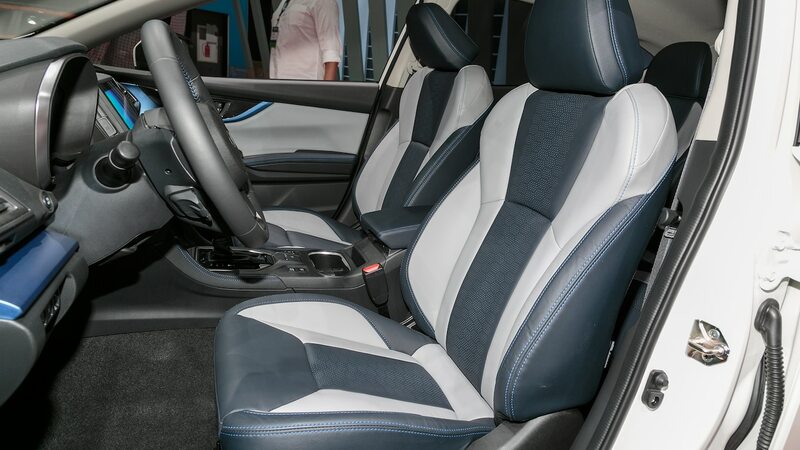 In the cabin, the 500X receives new premium seating fabric and a redesigned steering wheel and instrument panel gauges. 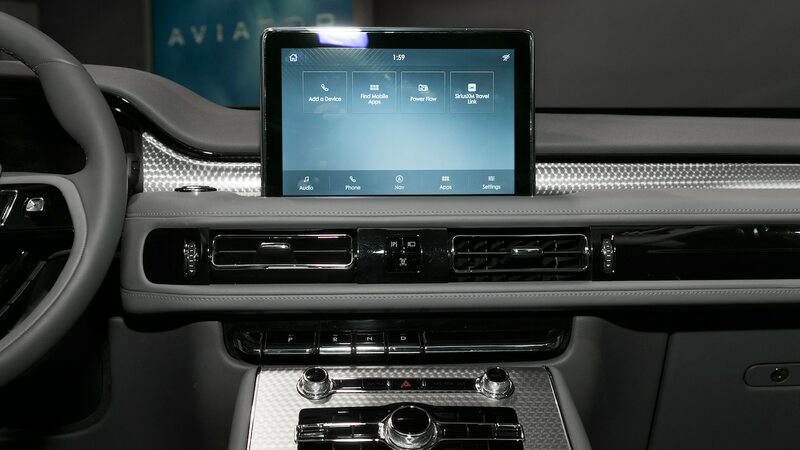 Standard tech includes a 7.0-inch touchscreen with Apple CarPlay, Android Auto, navigation, and SiriusXM satellite radio. 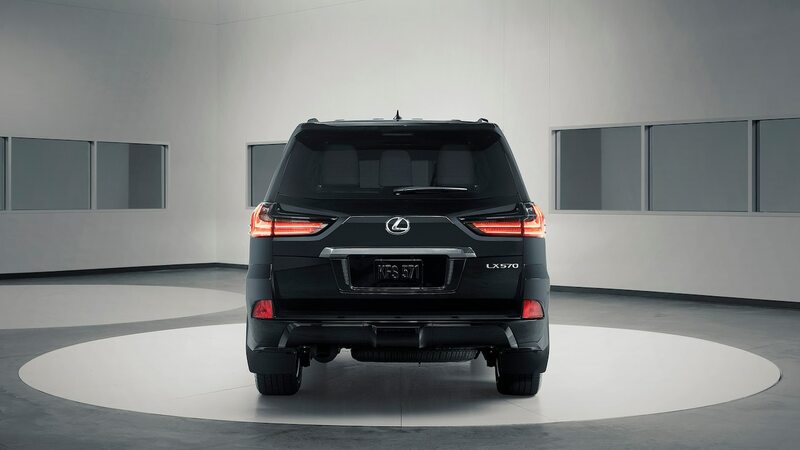 Adaptive cruise control and front parking sensors are new for 2019. 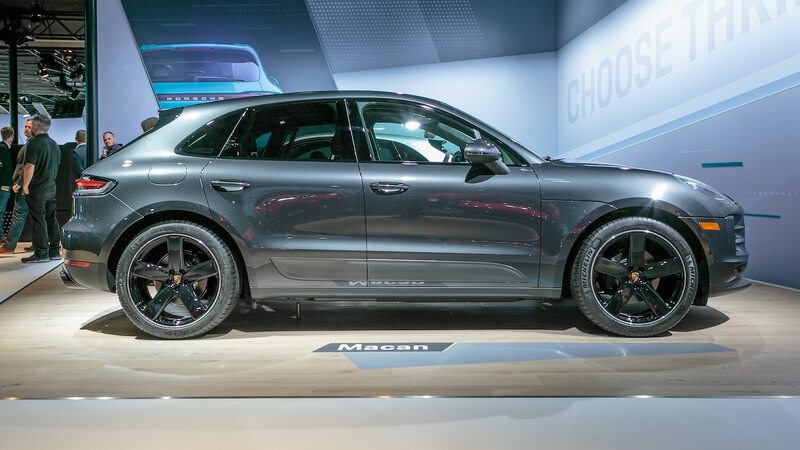 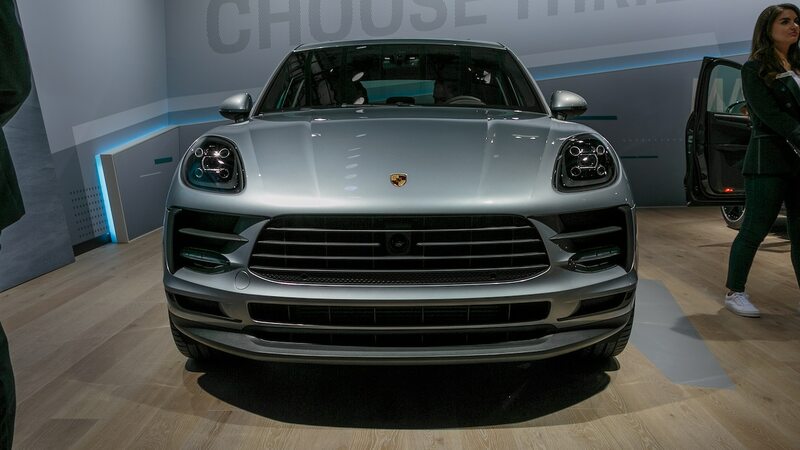 The refreshed Macan makes its U.S. debut at the L.A. auto show showing off its revised front and rear ends and restyled headlights and taillights. 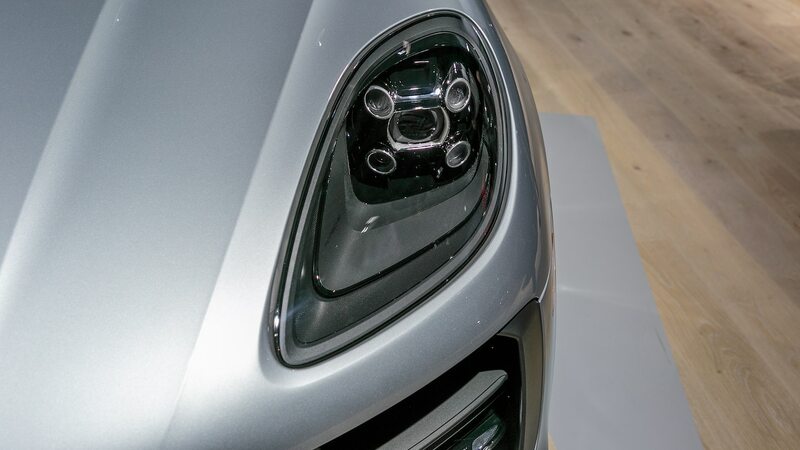 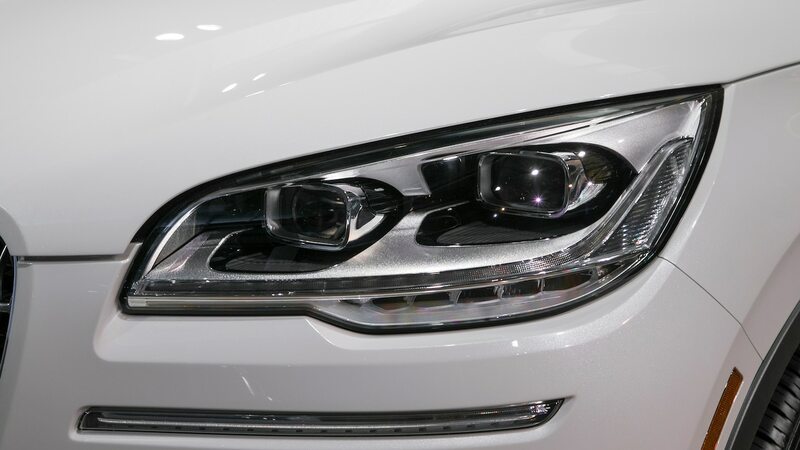 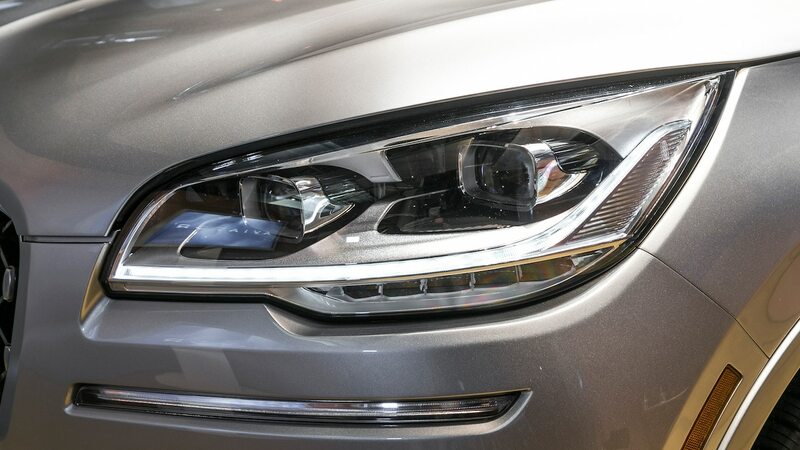 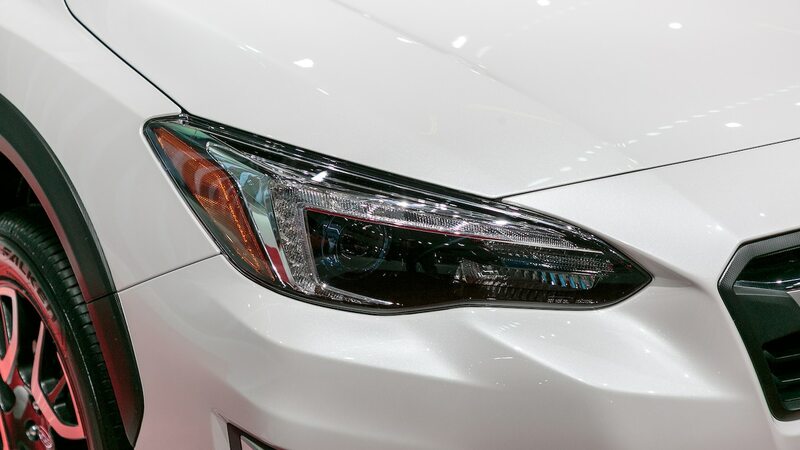 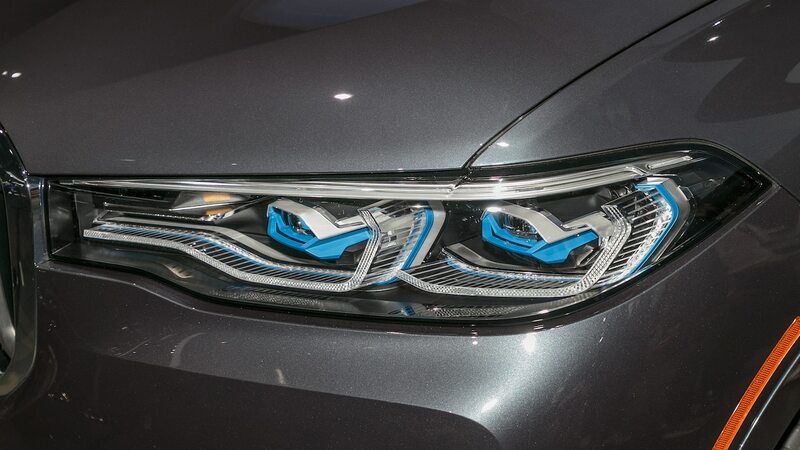 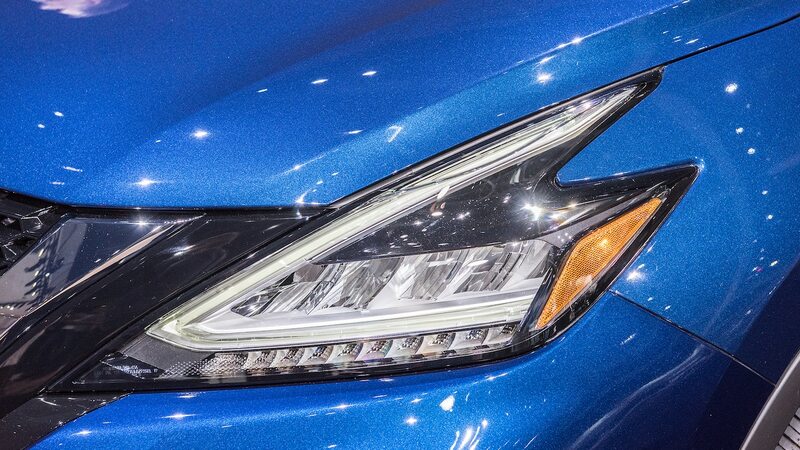 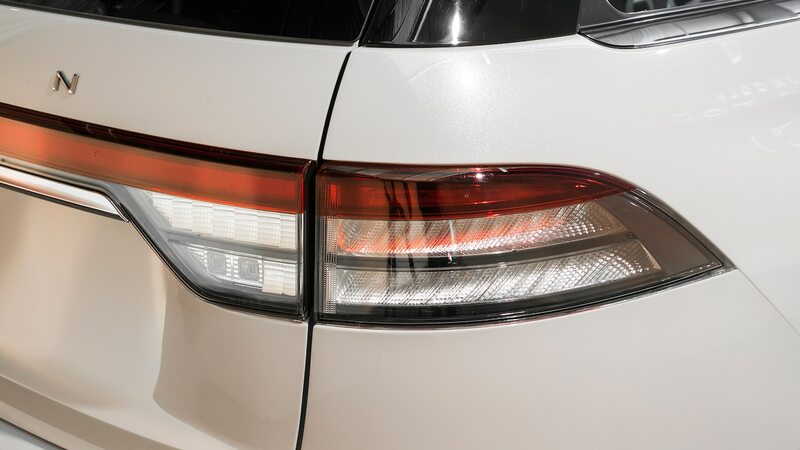 LED headlights are now standard. 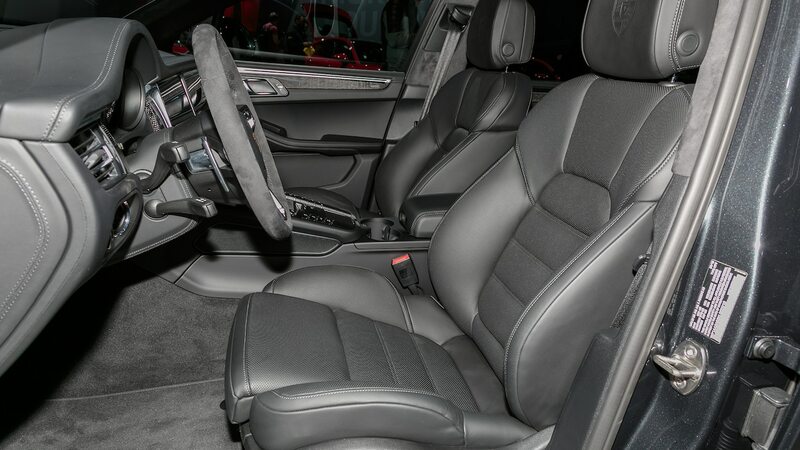 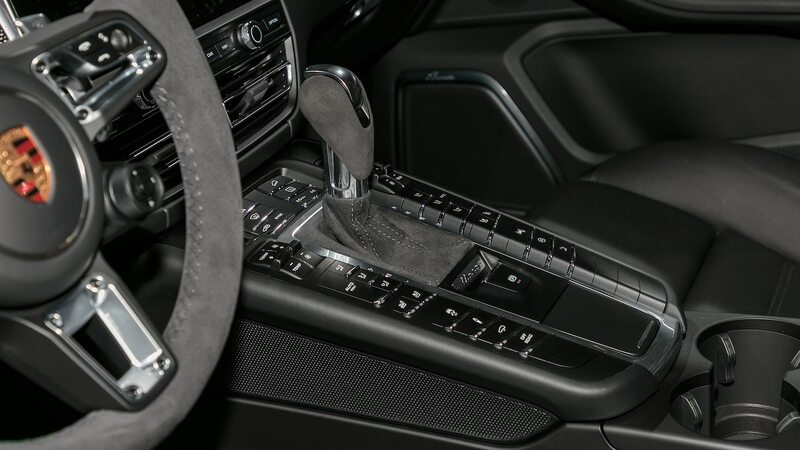 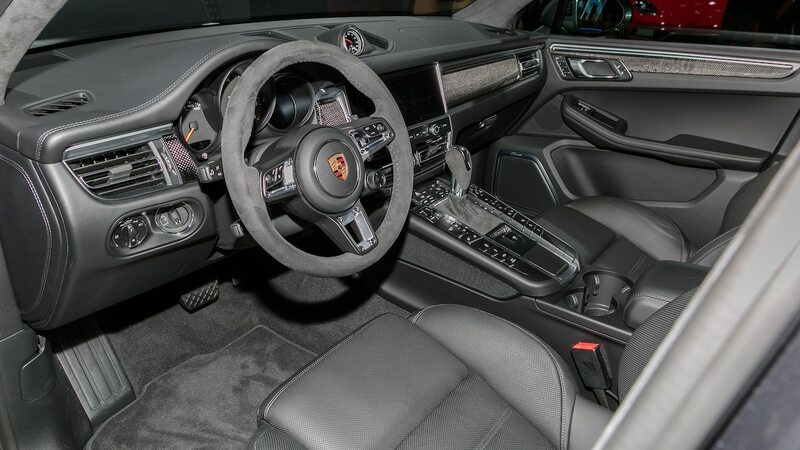 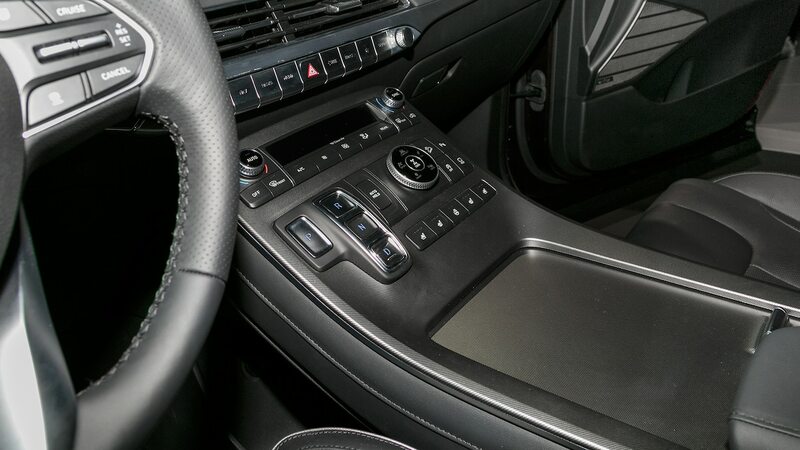 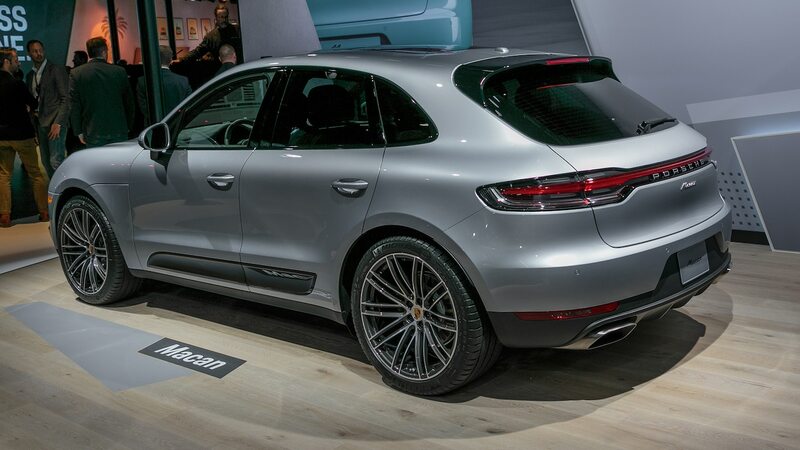 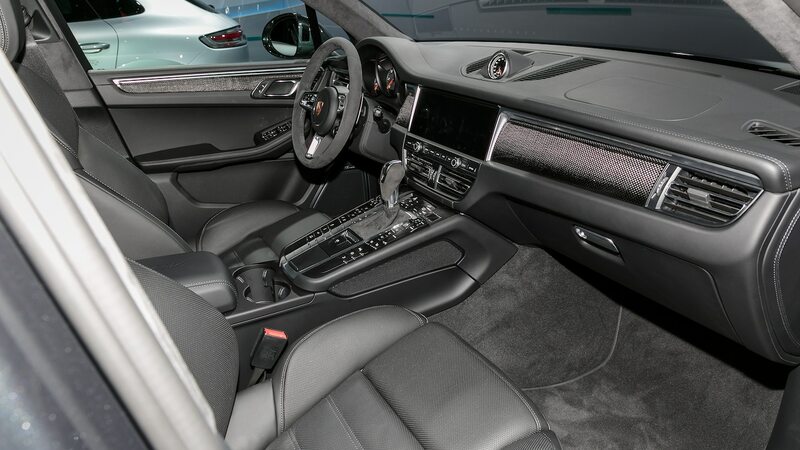 The cabin features the Macan’s new 10.9-inch touchscreen, redesigned dash and center stack, and an updated Porsche Communication Management (PCM) infotainment system. 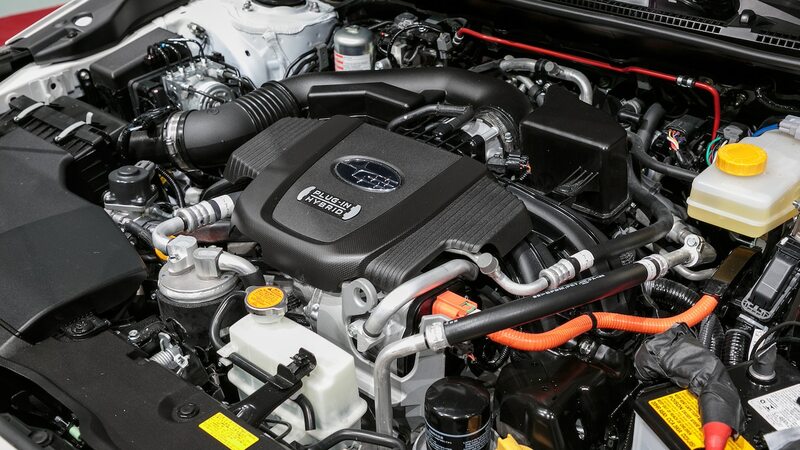 The standard engine is a 248-hp, 273-lb-ft 2.0-liter turbo-four backed by a seven-speed twin-clutch automatic. 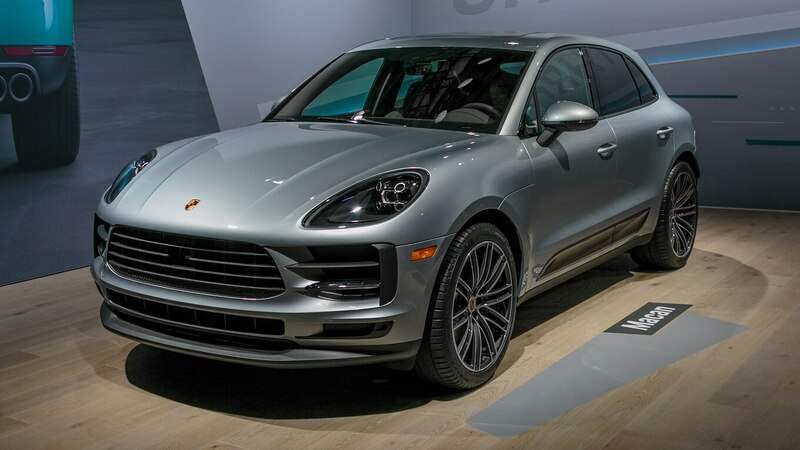 With that engine, Porsche claims a 0–60 time of 6.3 seconds and 6.1 seconds with the optional Sport Chromo package. 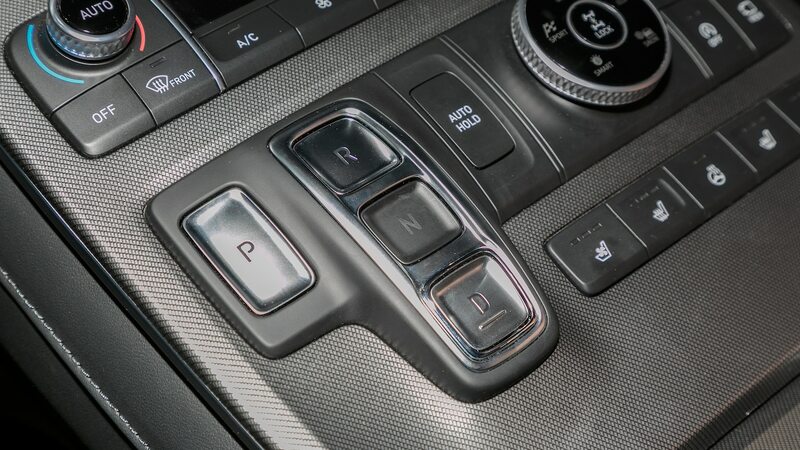 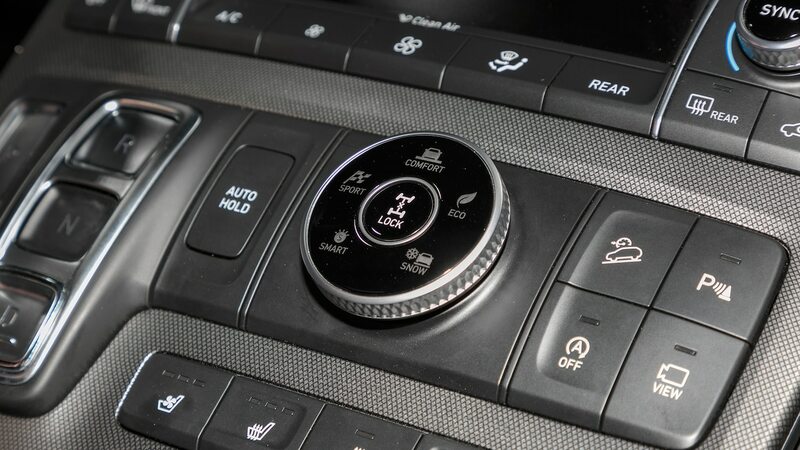 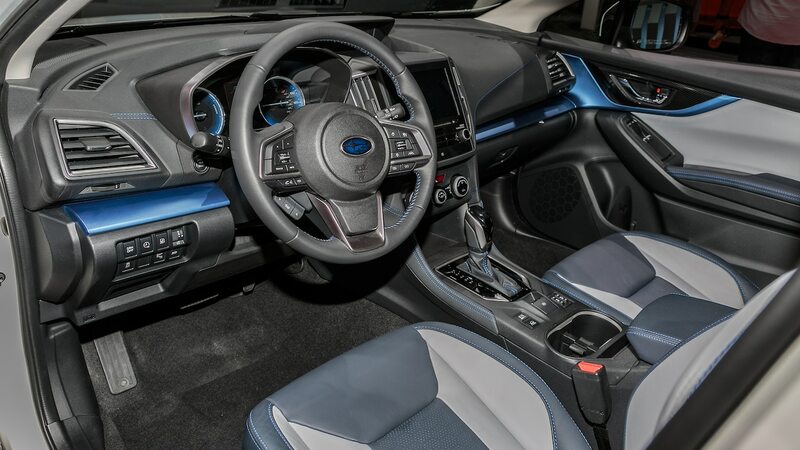 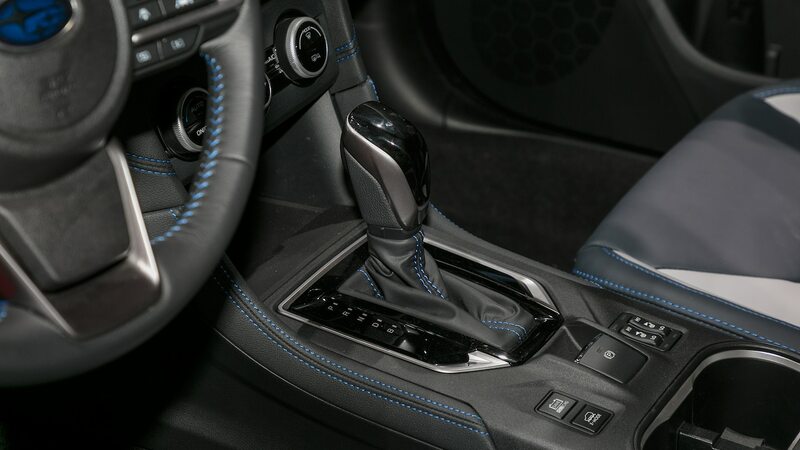 New optional features include a GT Sport steering wheel, a drive mode switch integrated into the steering wheel, a heated steering wheel, and an air ionizer.